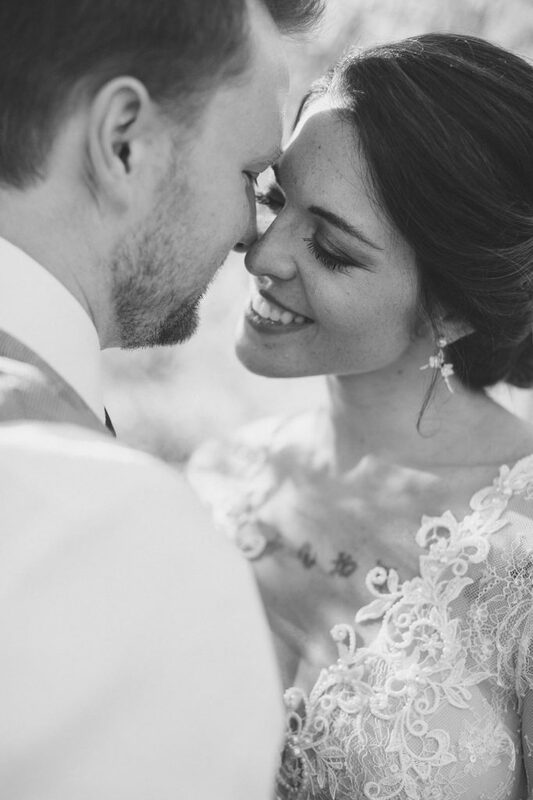 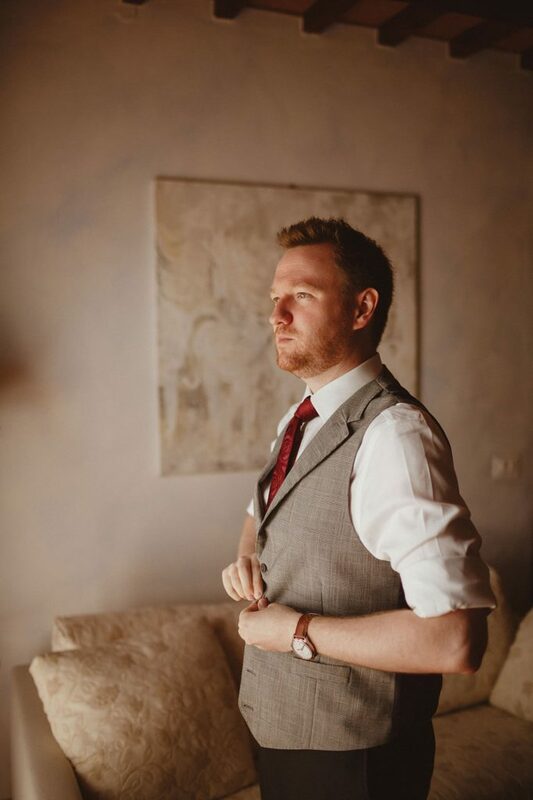 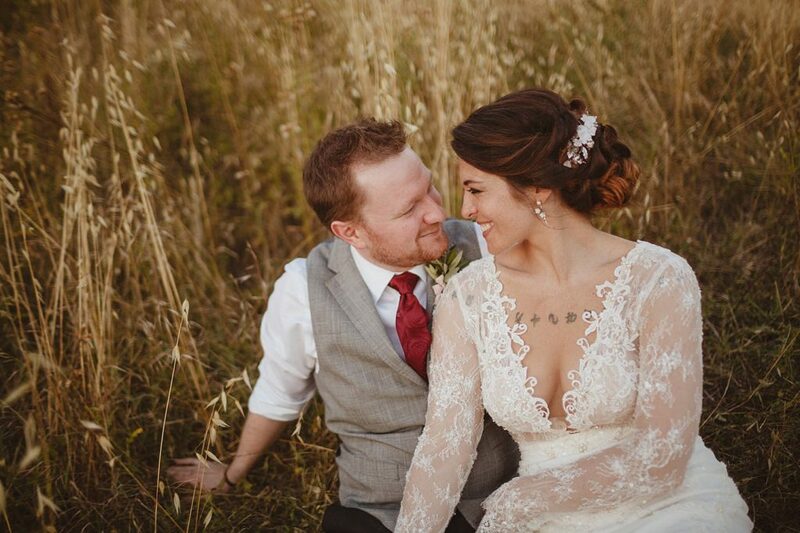 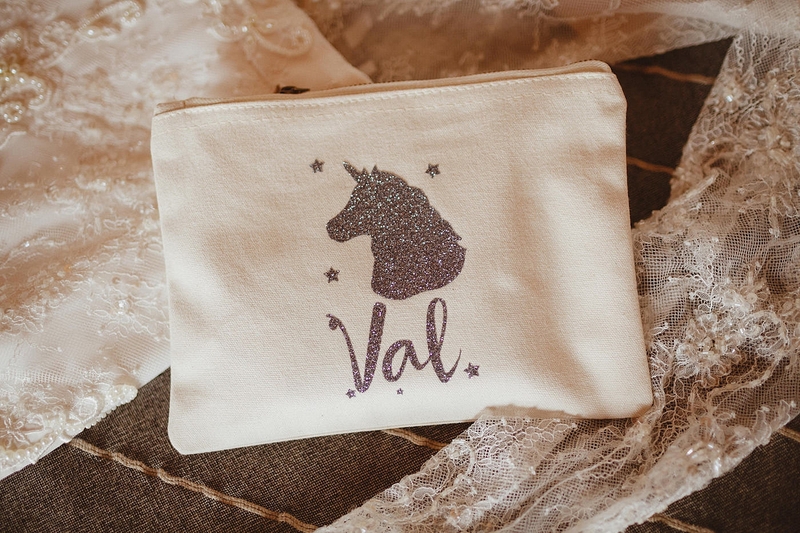 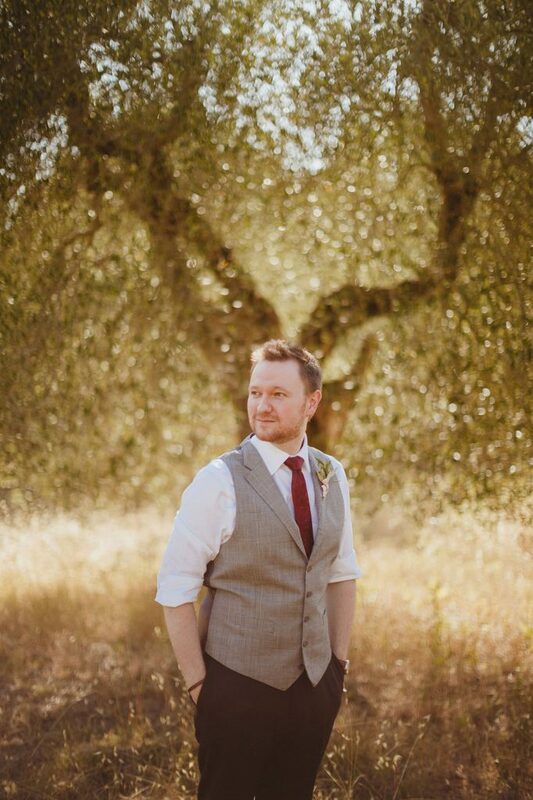 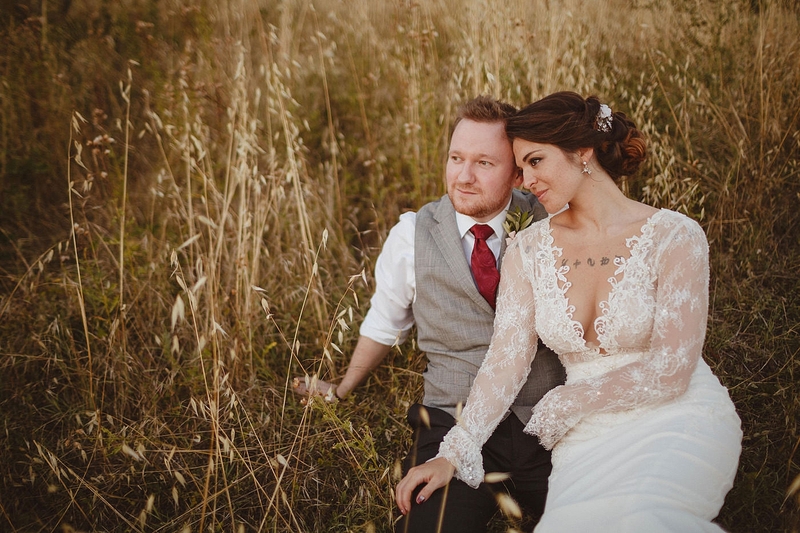 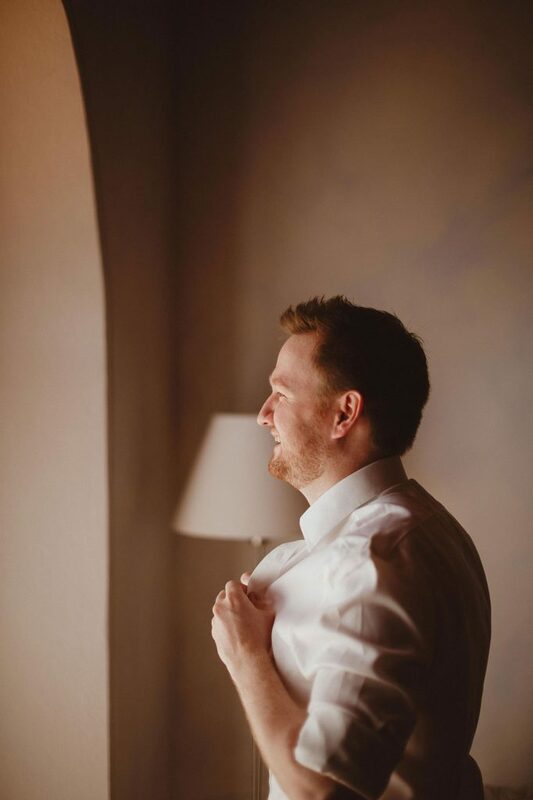 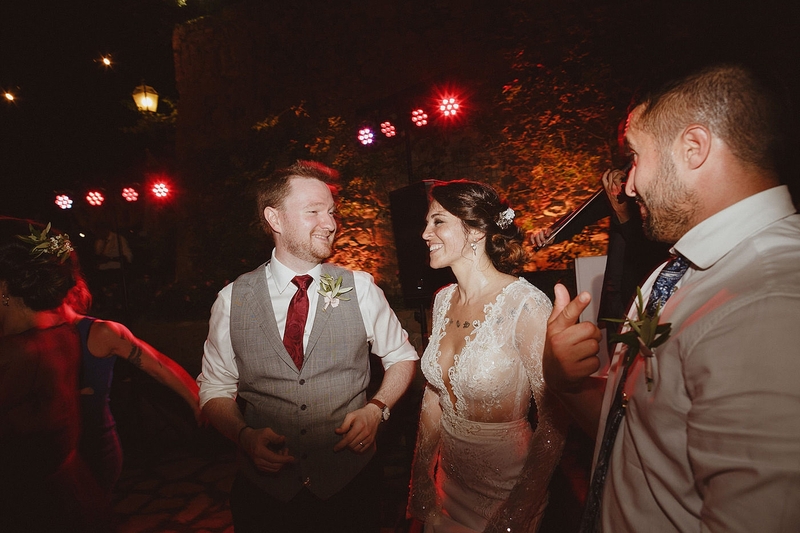 James and Valentina initially hired me to plan their UK wedding in August 2017. 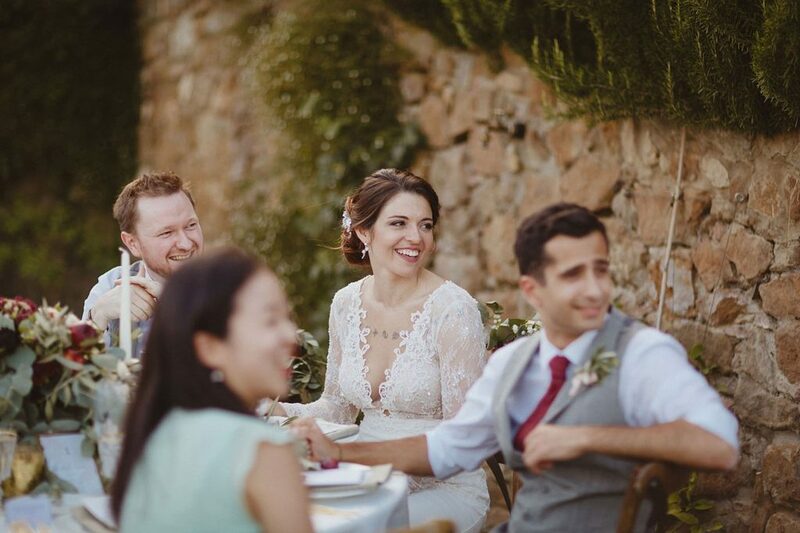 Sadly their original UK venue closed down, so we diverted our efforts to find a new venue to Italy, where Valentina is originally from. 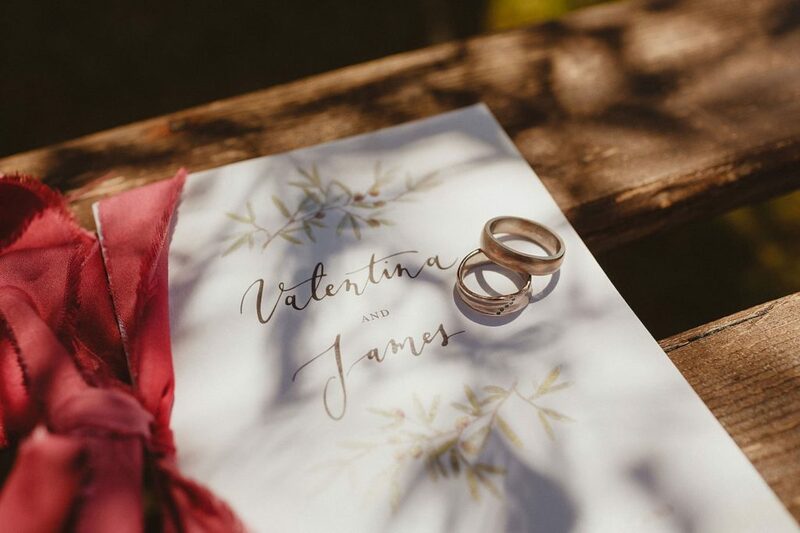 It took a little while for James and Valentina to come around to the idea, but now, without a shadow of a doubt, they feel it was possibly a blessing in disguise! 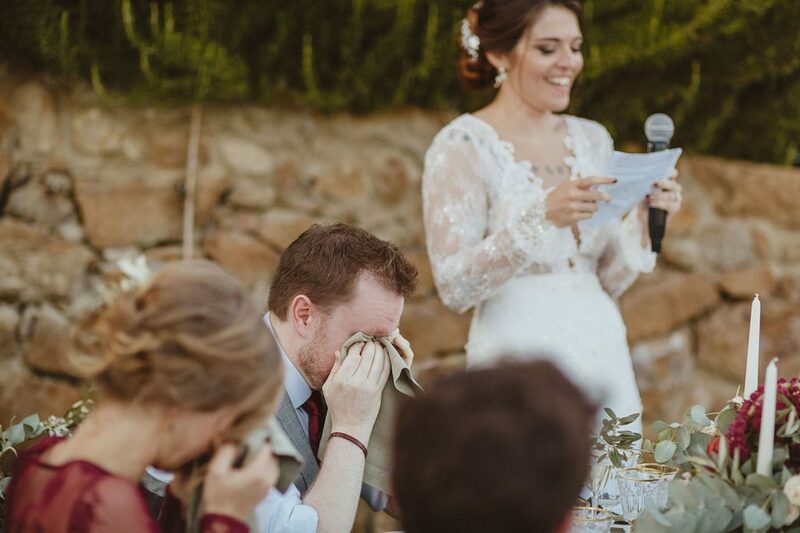 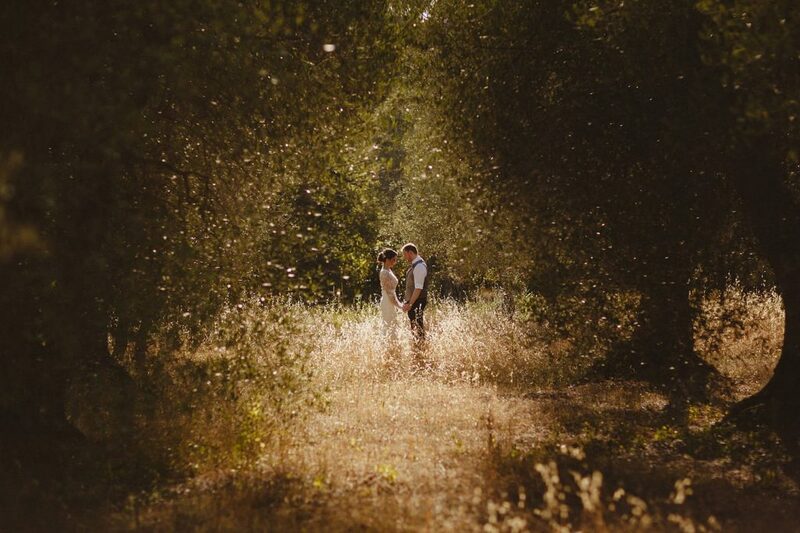 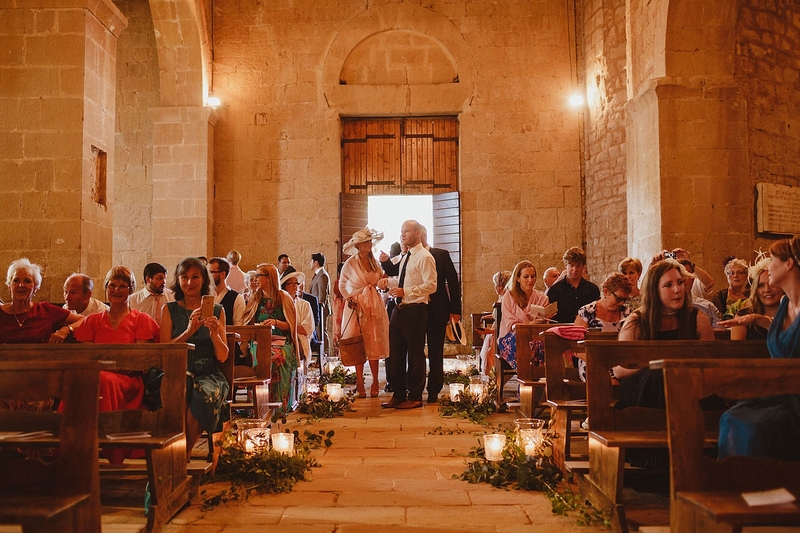 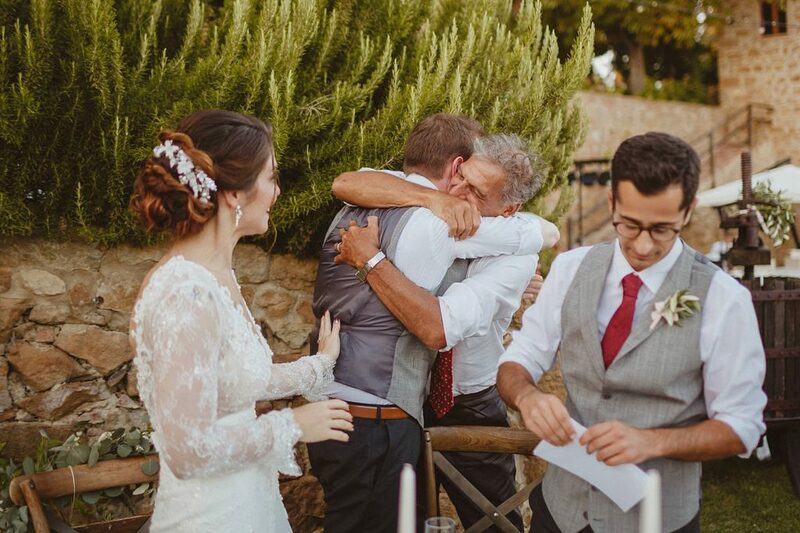 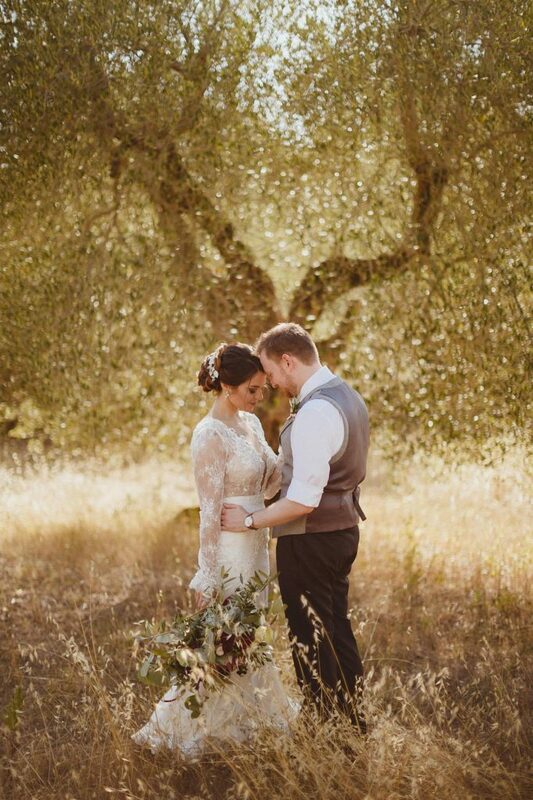 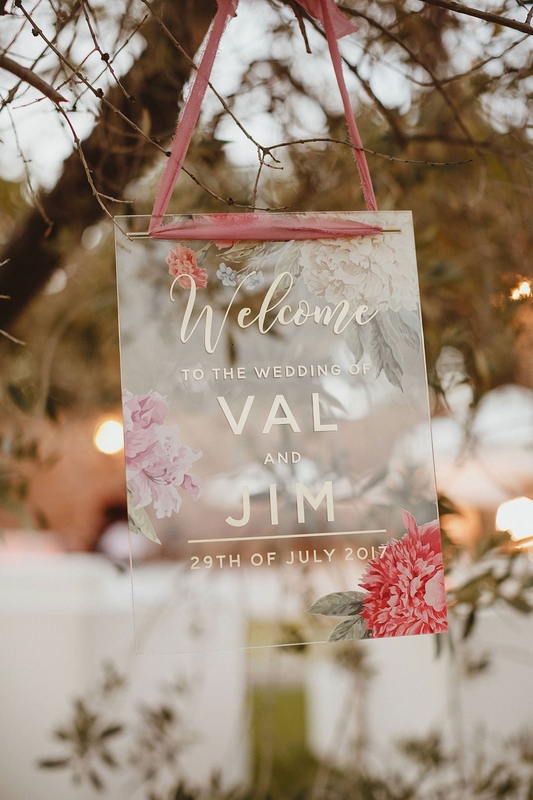 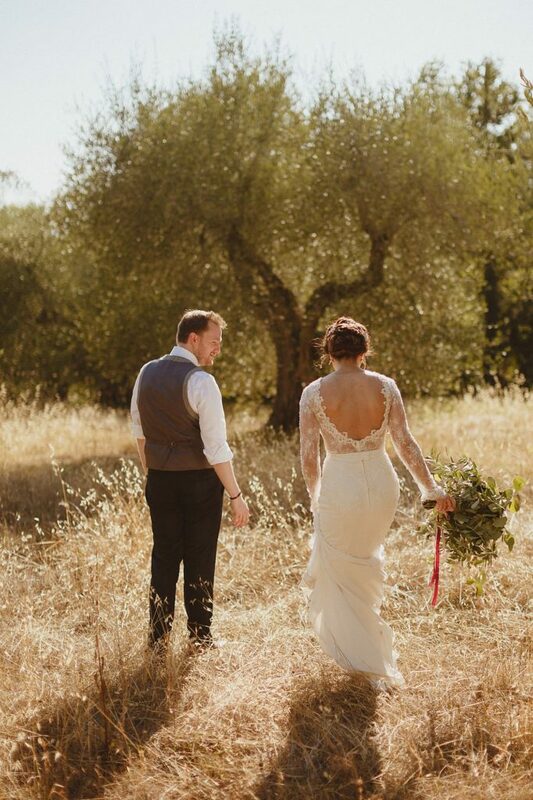 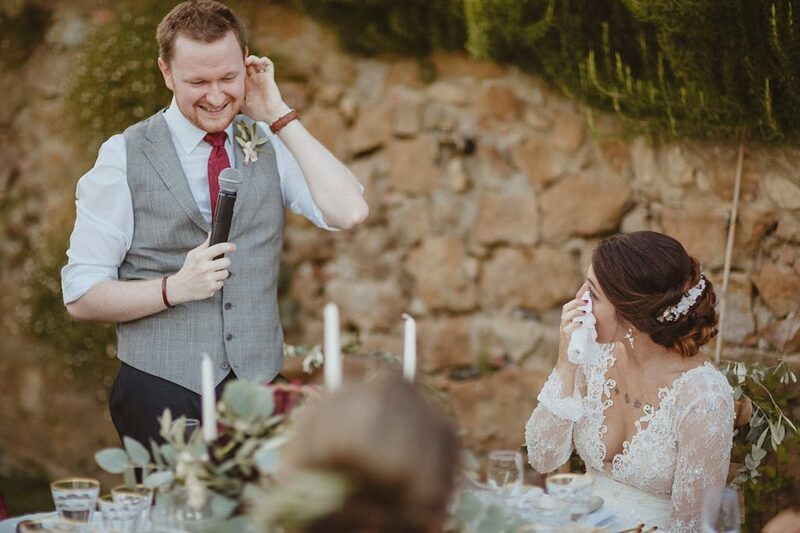 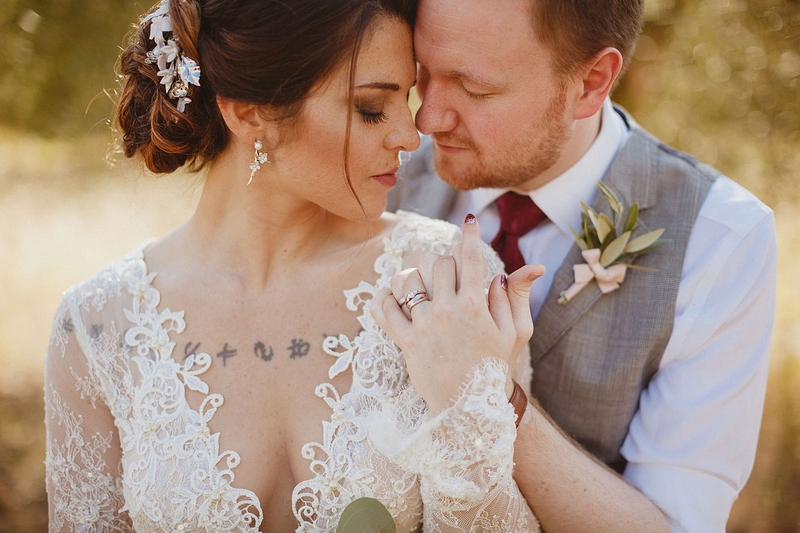 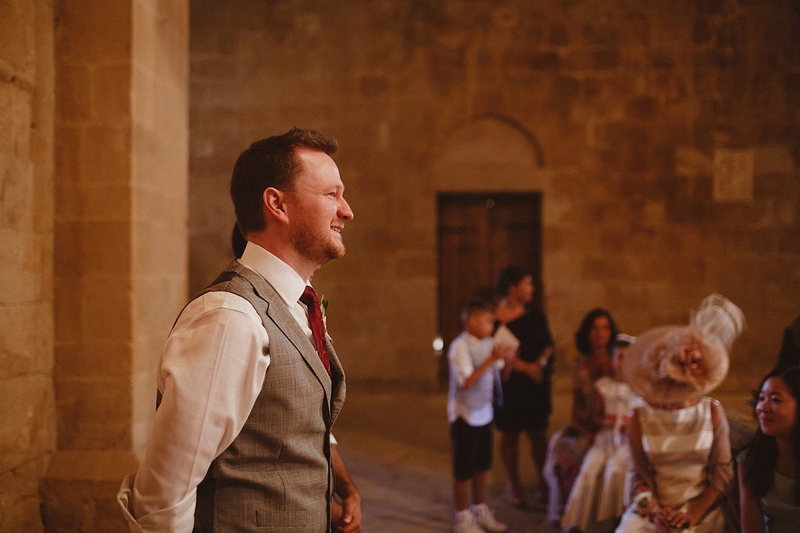 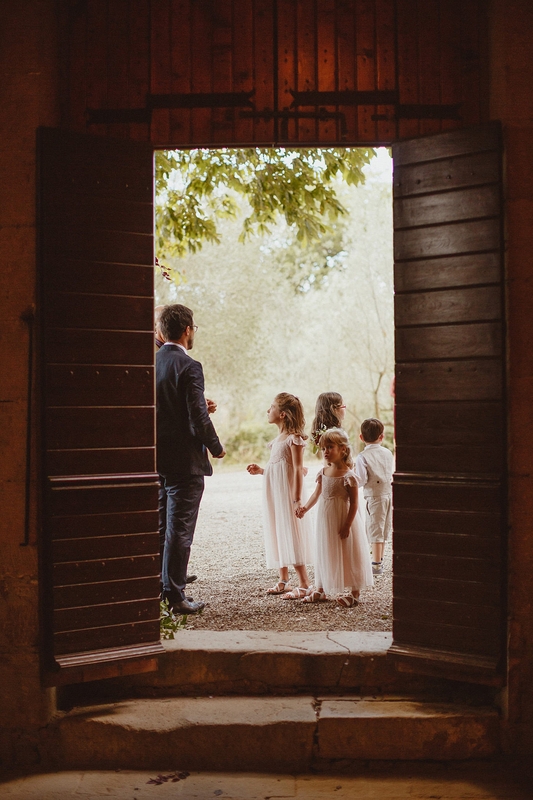 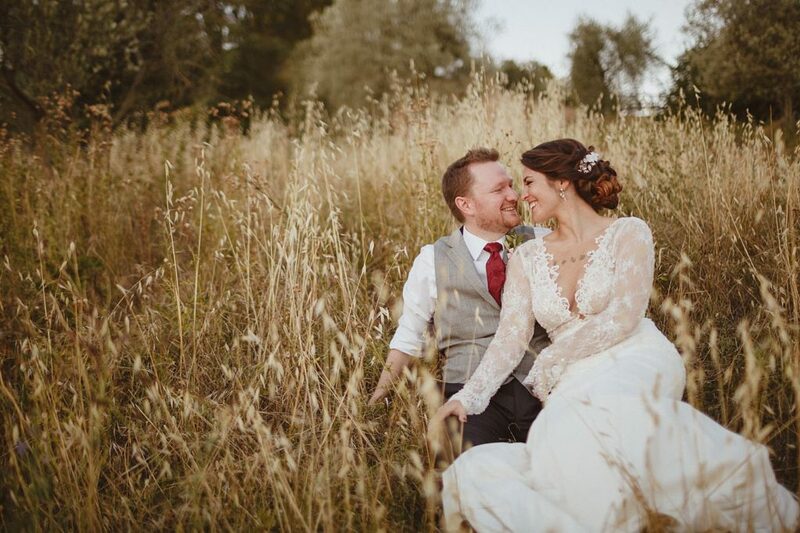 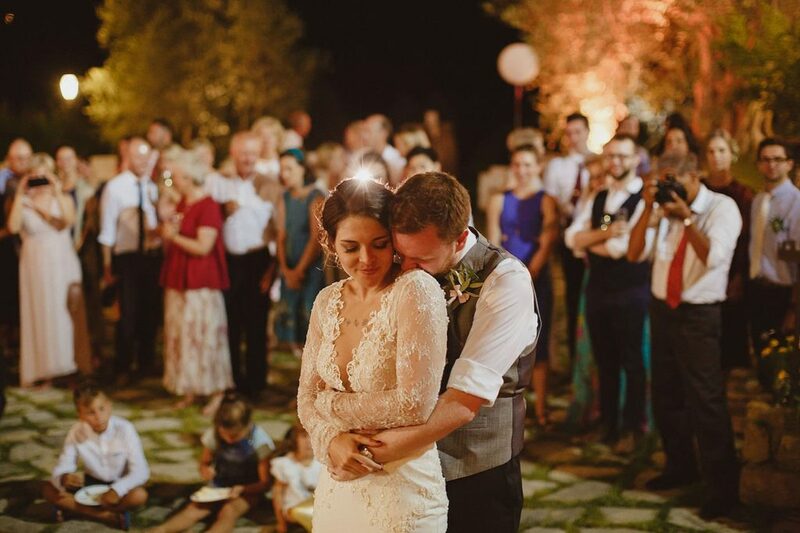 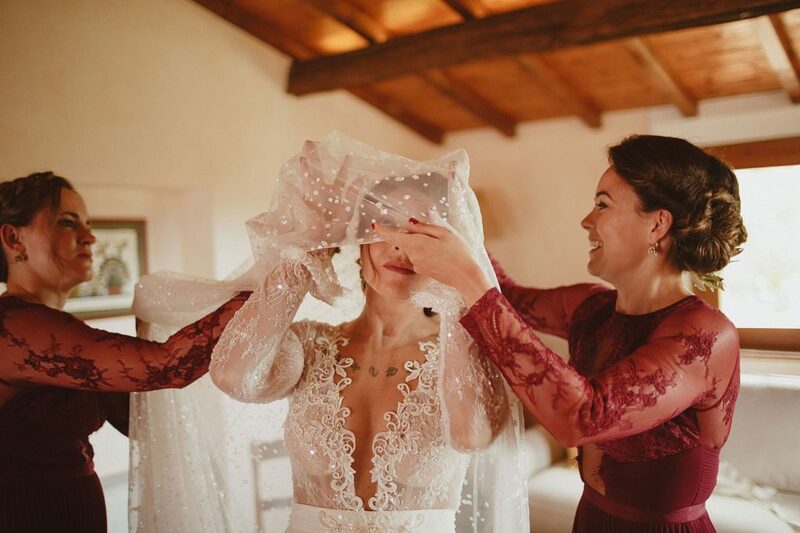 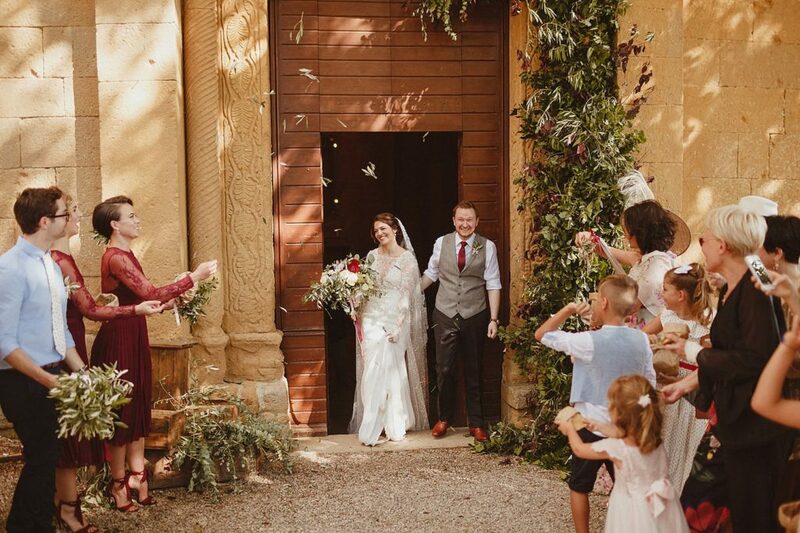 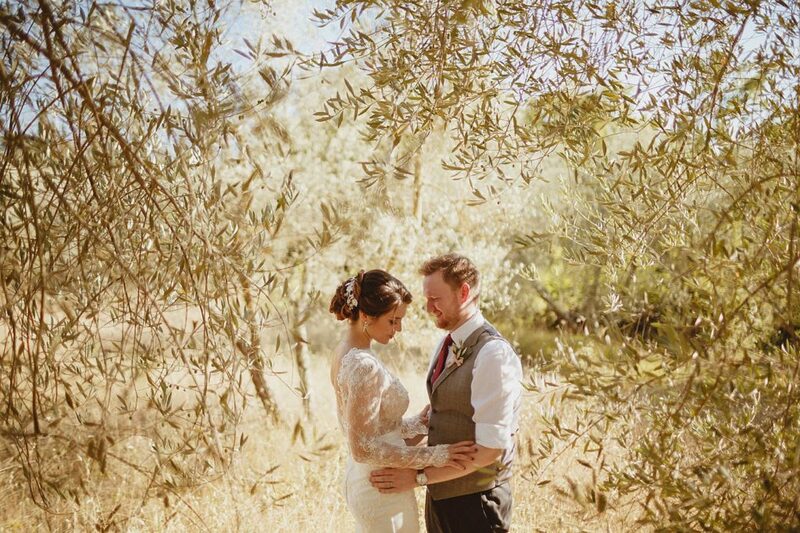 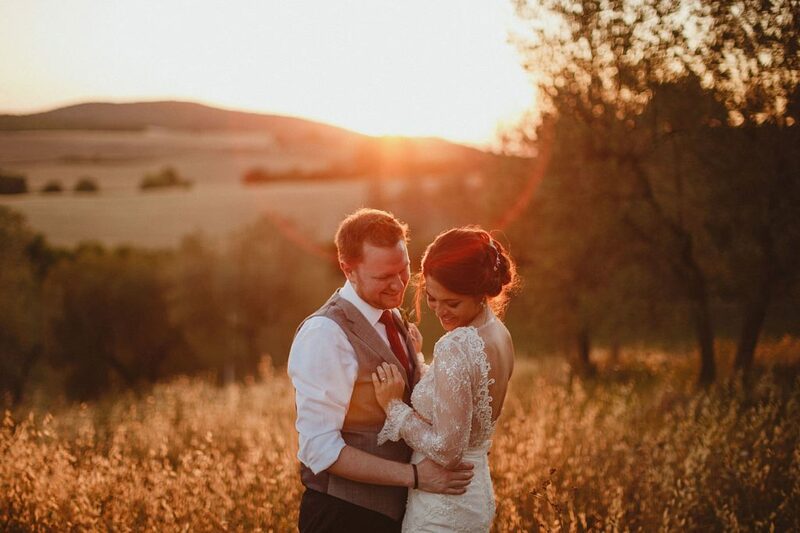 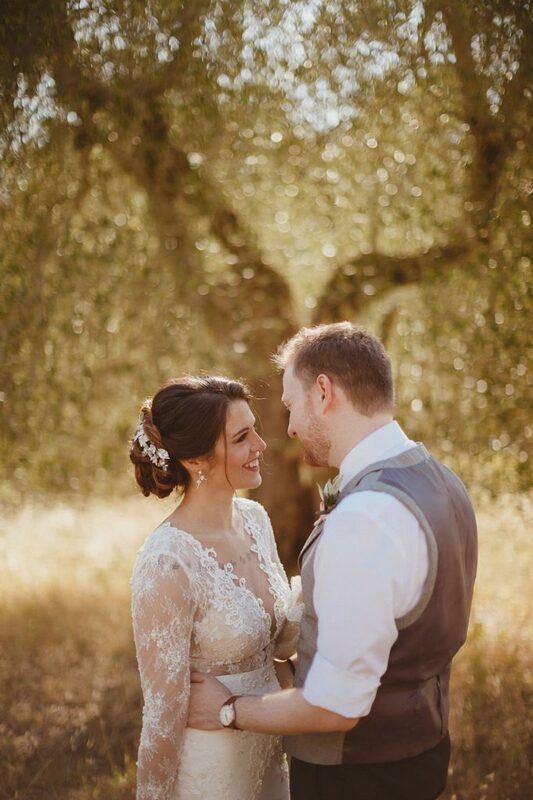 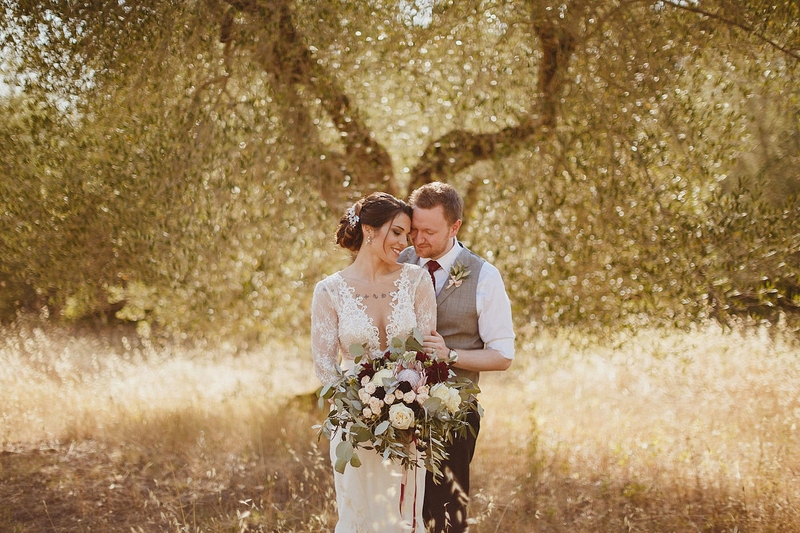 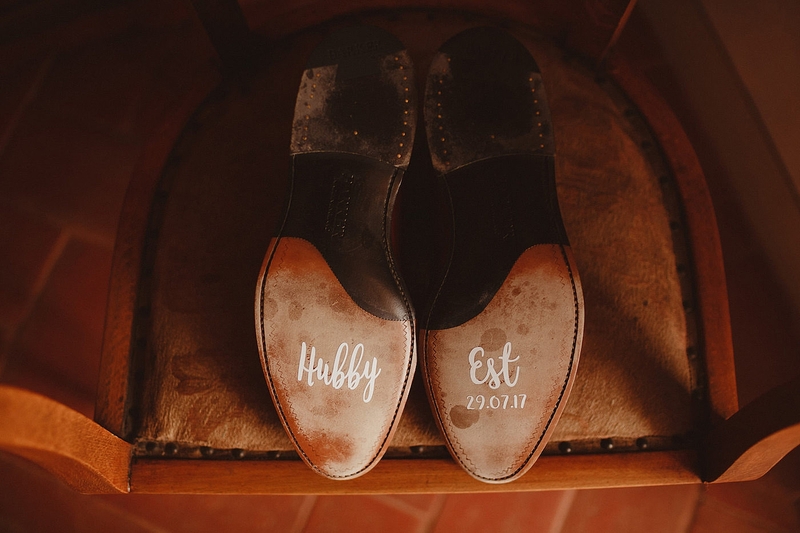 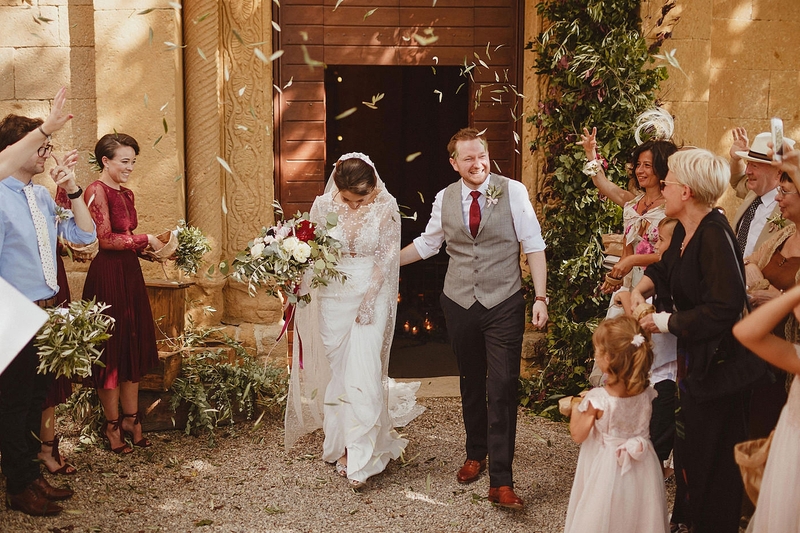 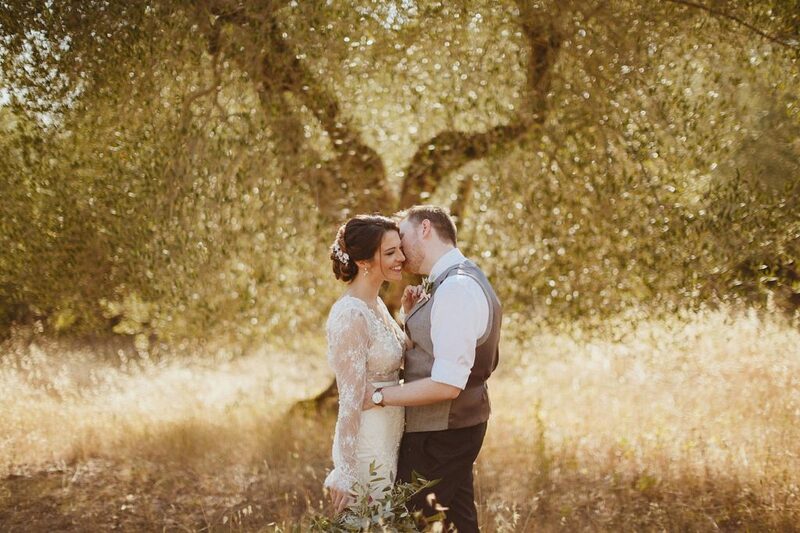 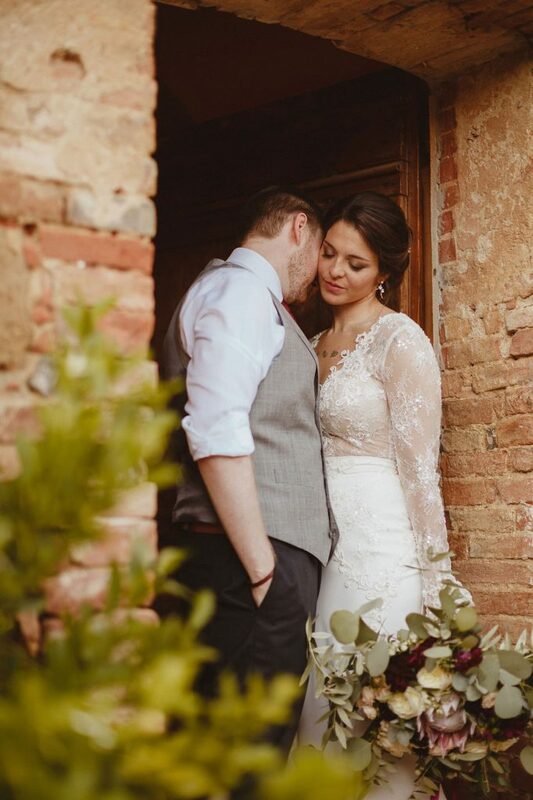 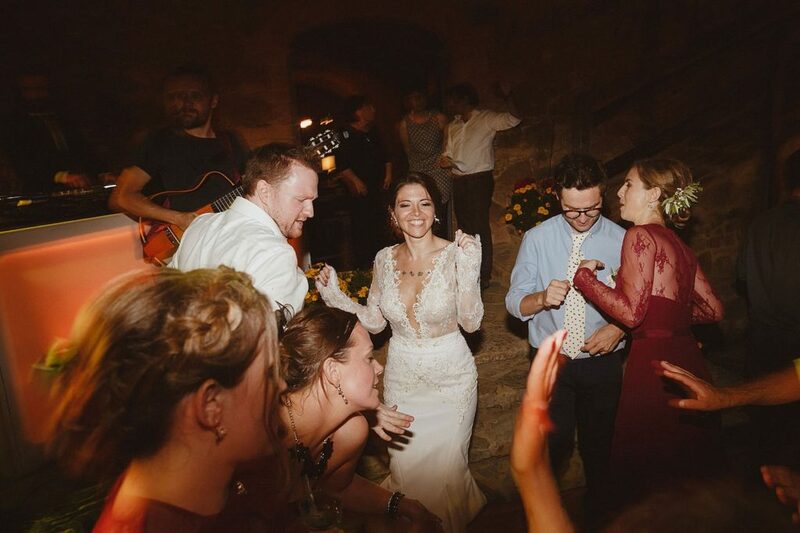 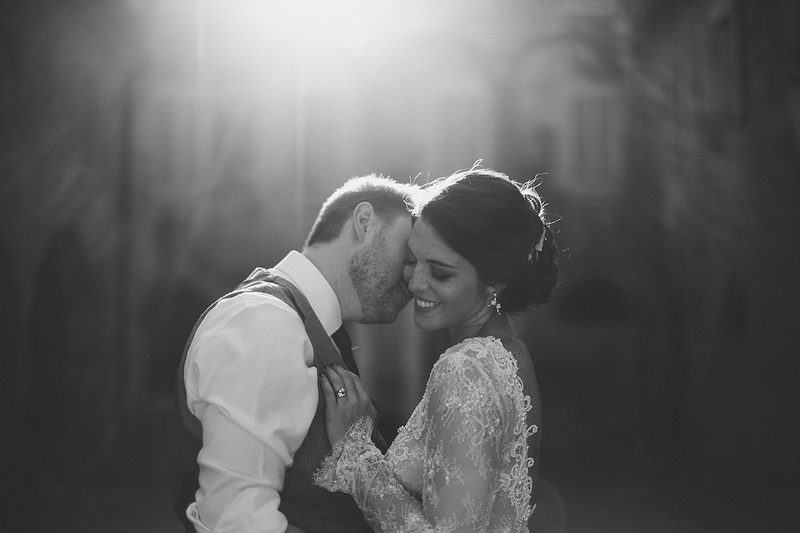 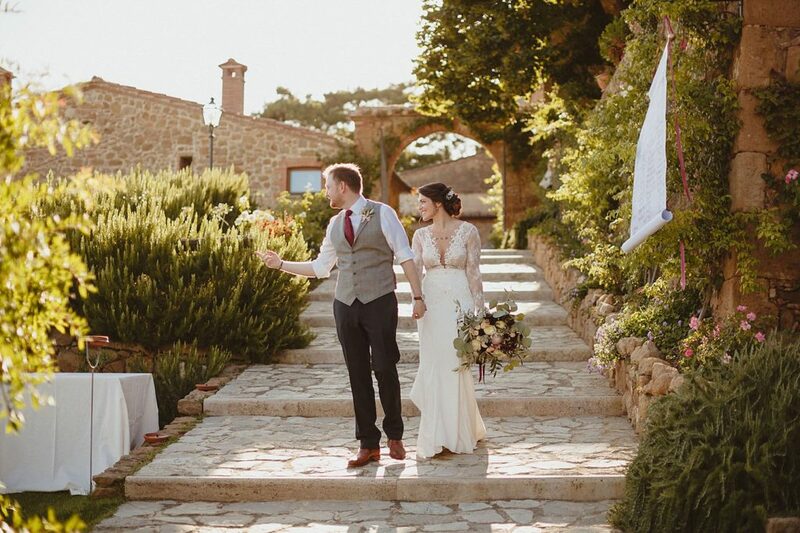 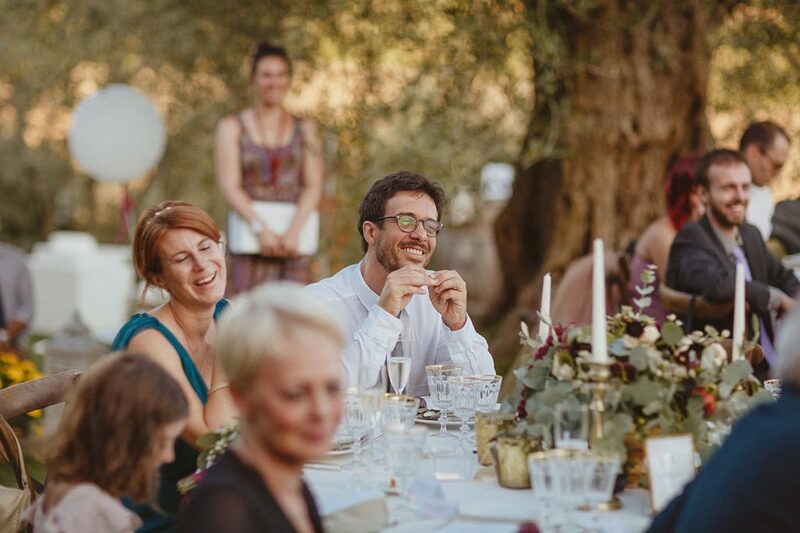 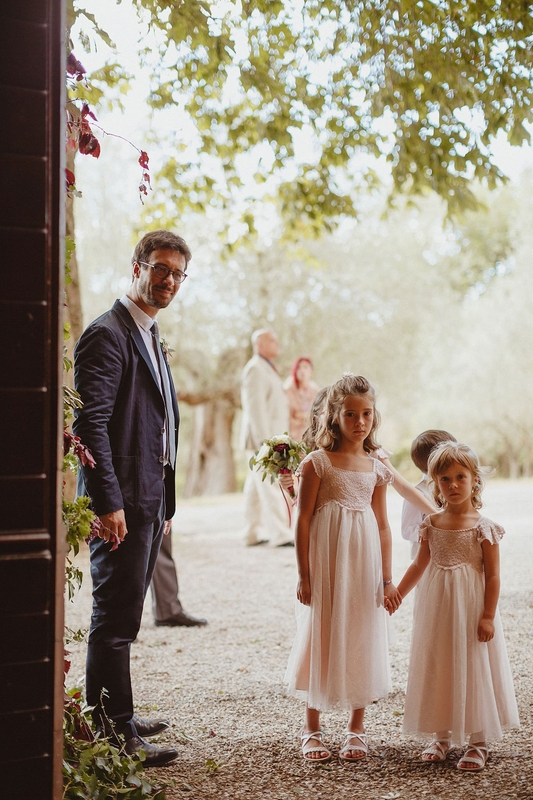 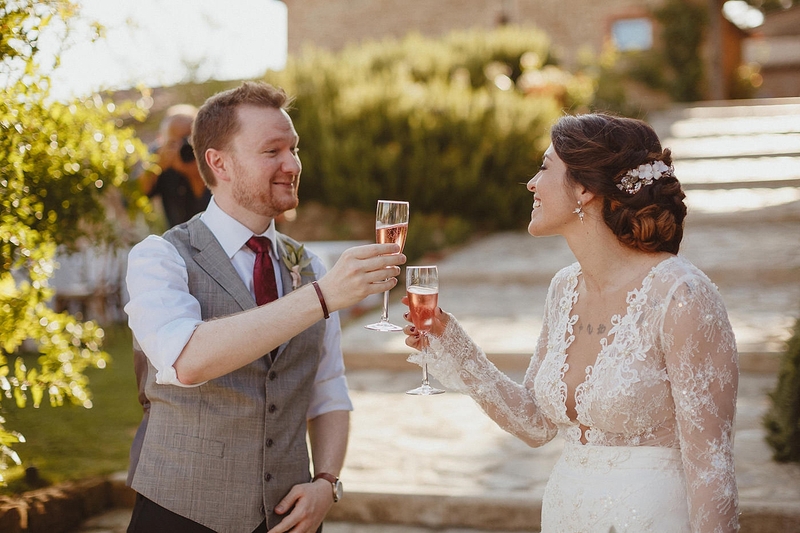 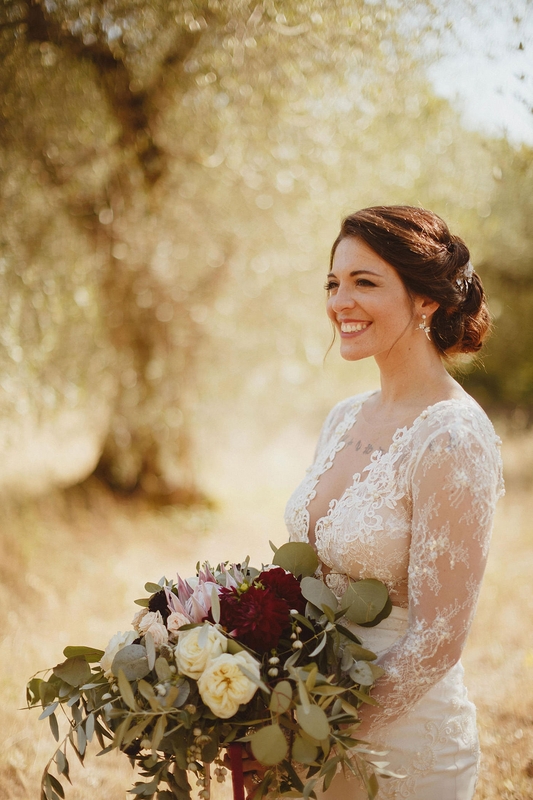 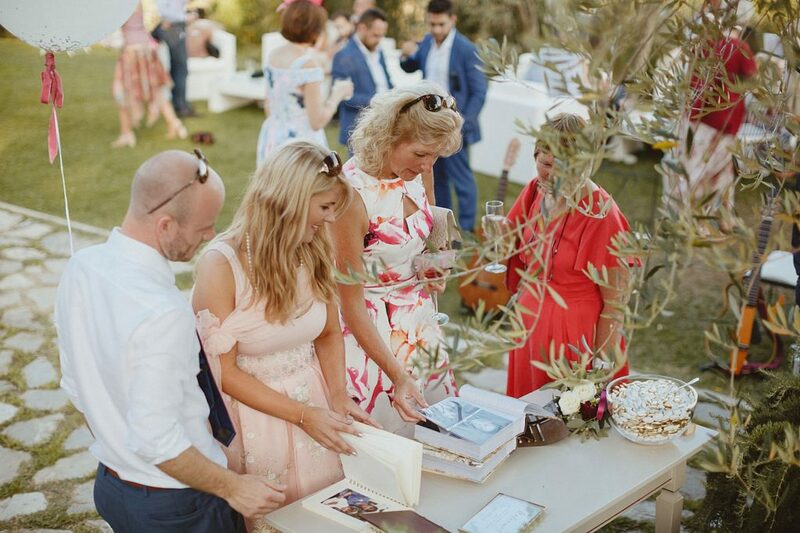 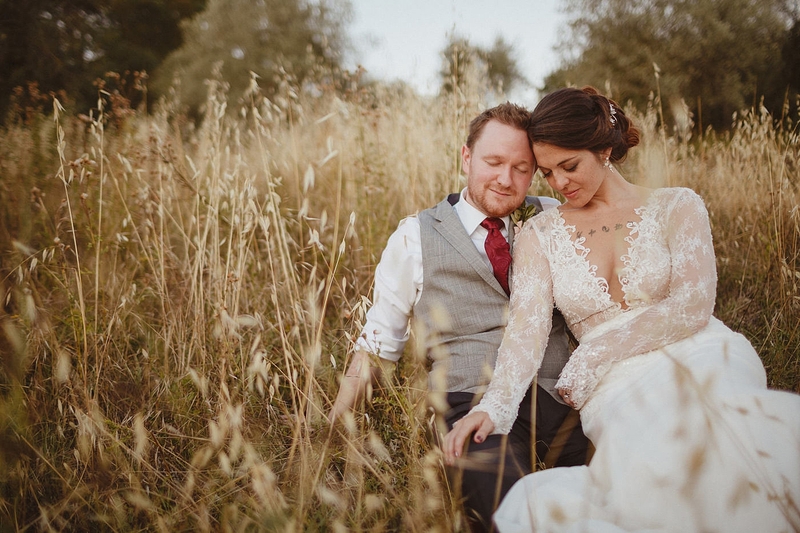 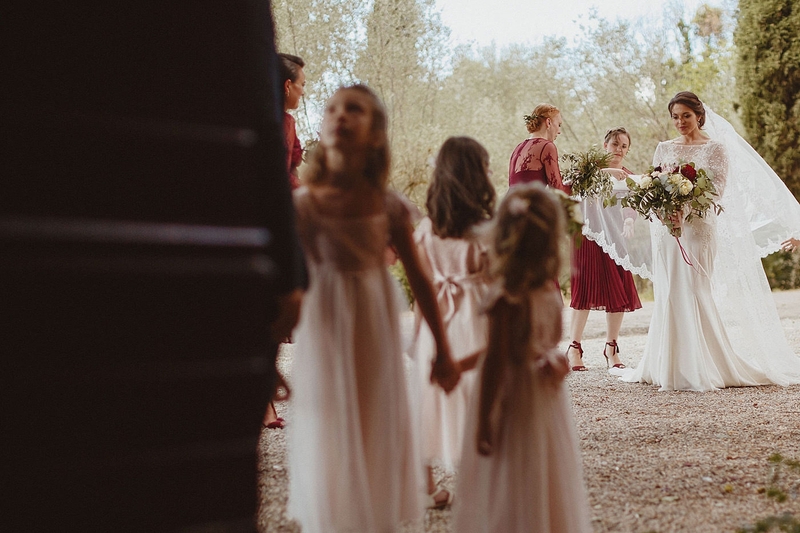 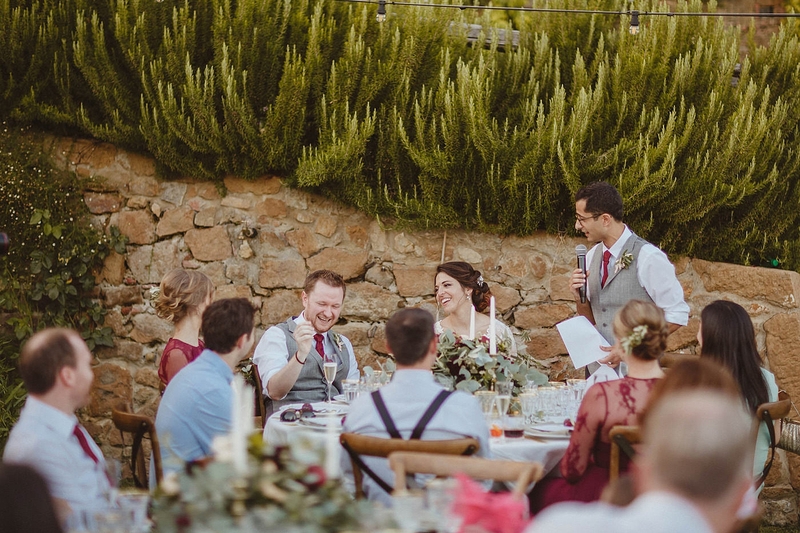 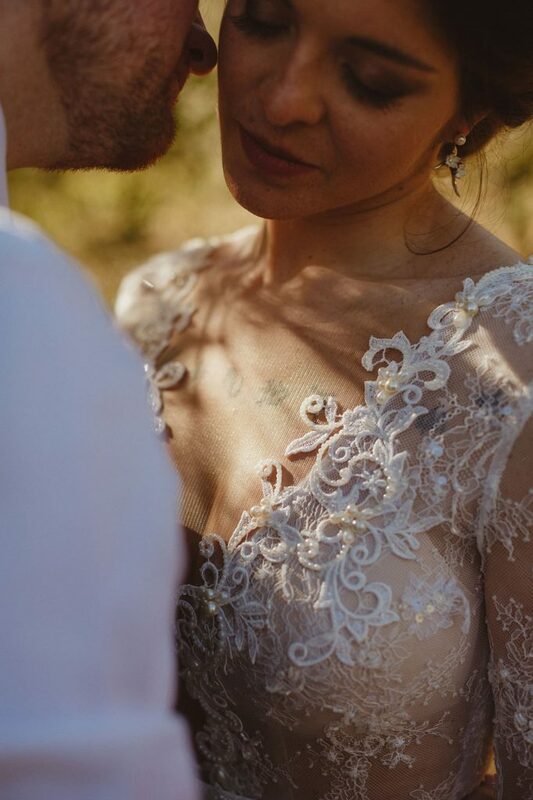 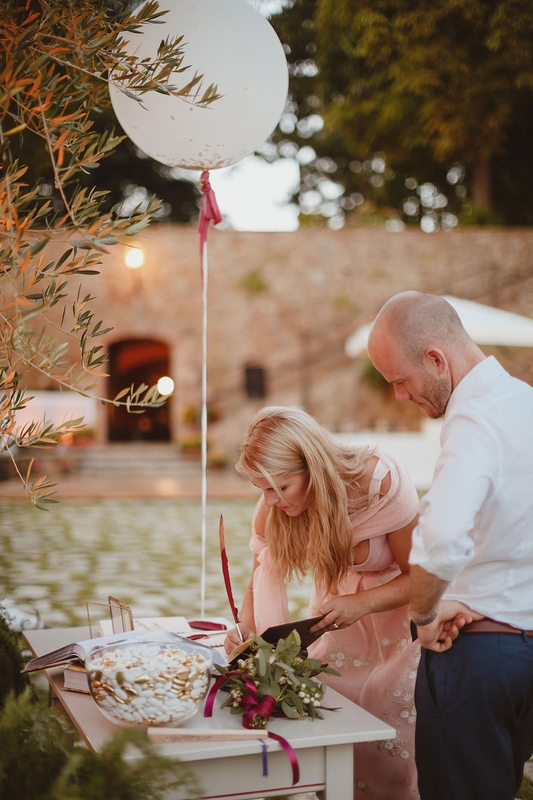 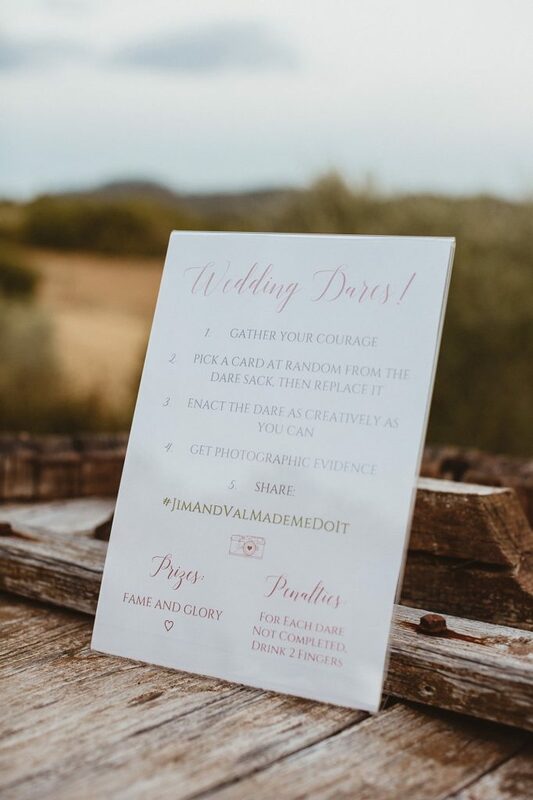 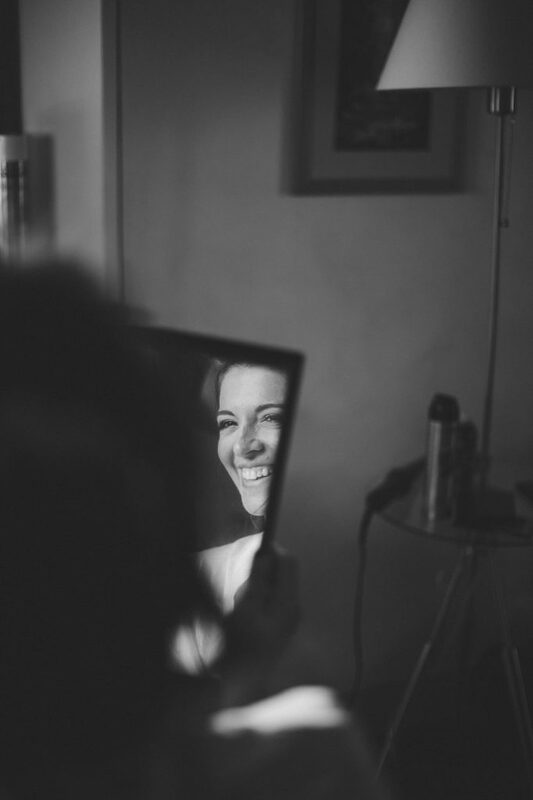 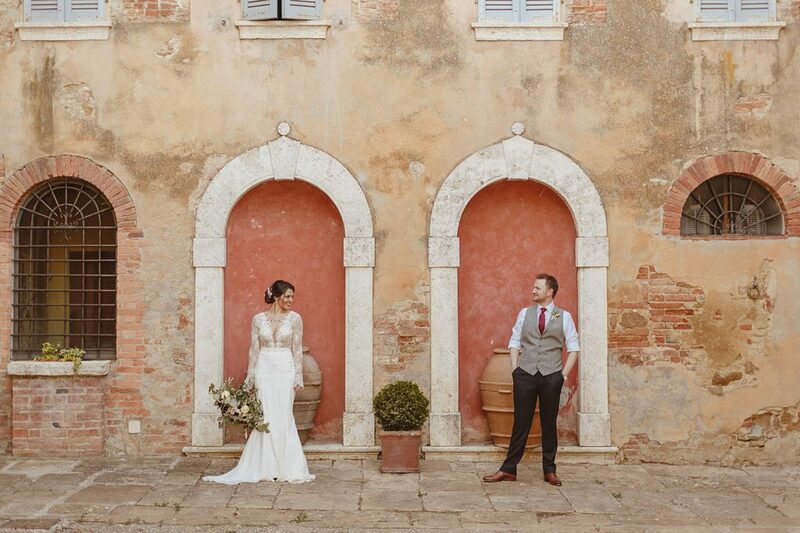 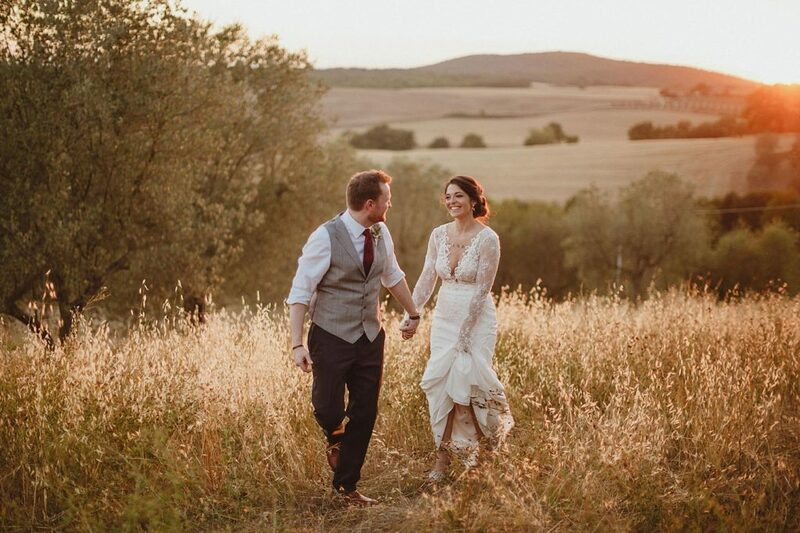 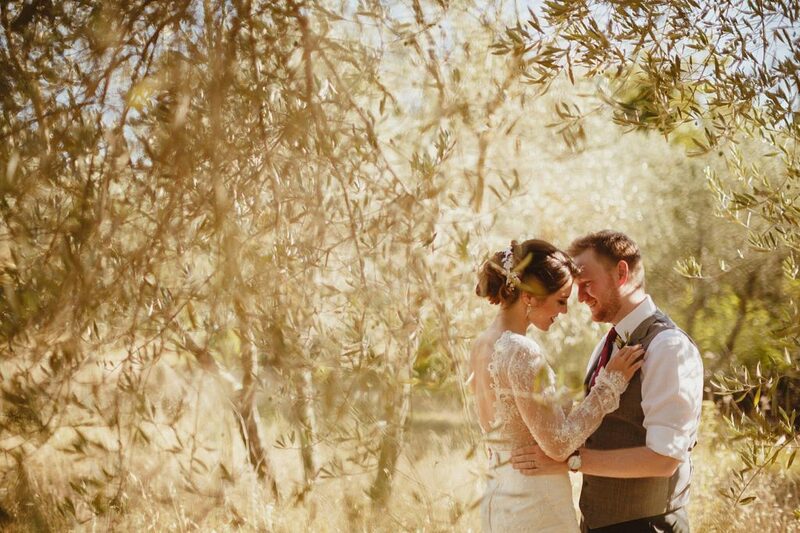 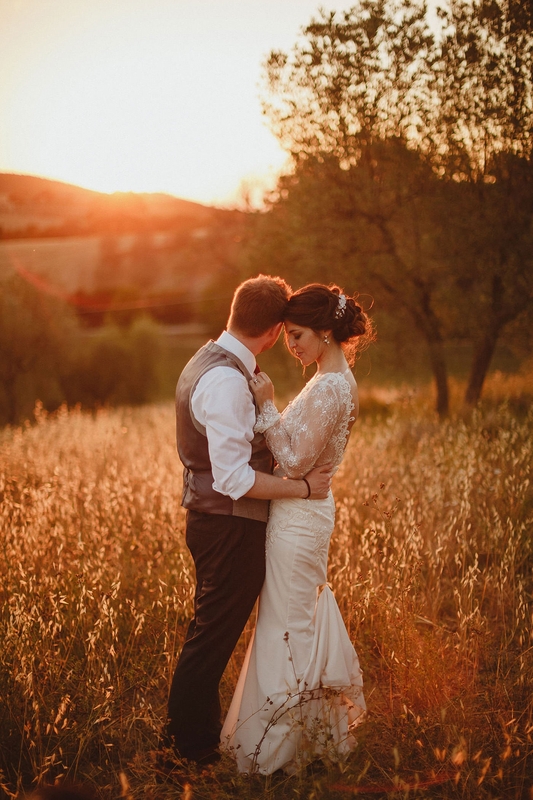 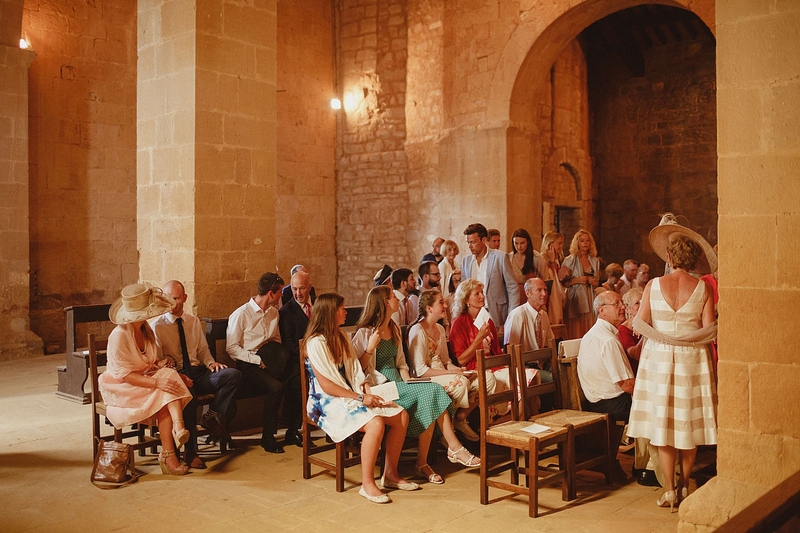 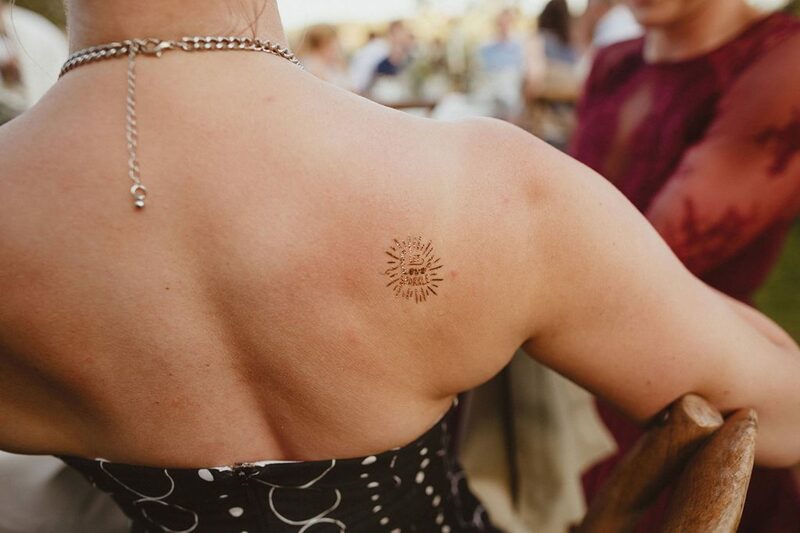 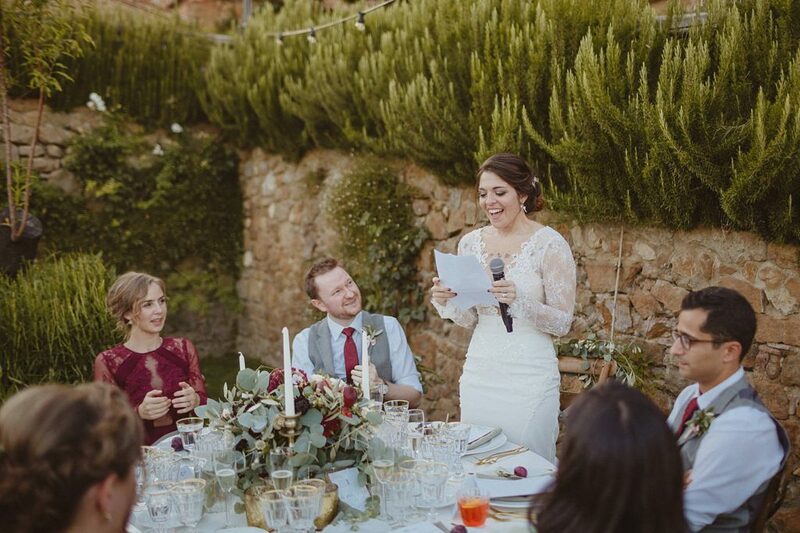 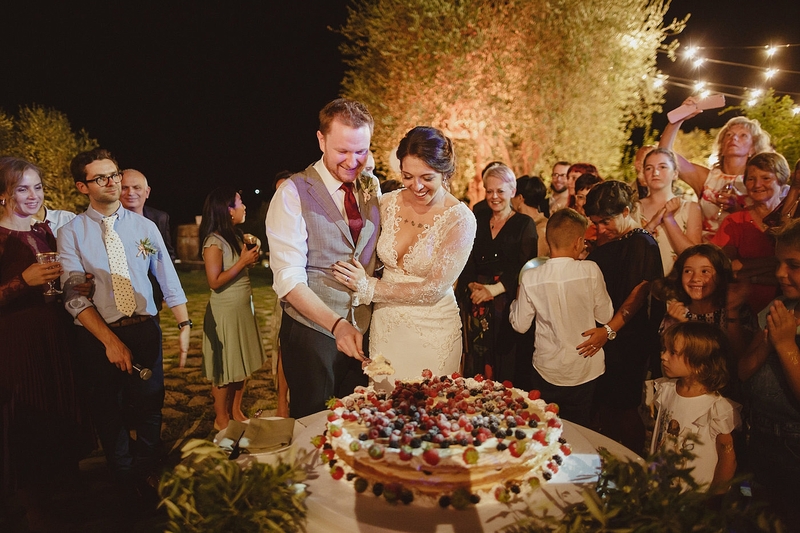 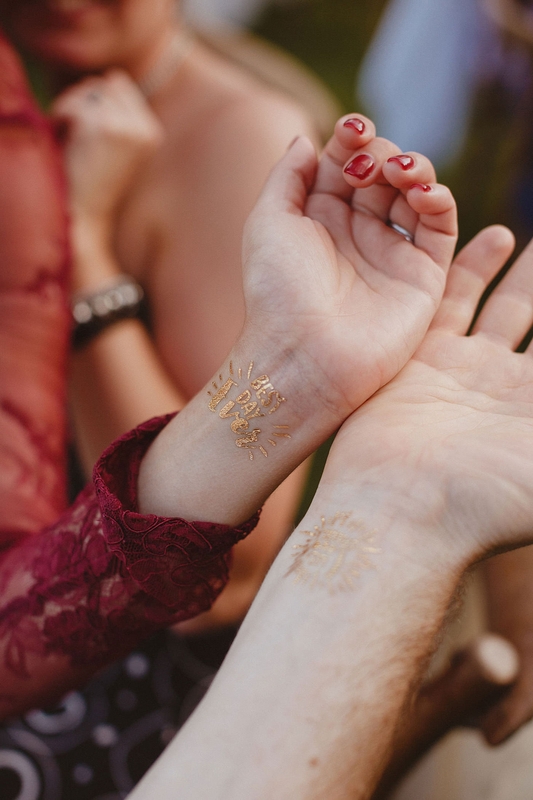 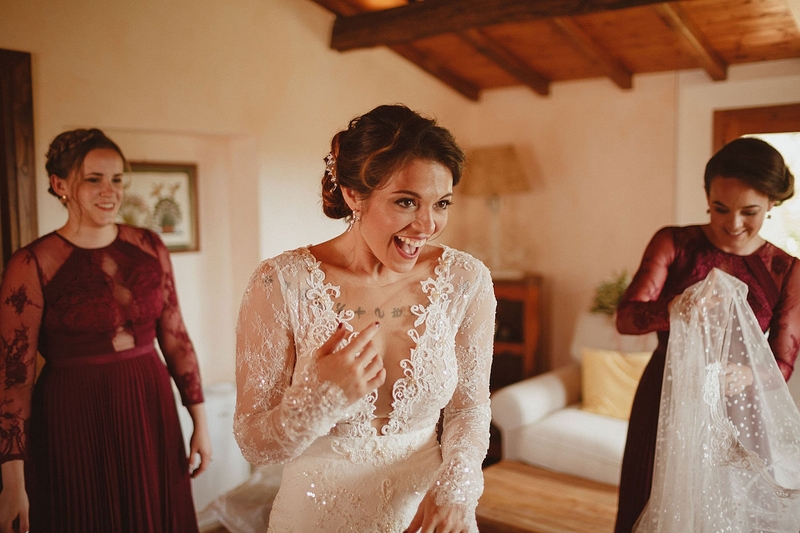 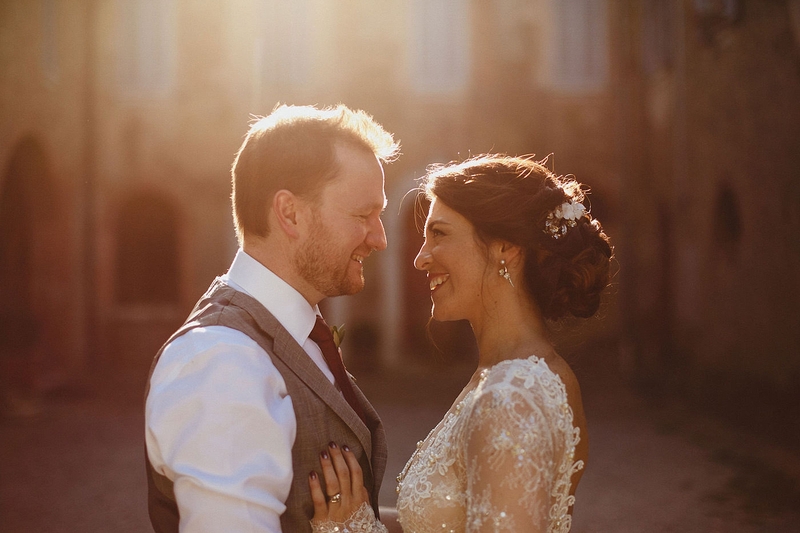 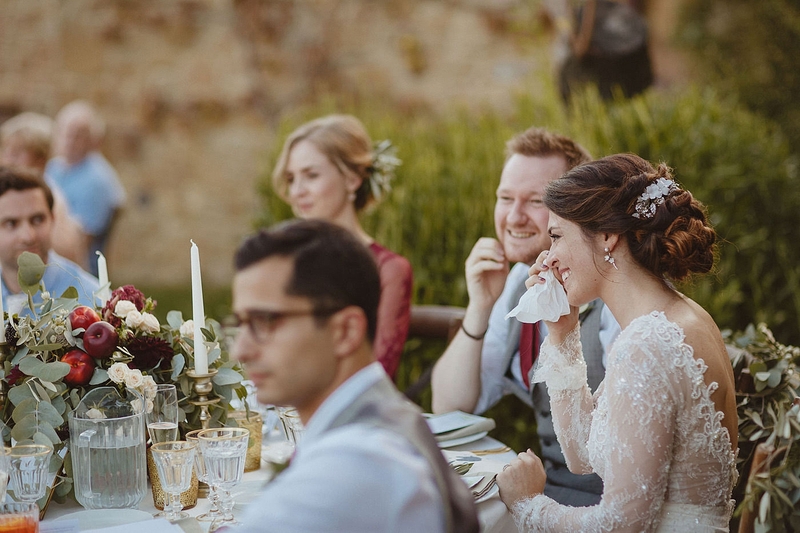 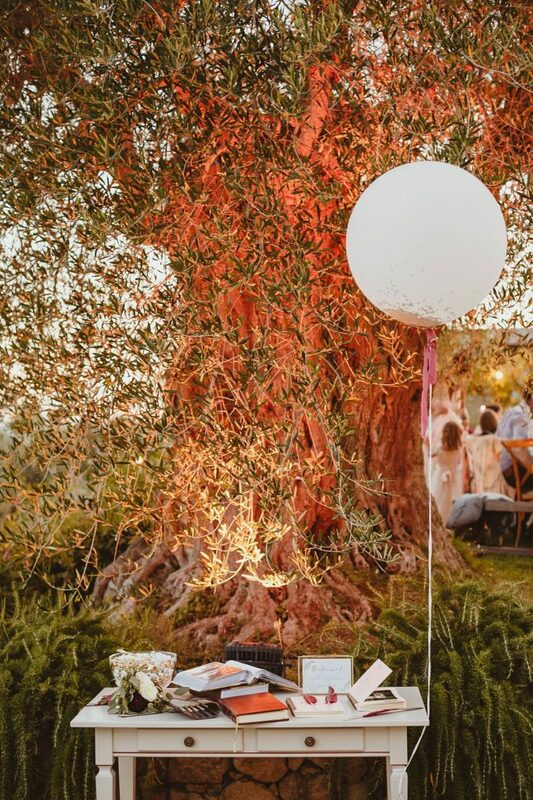 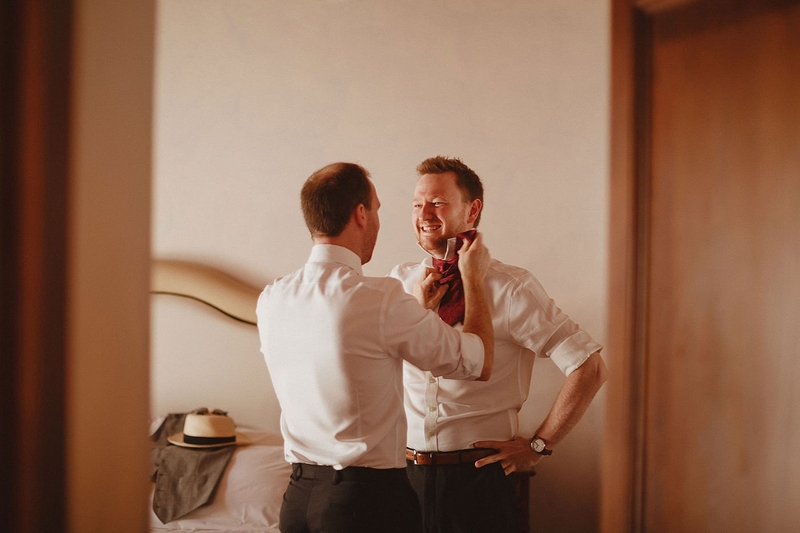 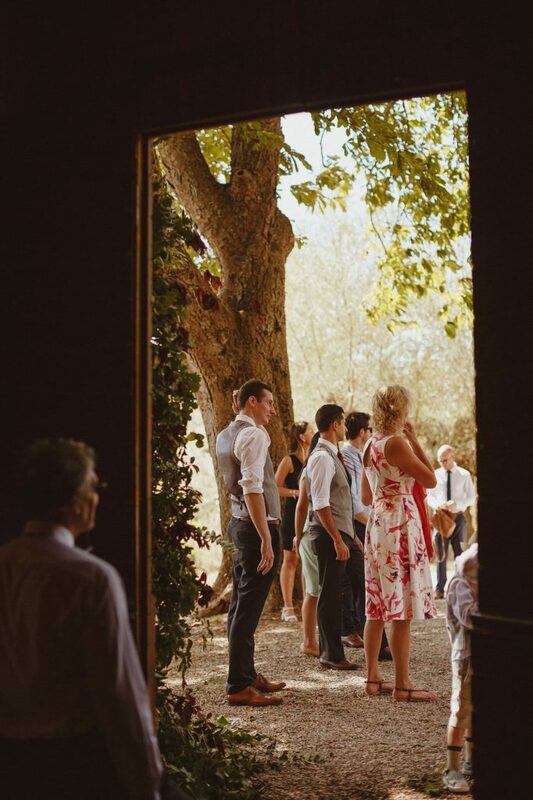 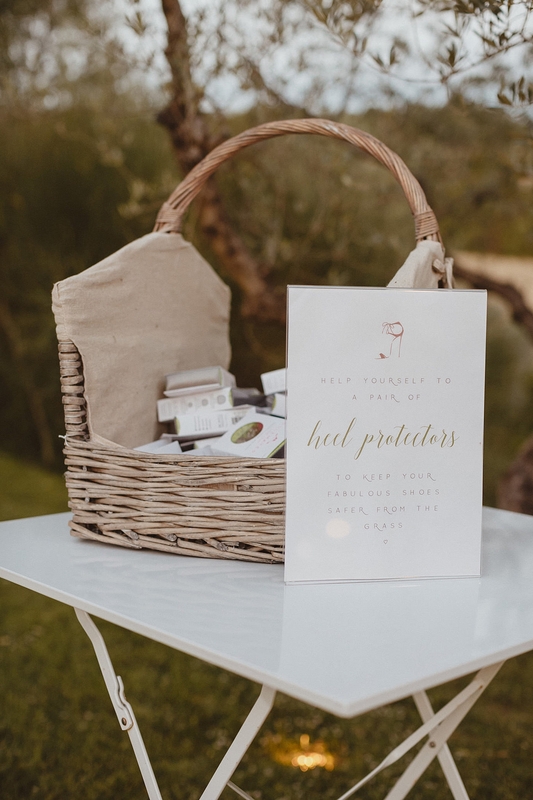 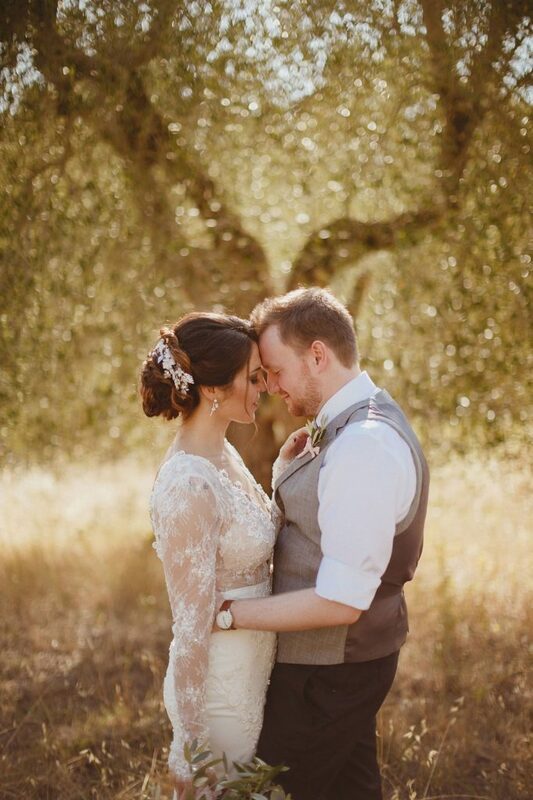 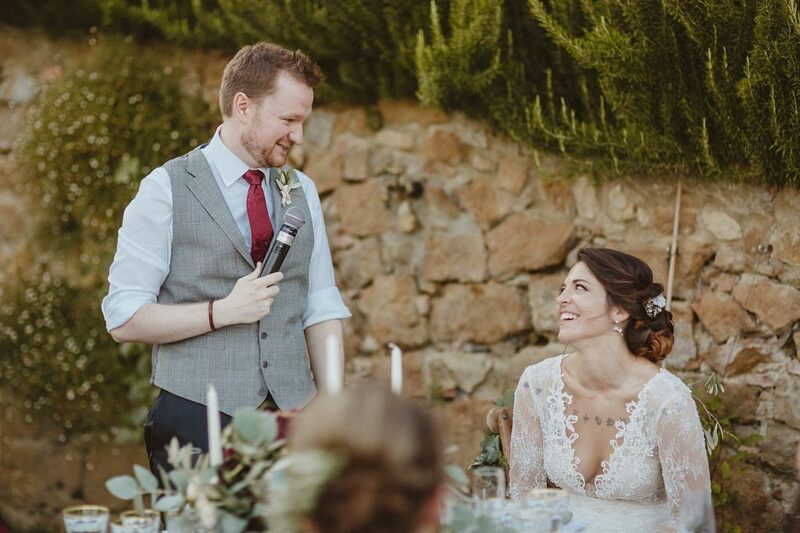 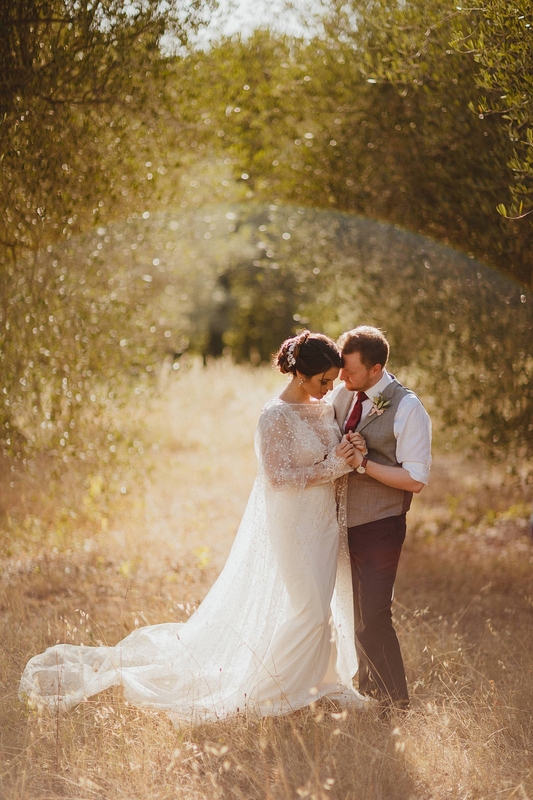 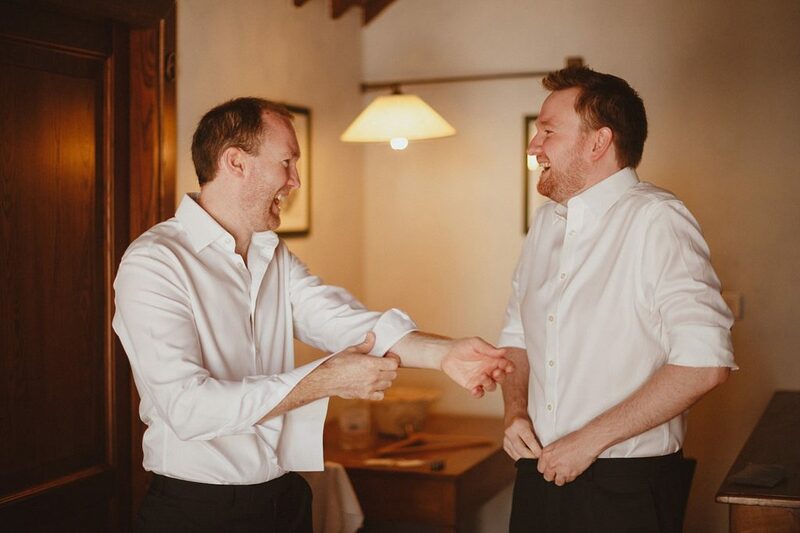 They organised a fun-filled weekend for all their friends and family – after a welcome pizza party at their Tuscan wedding venue (Borgo Sant’Ambrogio), Valentina and James got married in sunny – and incredibly hot! 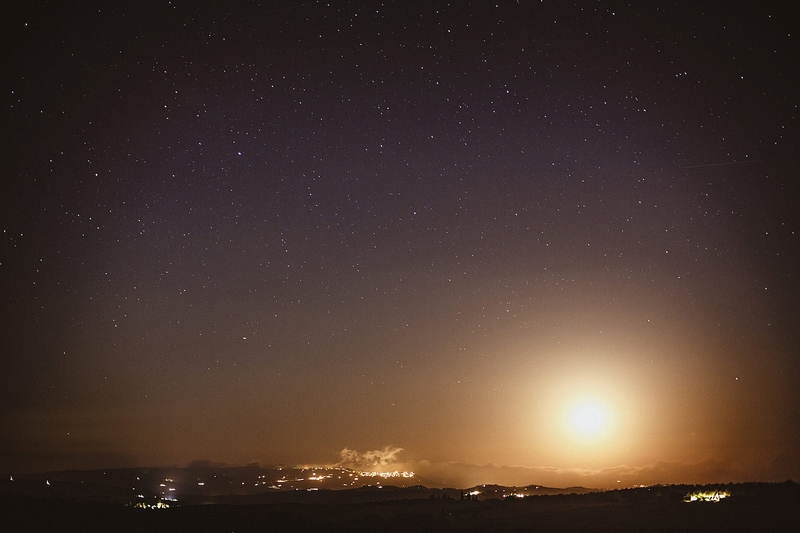 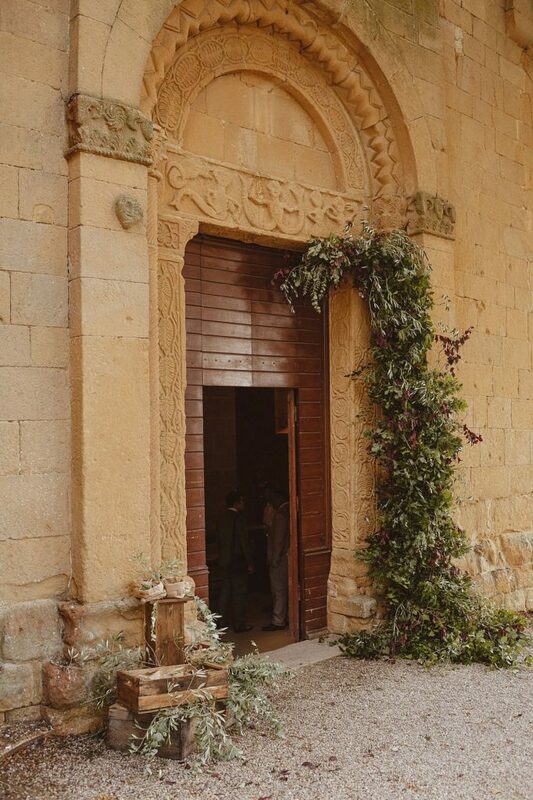 – Pienza in July 2017. 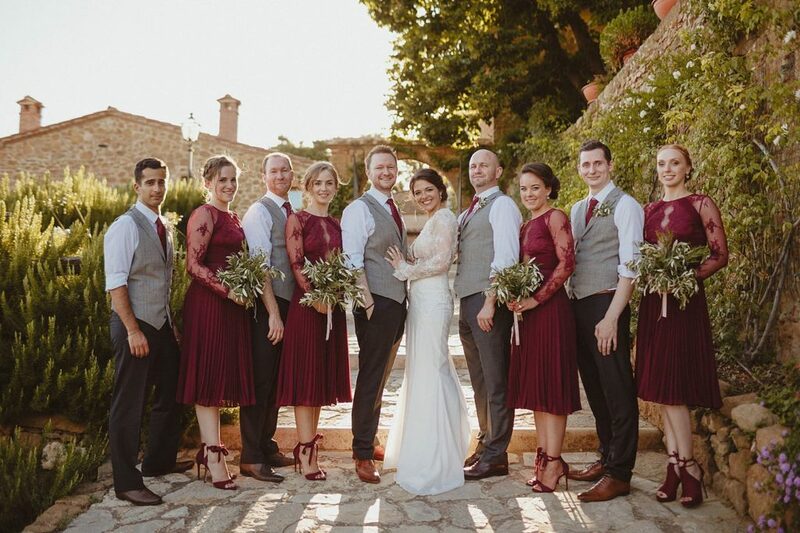 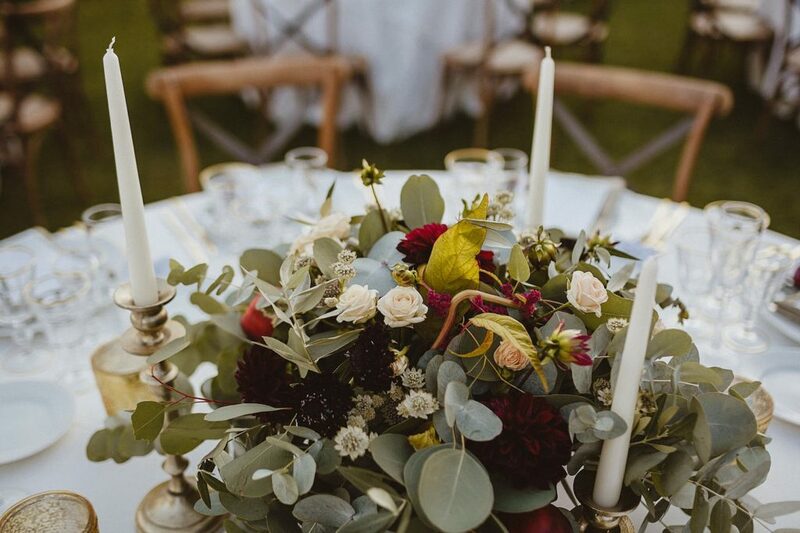 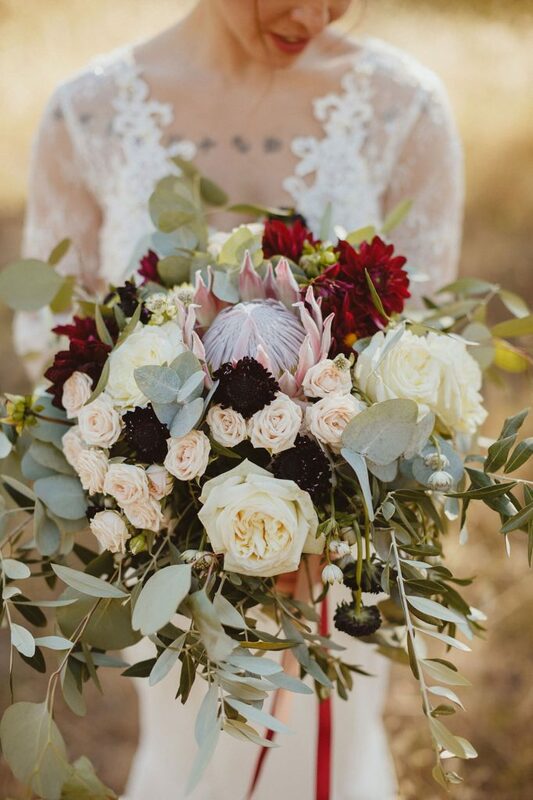 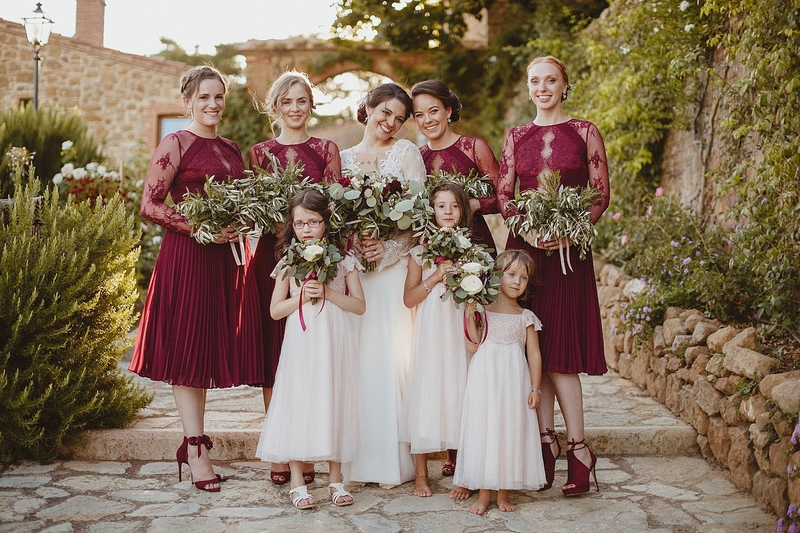 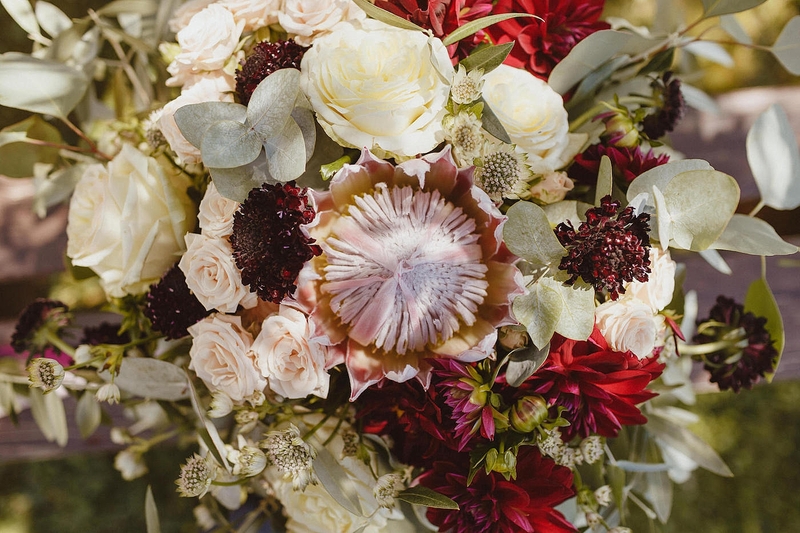 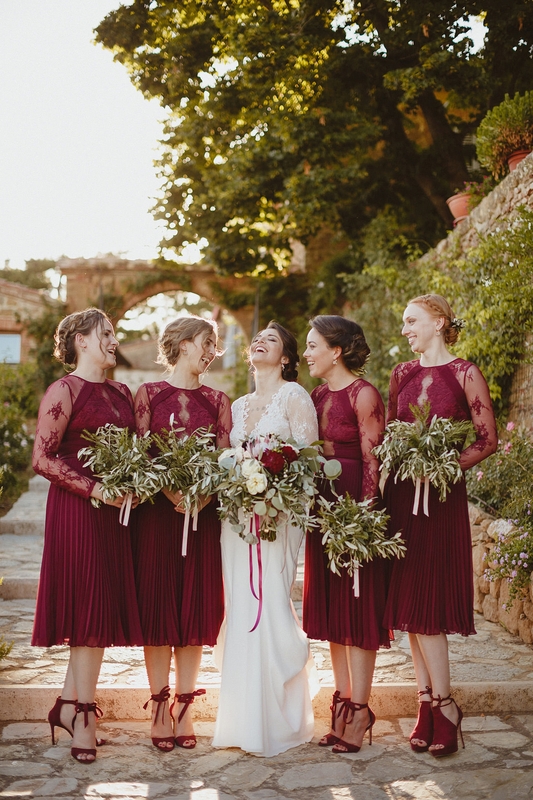 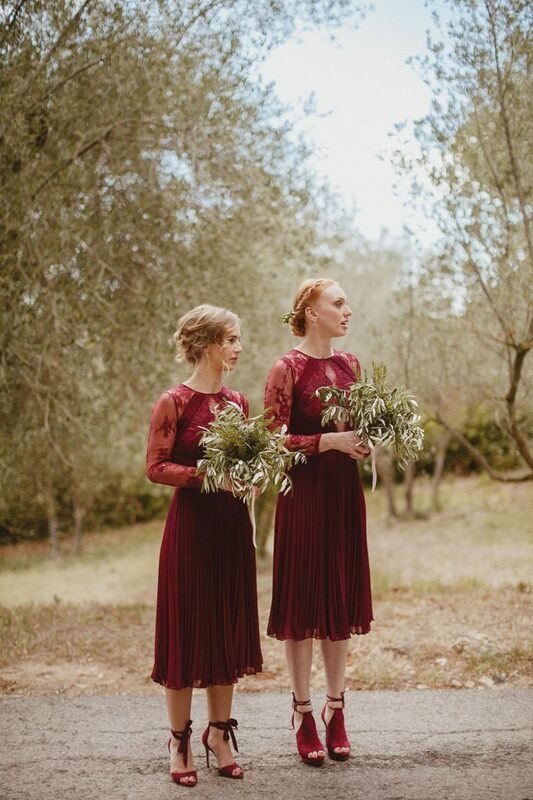 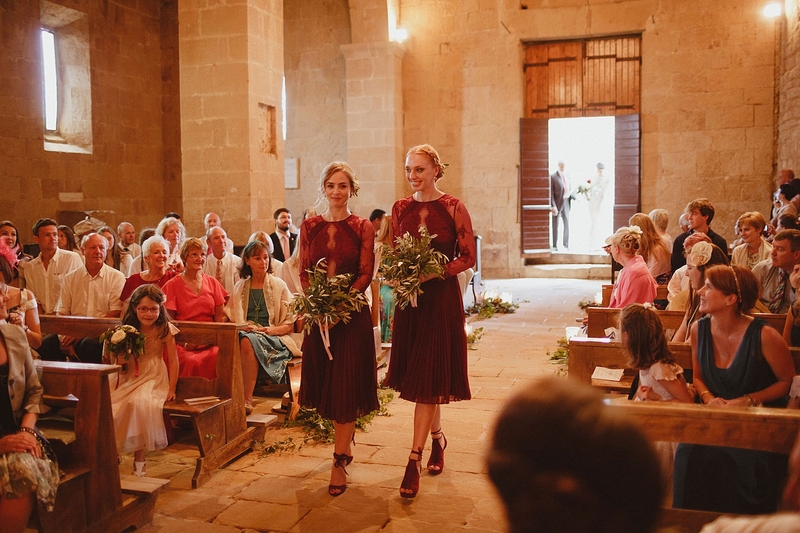 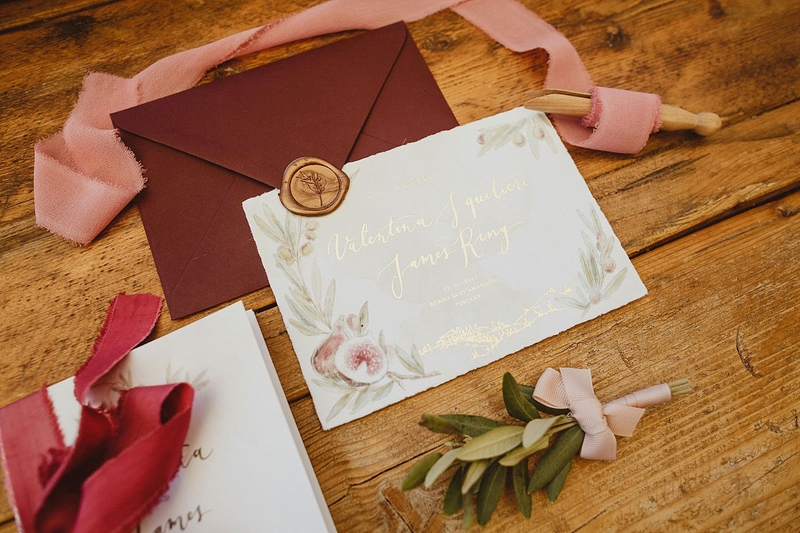 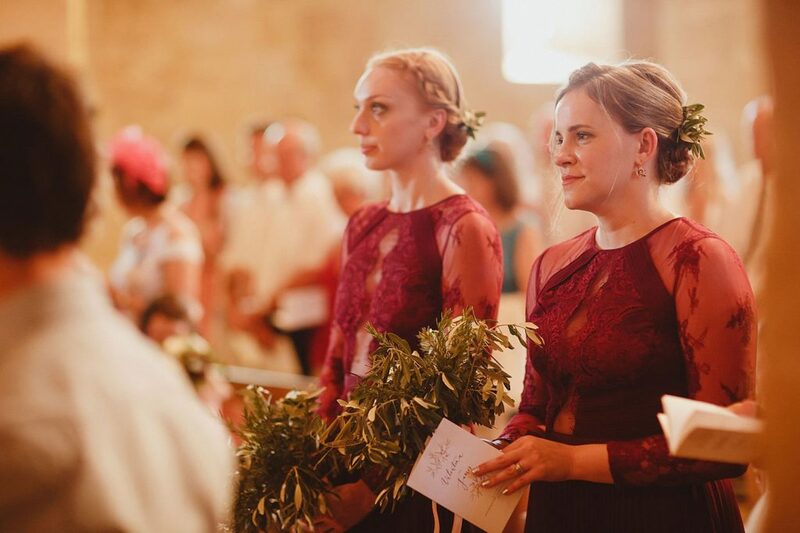 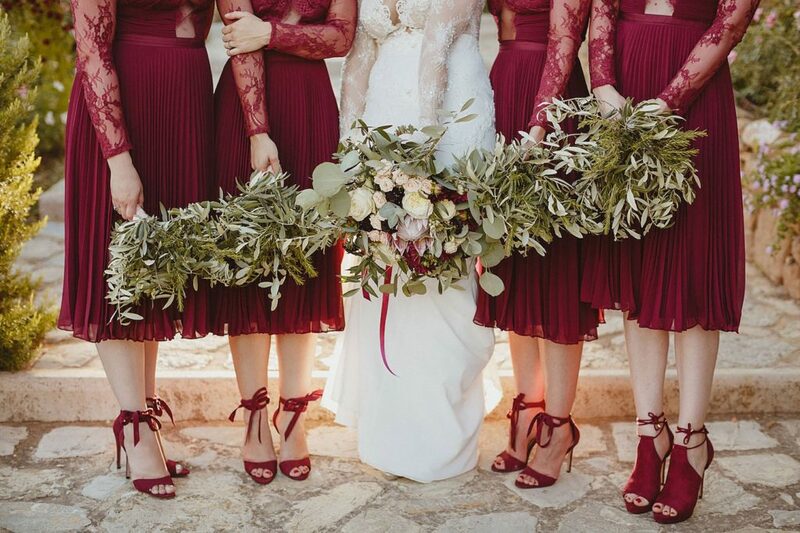 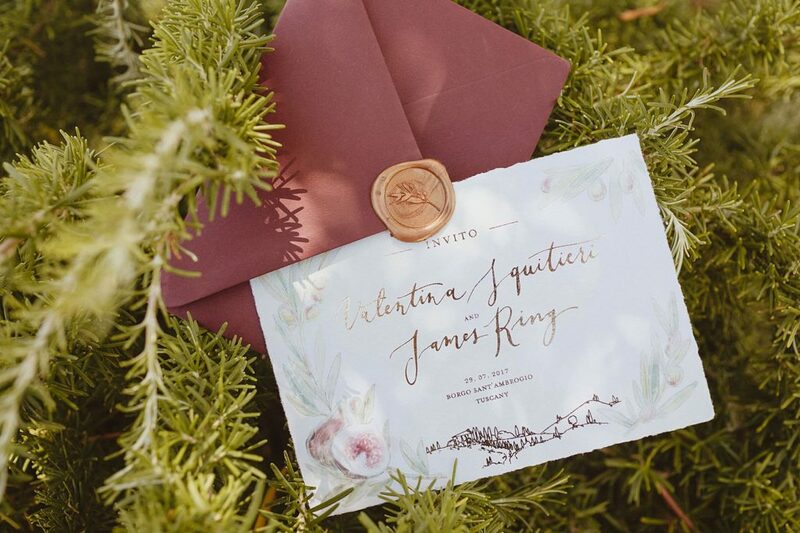 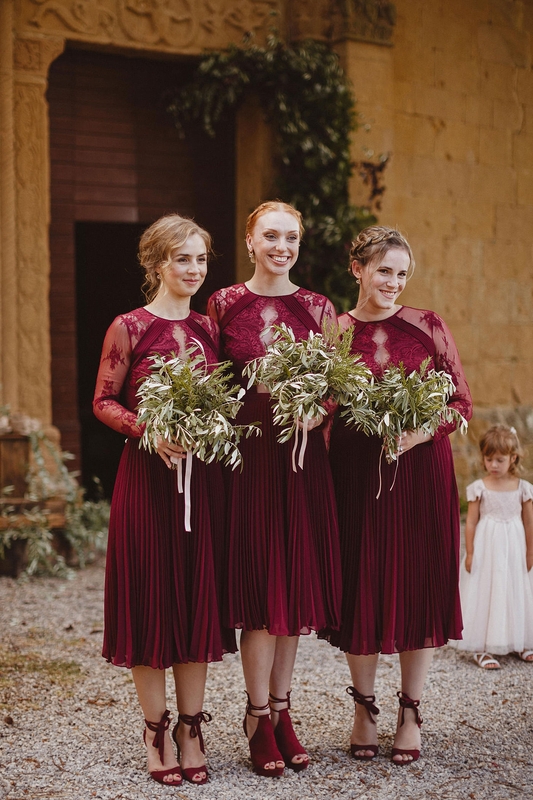 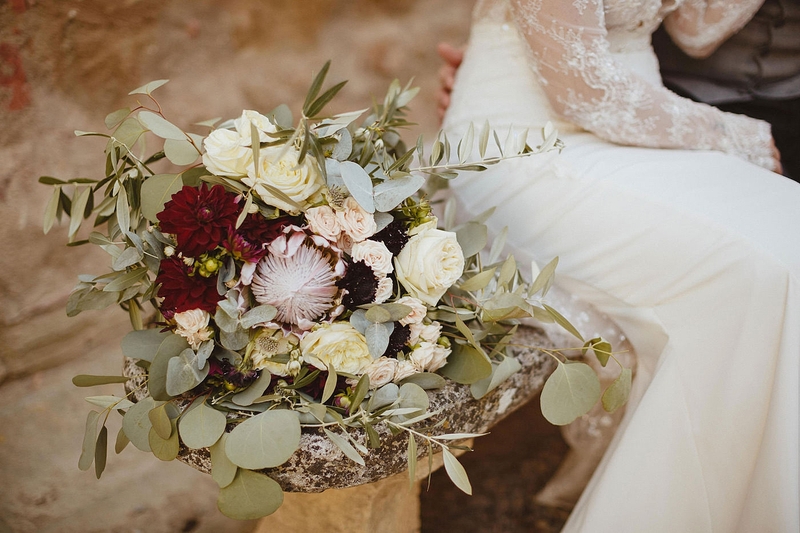 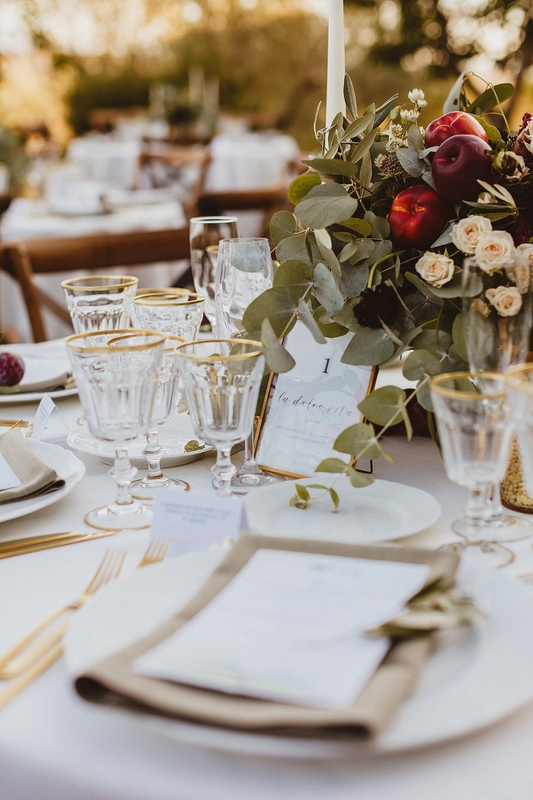 Full of rich oxblood red details and organic green, this wedding oozes romance and their young & fresh personalities like no other! 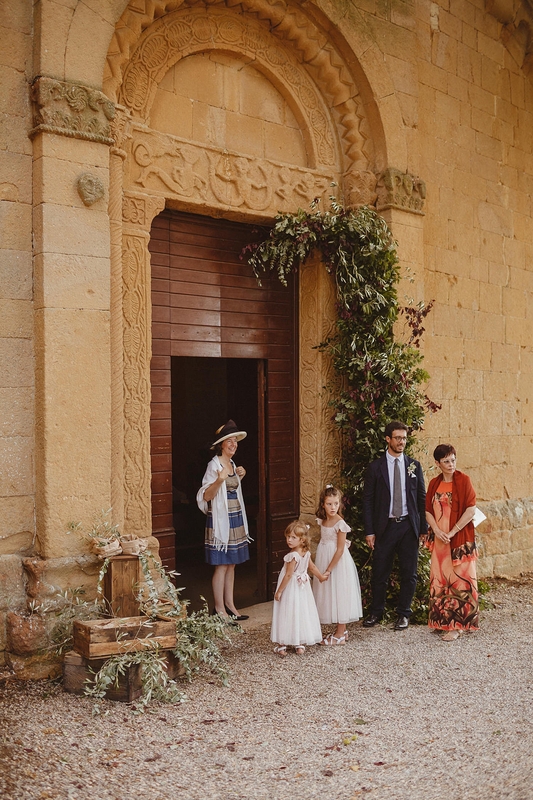 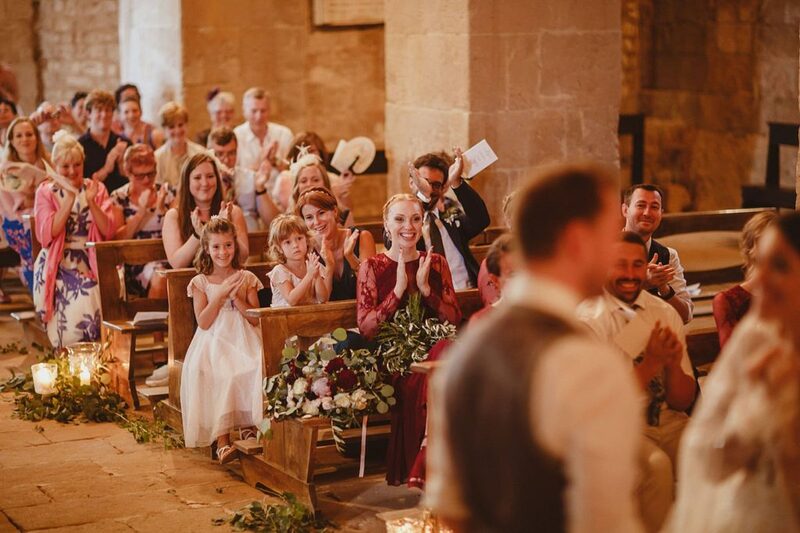 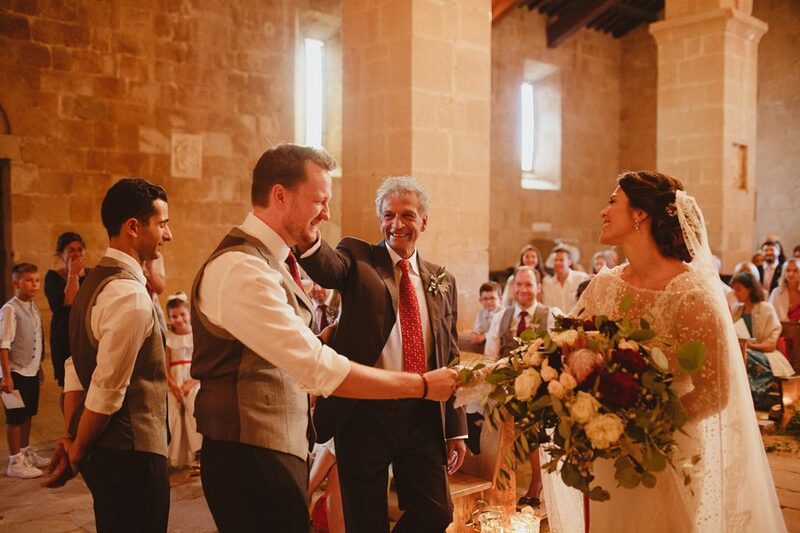 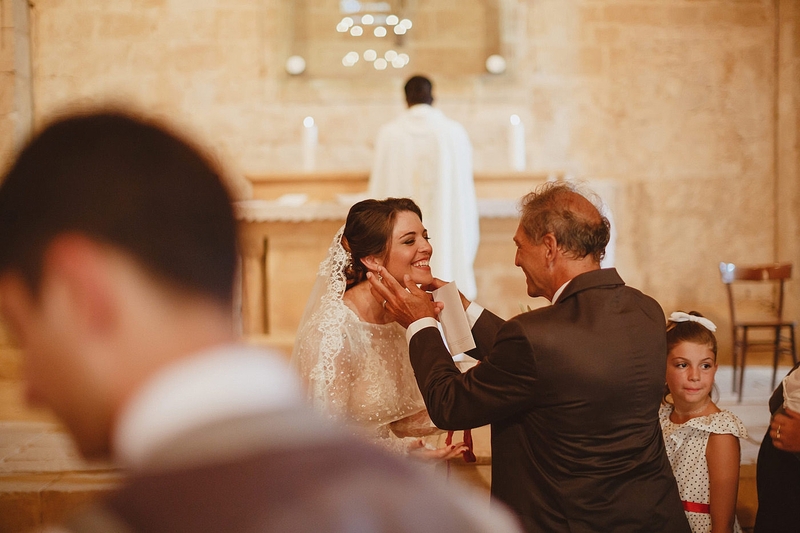 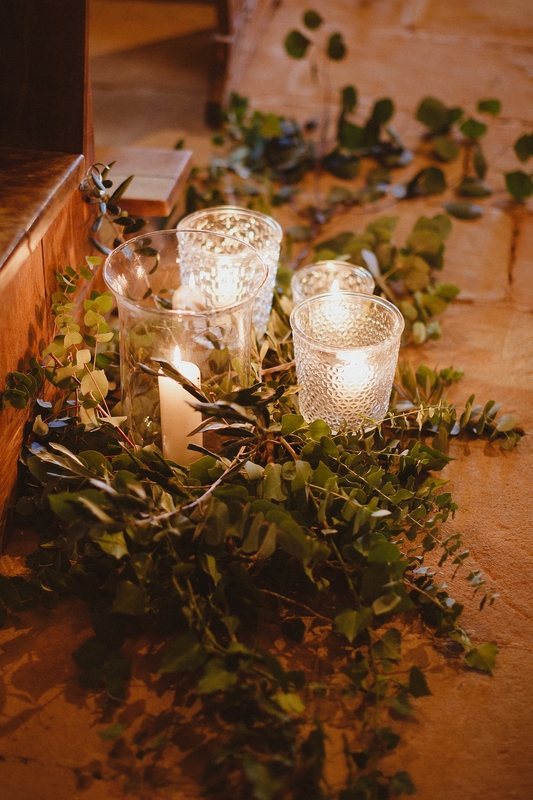 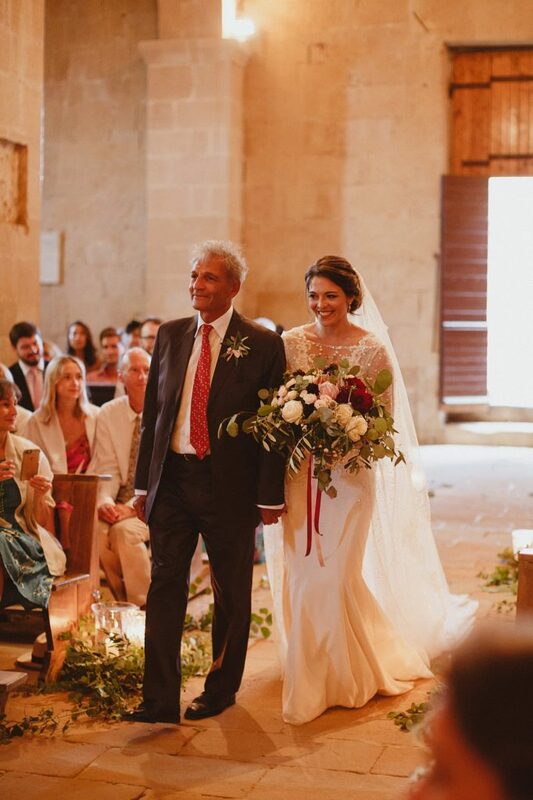 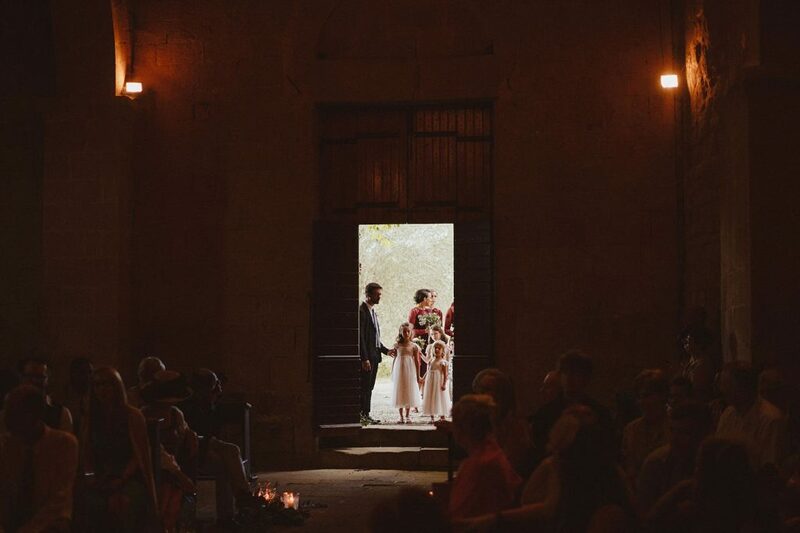 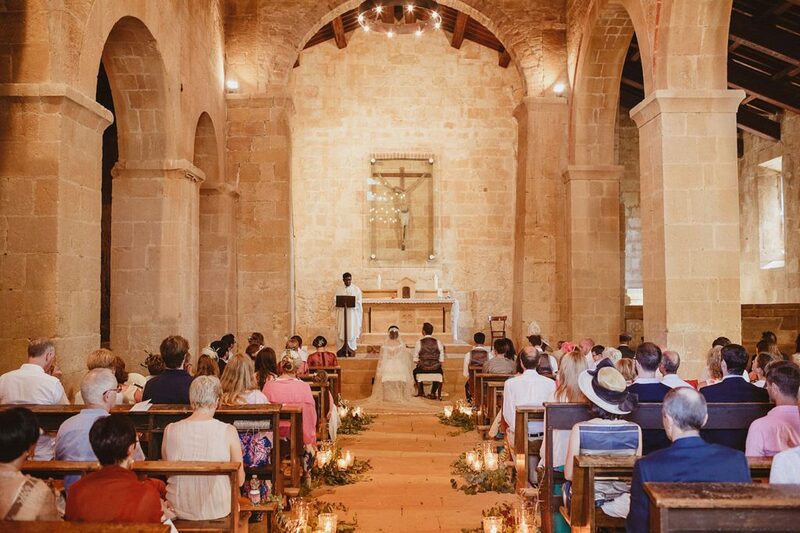 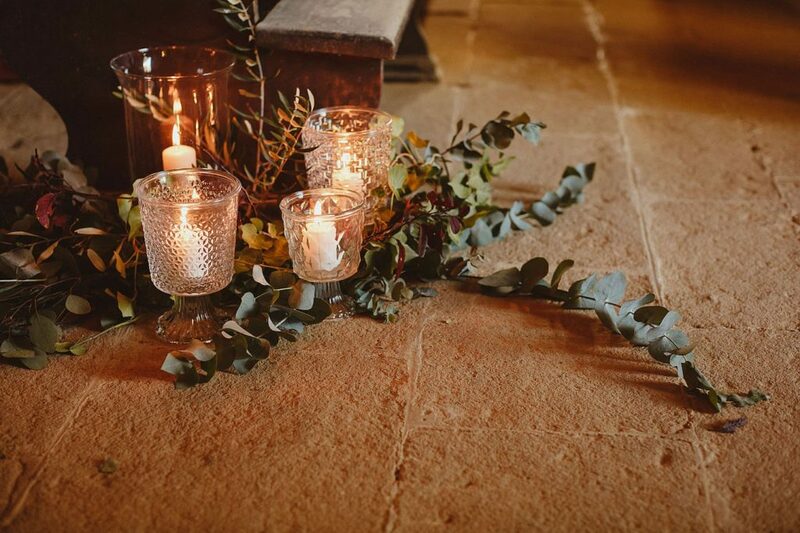 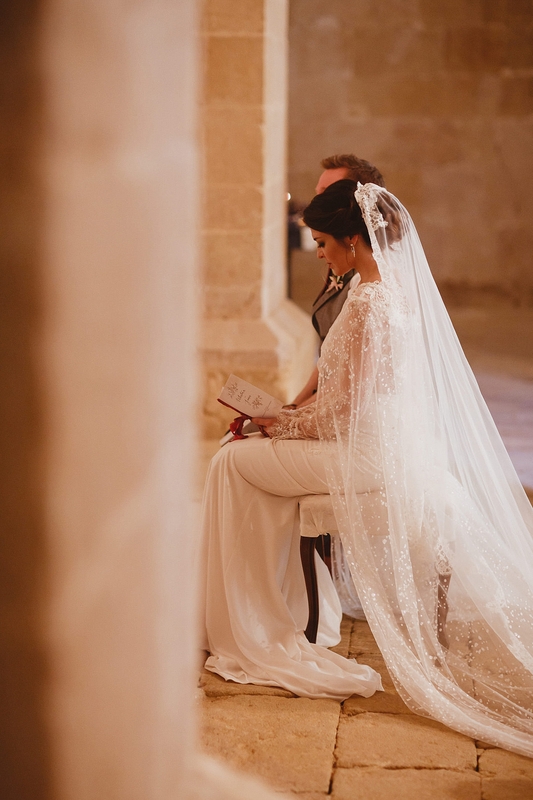 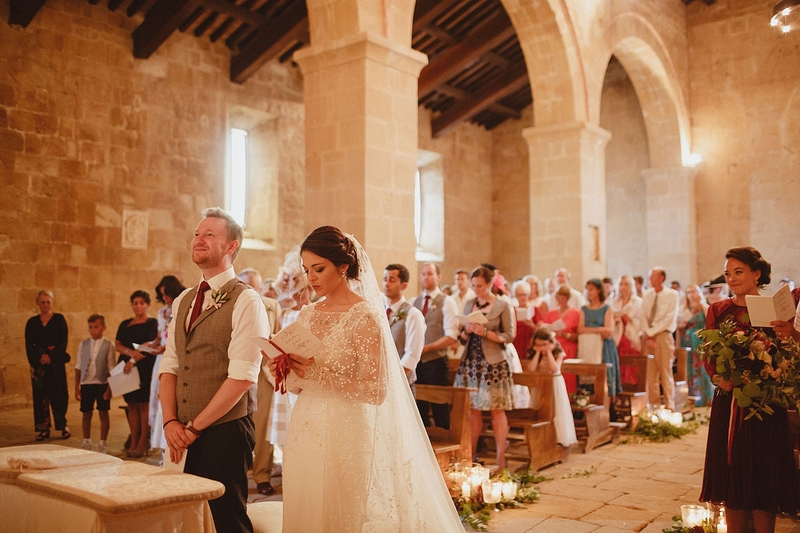 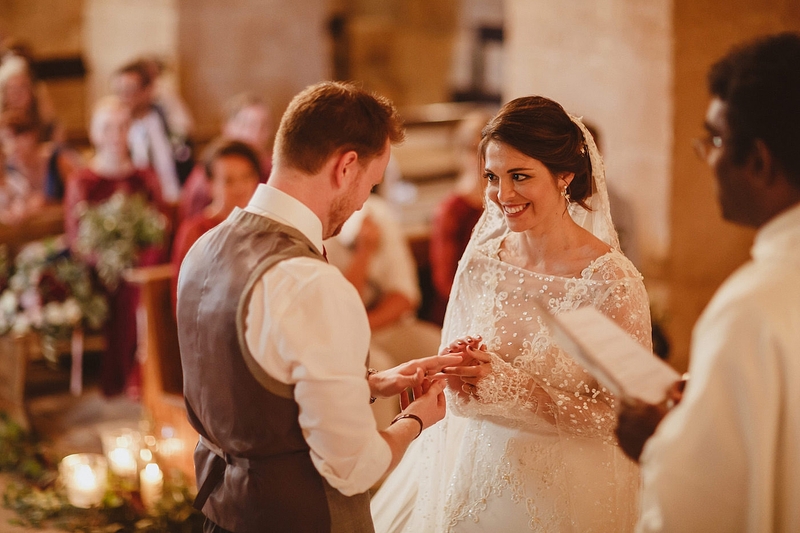 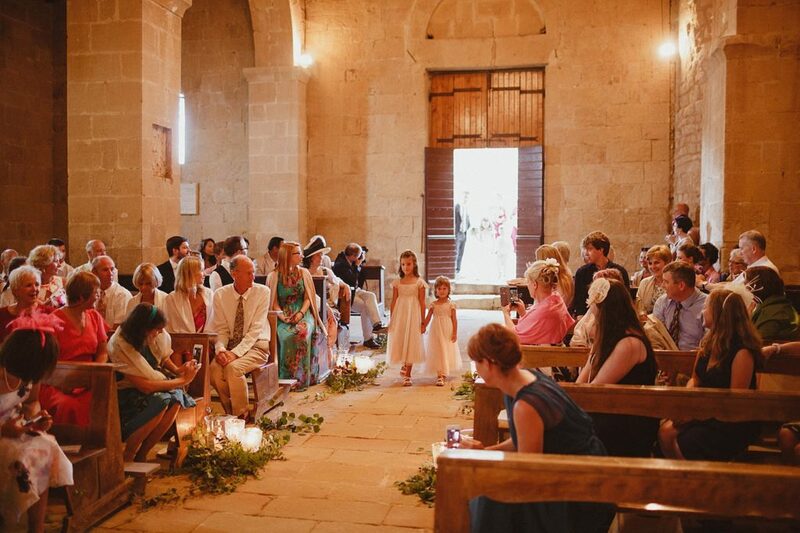 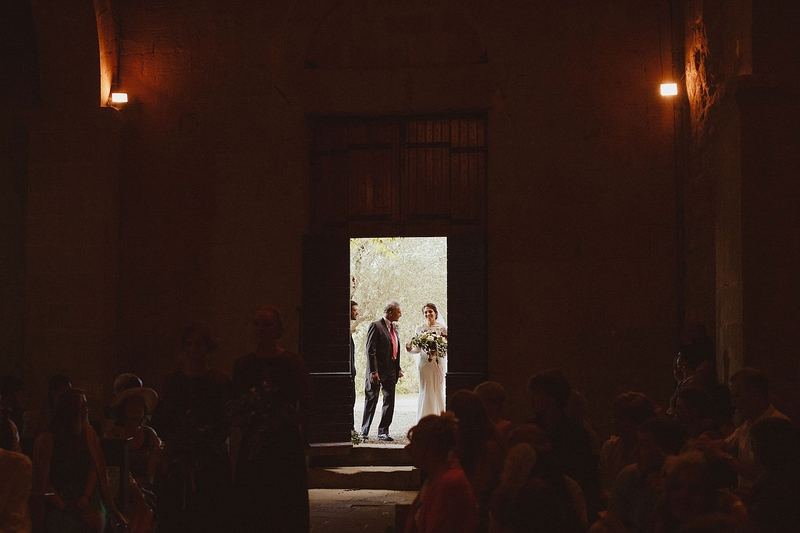 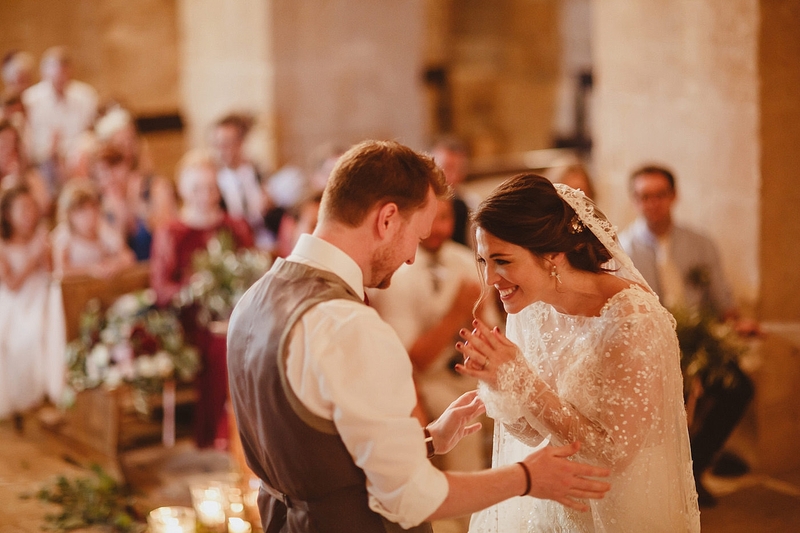 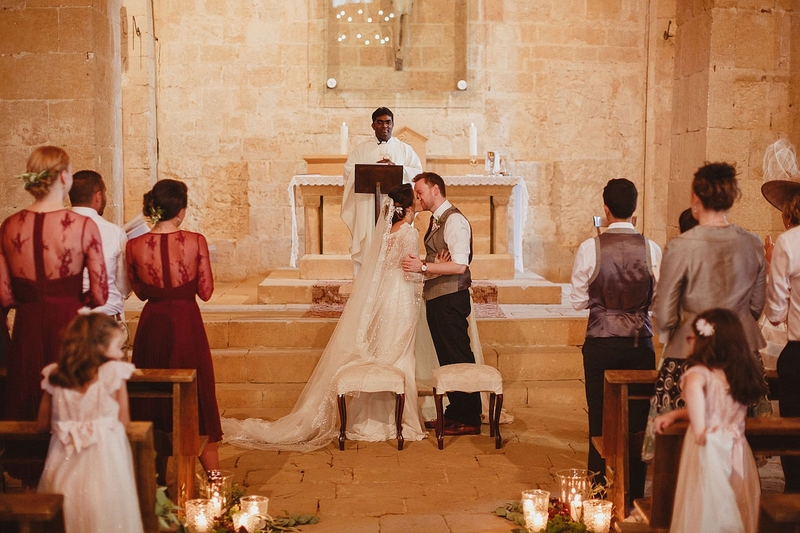 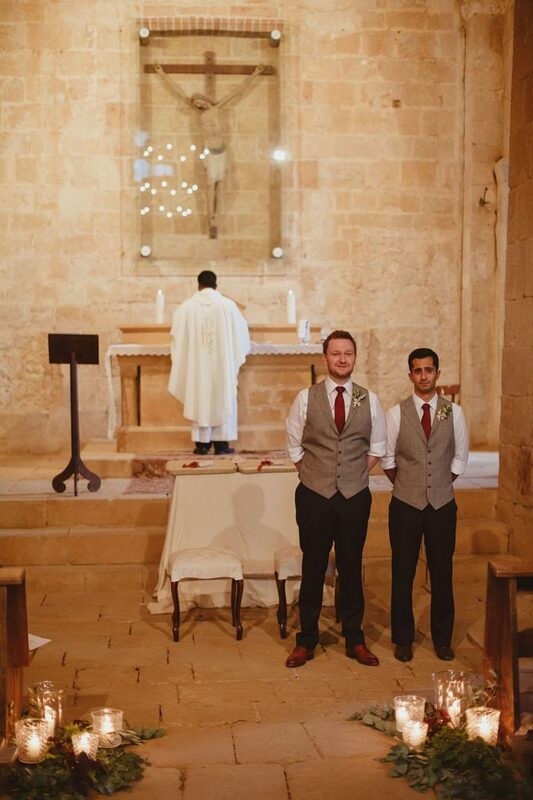 James and Valentina opted for a religious ceremony in a sombre romanesque church, which Flowers Living styled with a trail of foliage and candles along the aisle in keeping with the minimal, restrained architectural feel of the church. 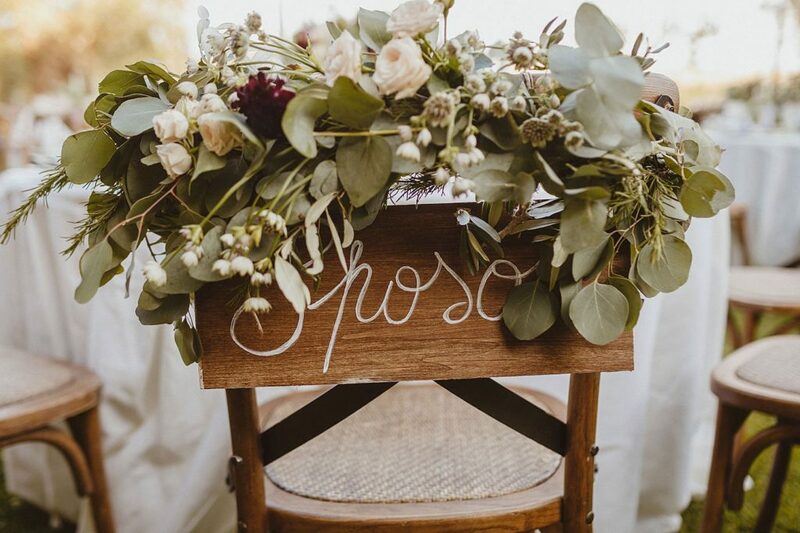 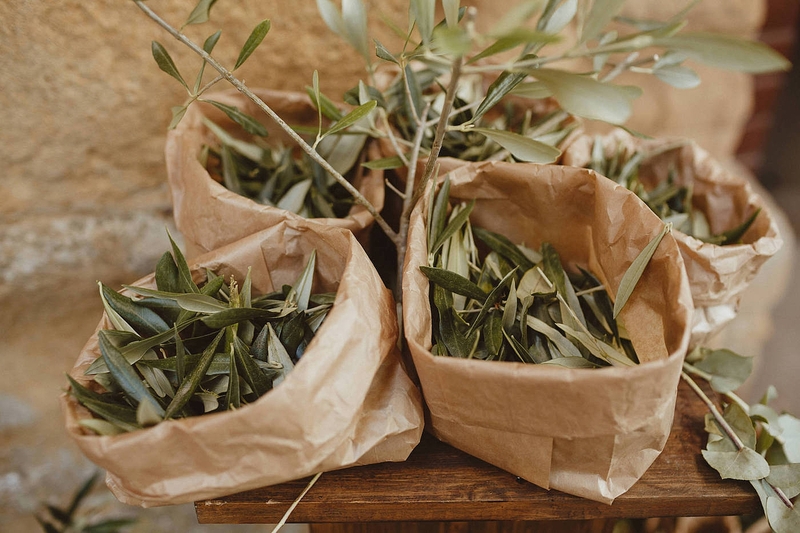 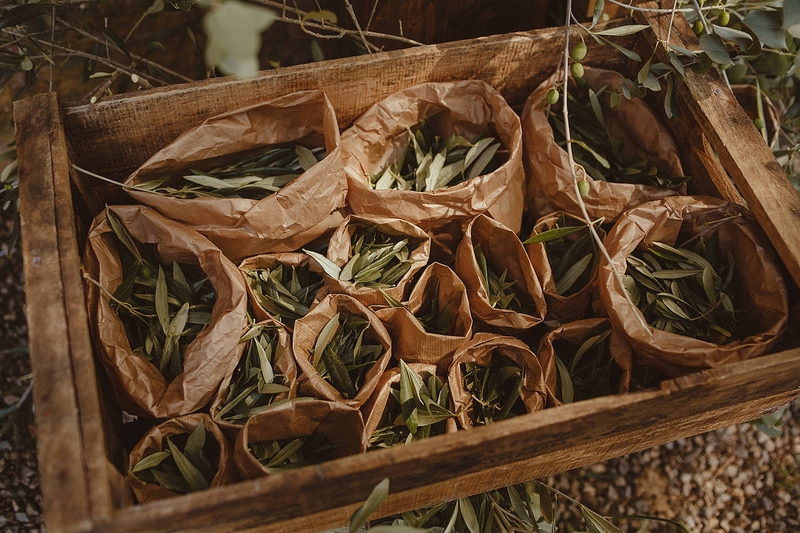 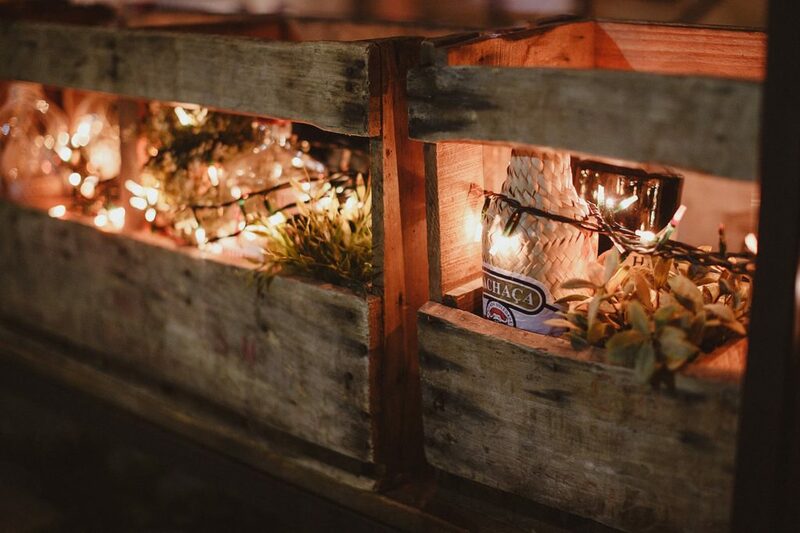 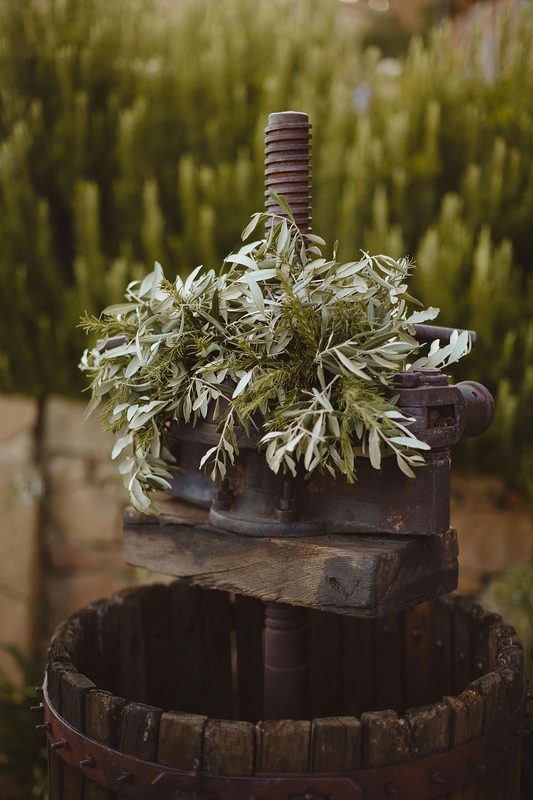 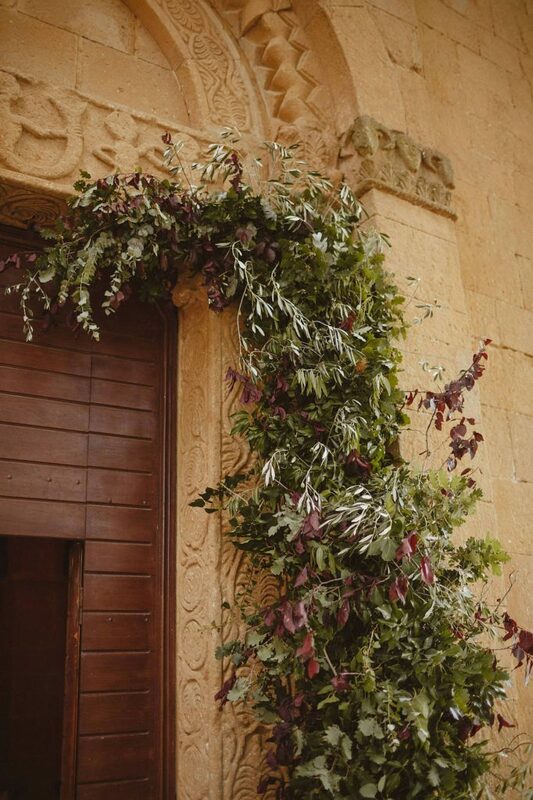 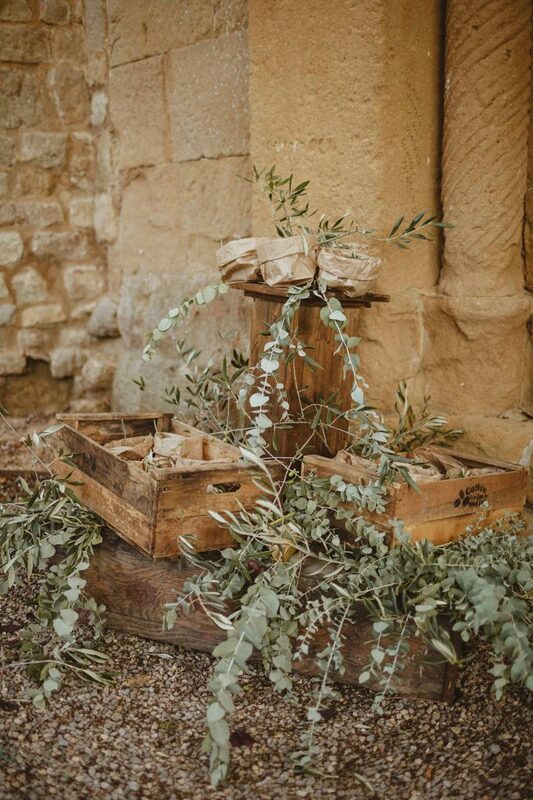 The entrance door was decorated with a full foliage arch and a set up of rough wooden crates and brown paper bags with olive leaves to be used as confetti. 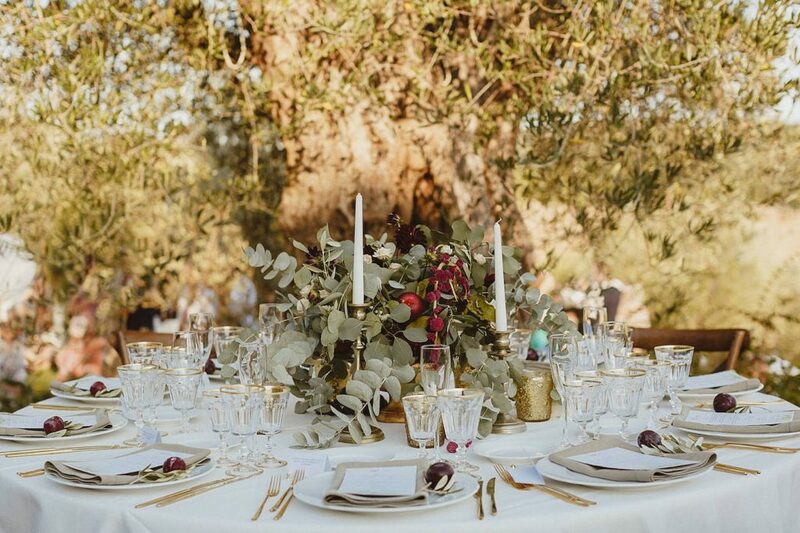 They wanted the wedding to bring together two of Italy’s most well known life philosophies: “Il Dolce Far Niente” and “La Dolce Vita”, so we worked on creating a truly informal atmosphere to allow their guests to feel at home and relaxed, and at the same time, added rich details, like a deep burgundy and olive green colour scheme, delicious Italian food (naturally! 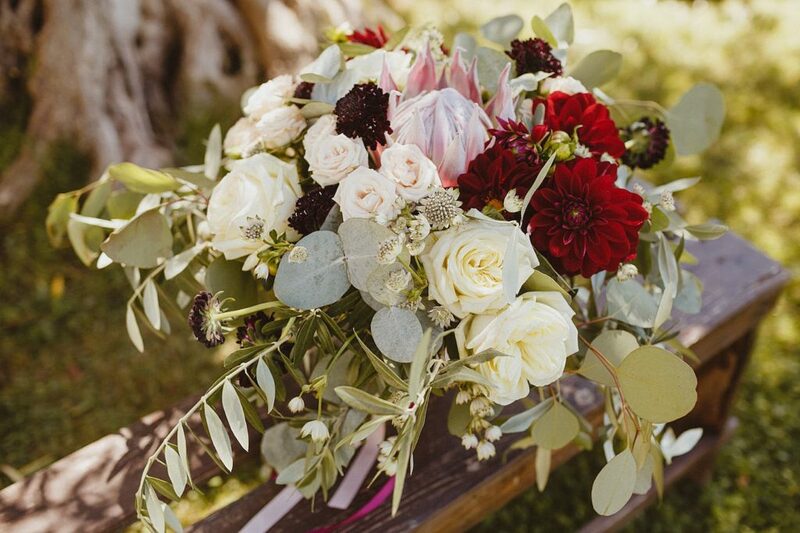 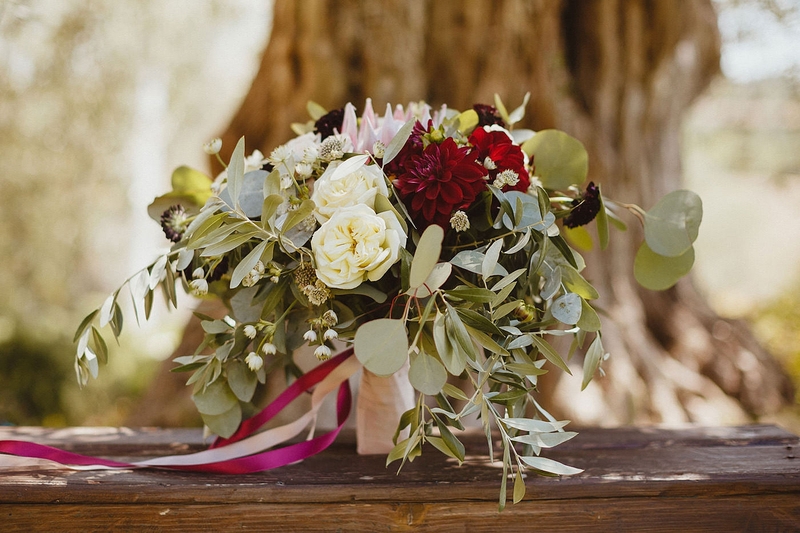 ), gold accents and overflowing floral arrangements with dusky pink, burgundy and lots of foliage. 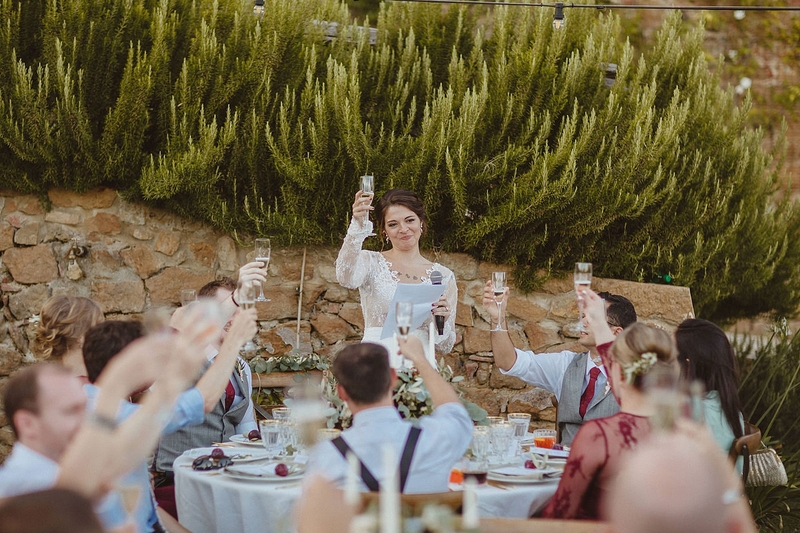 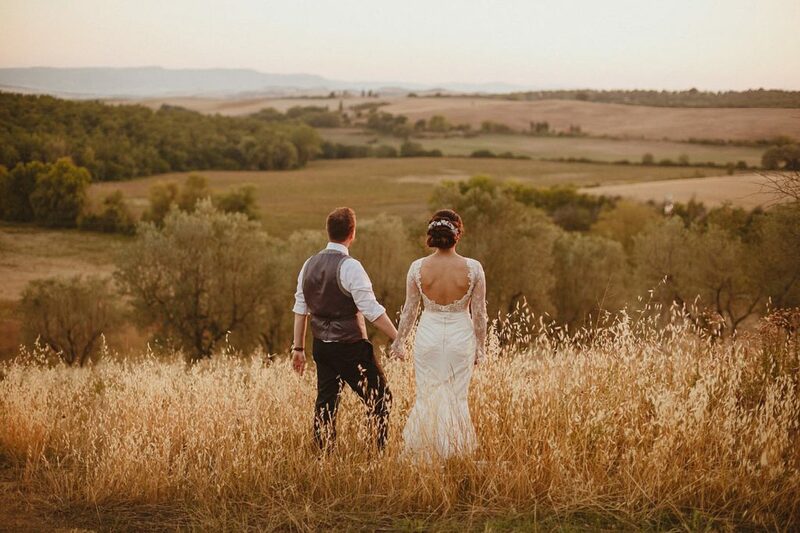 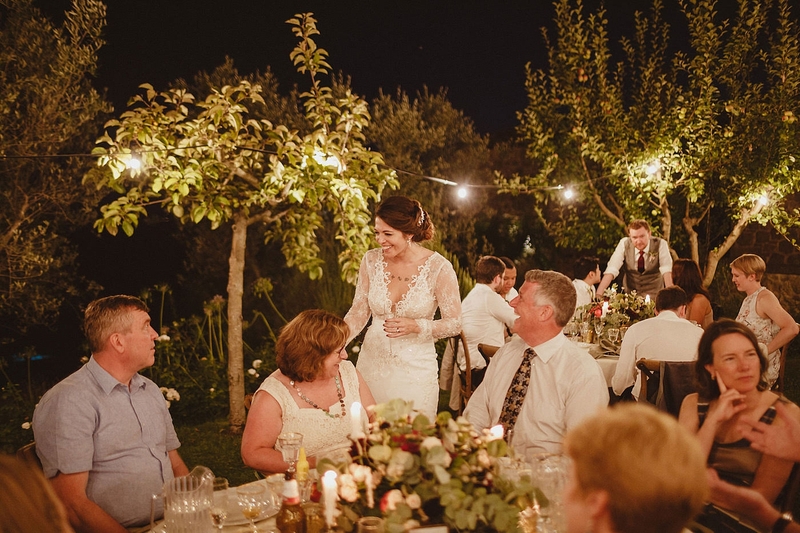 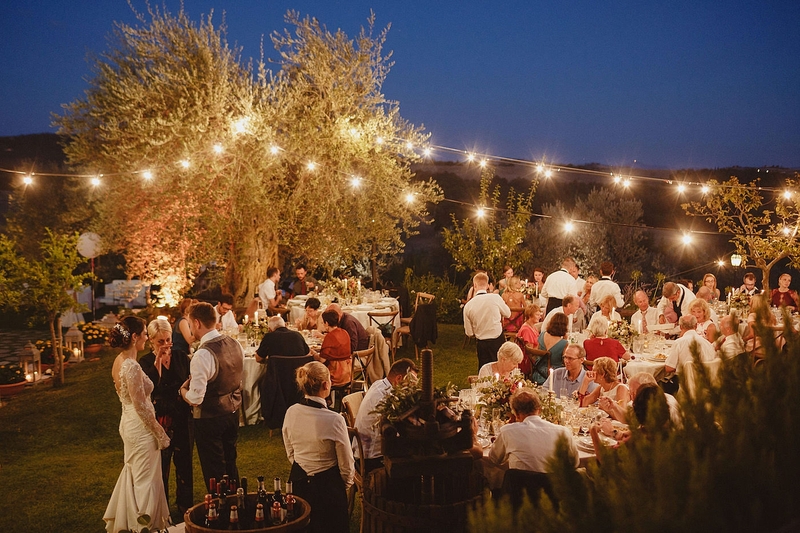 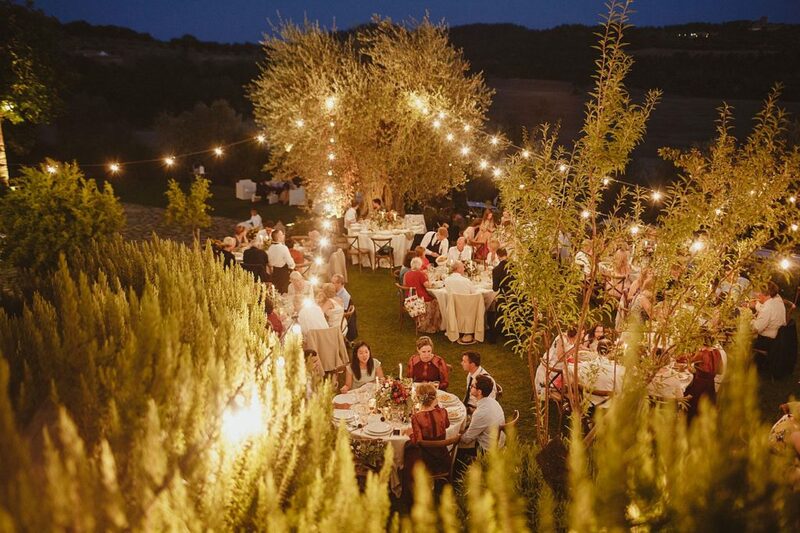 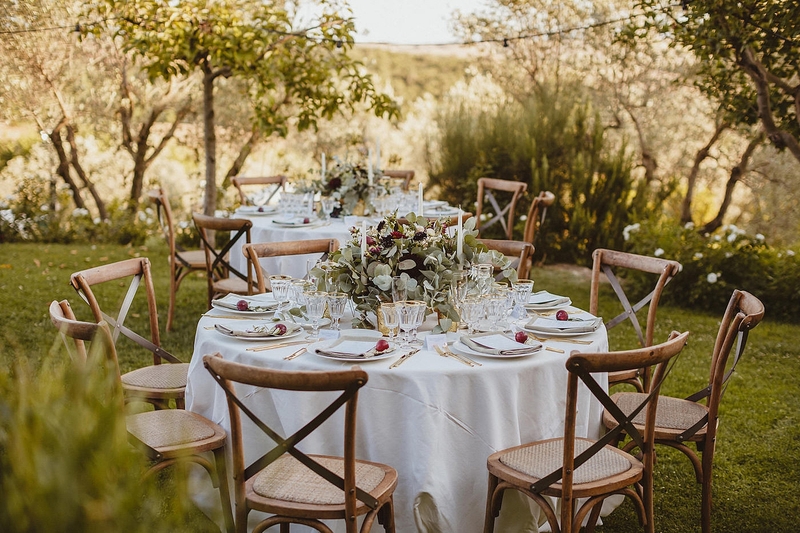 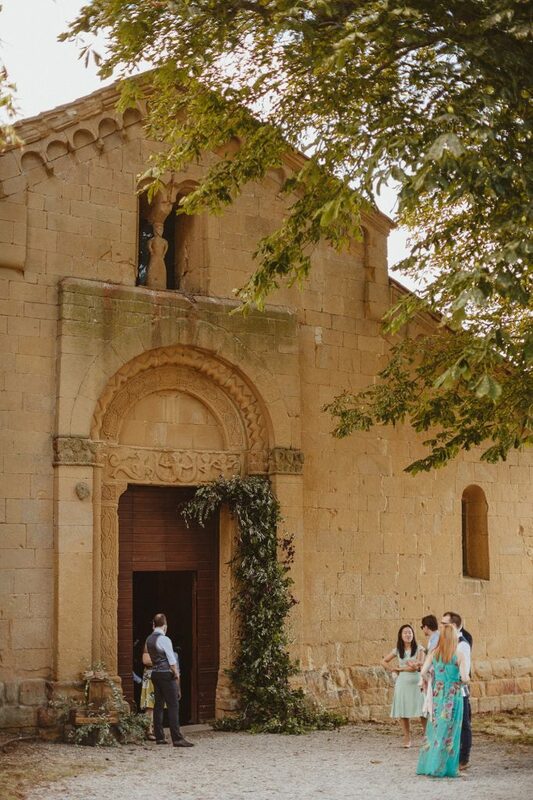 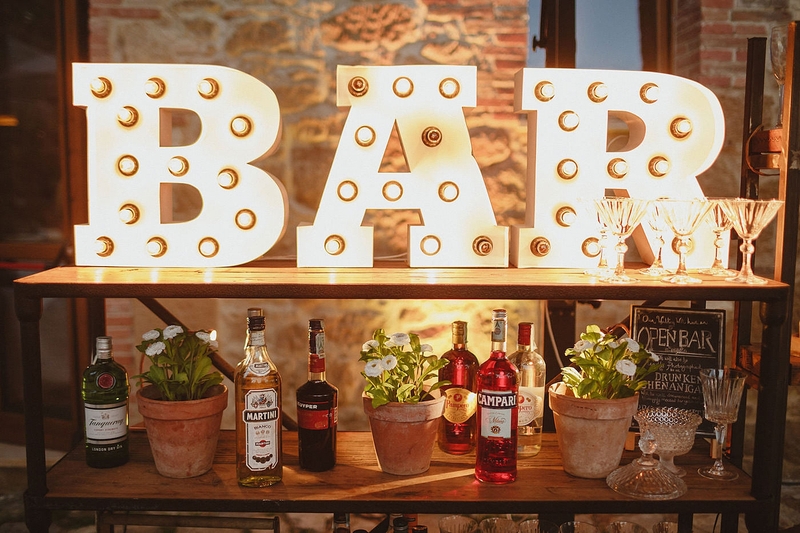 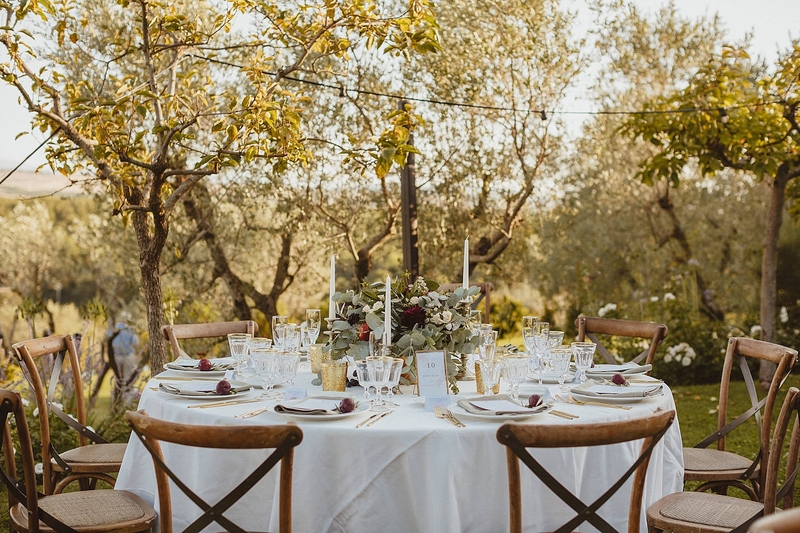 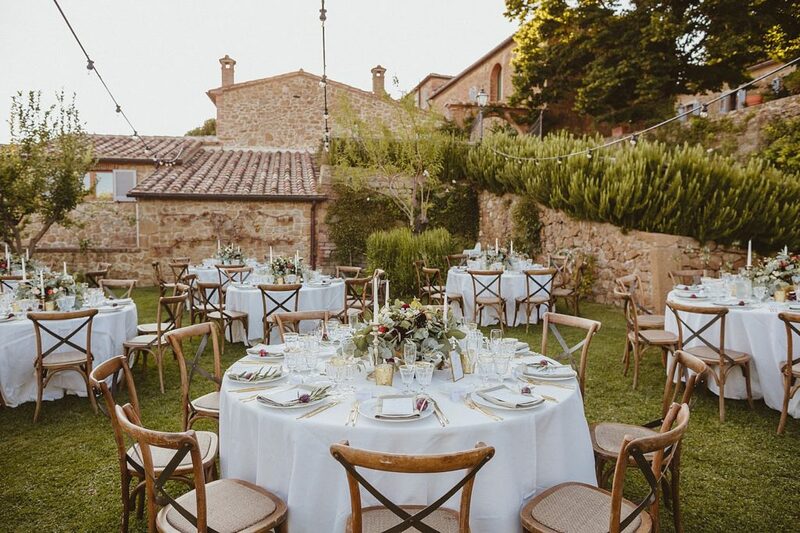 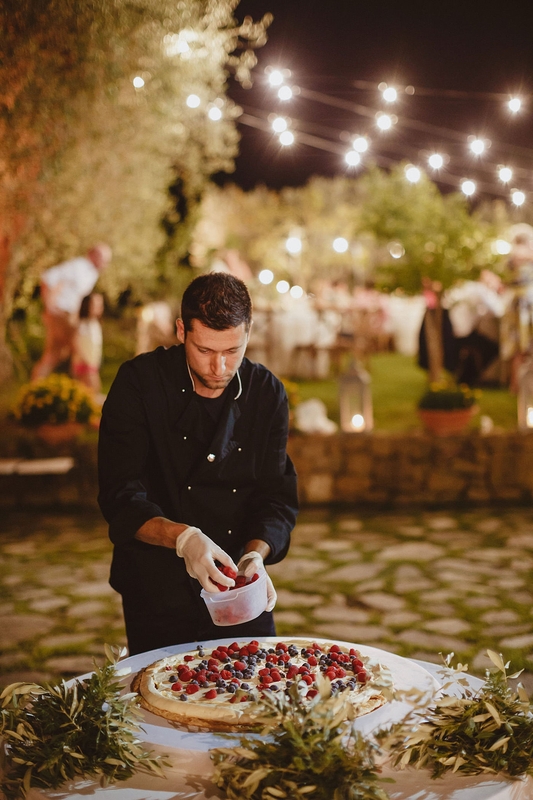 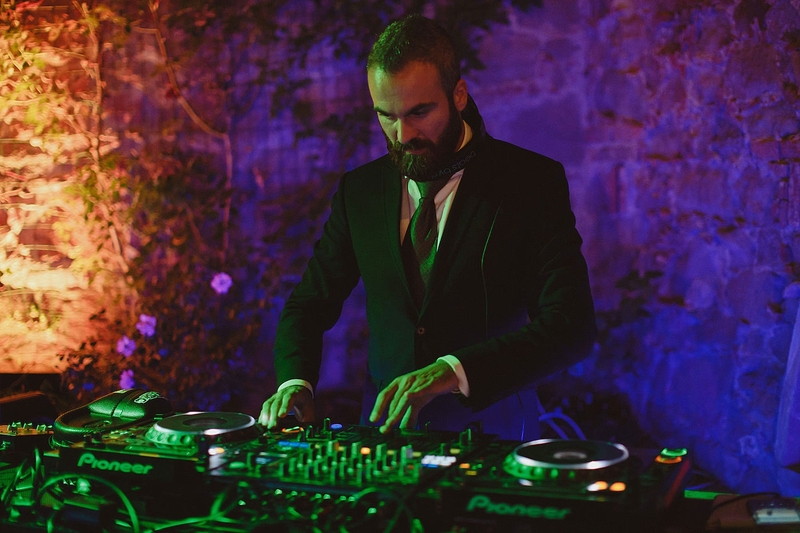 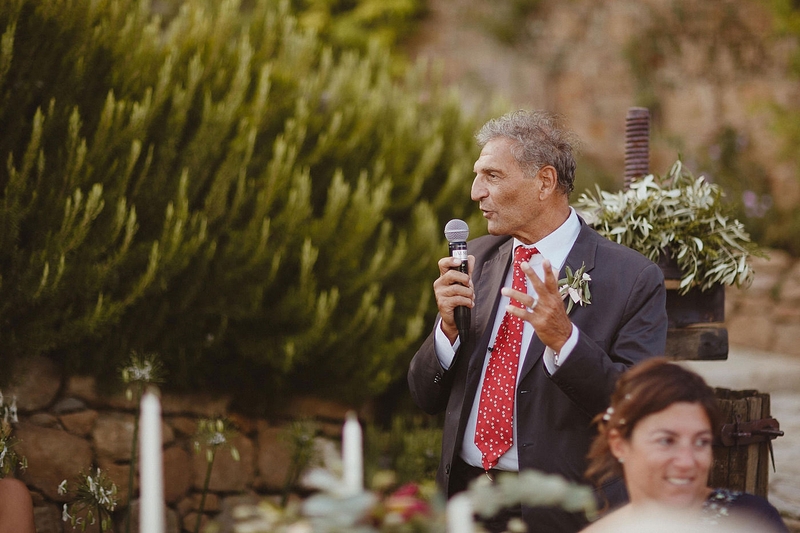 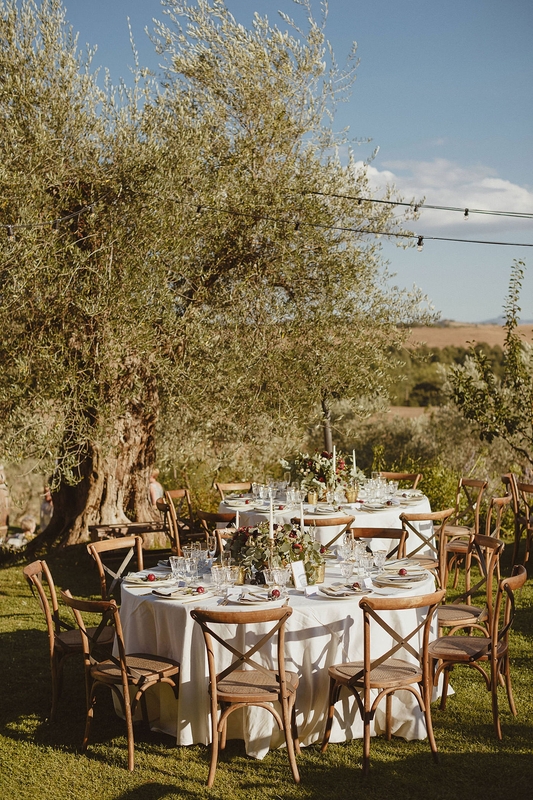 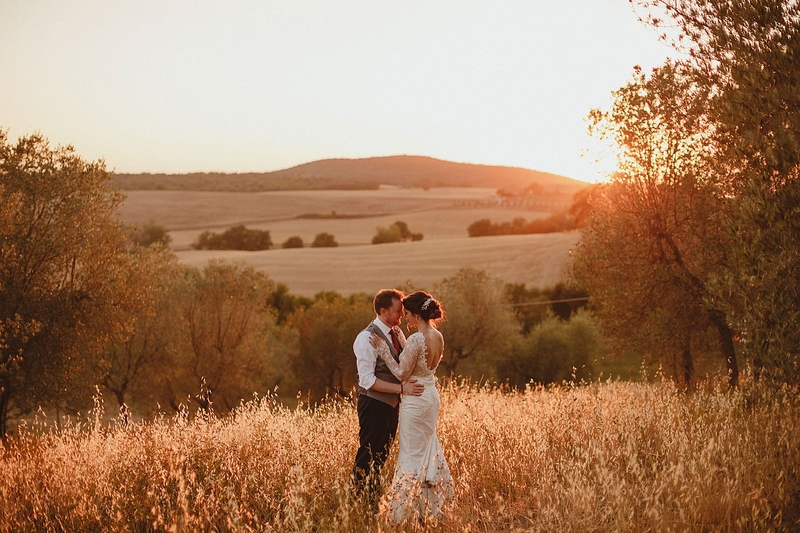 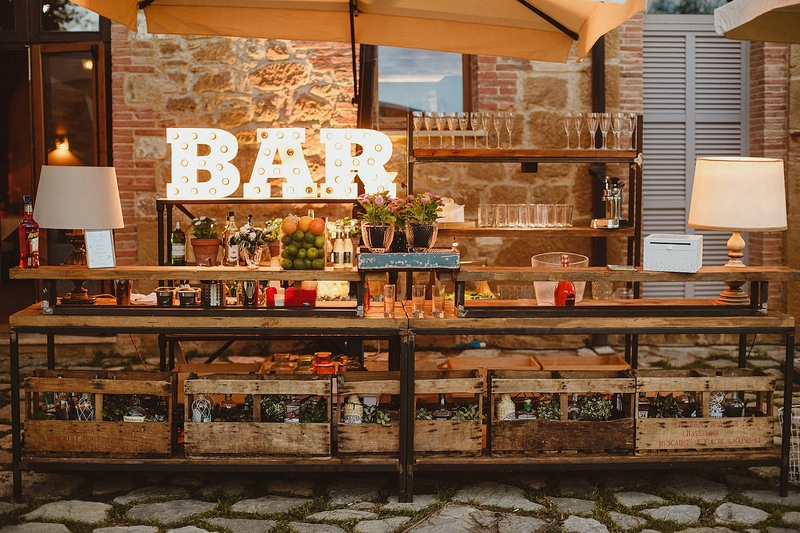 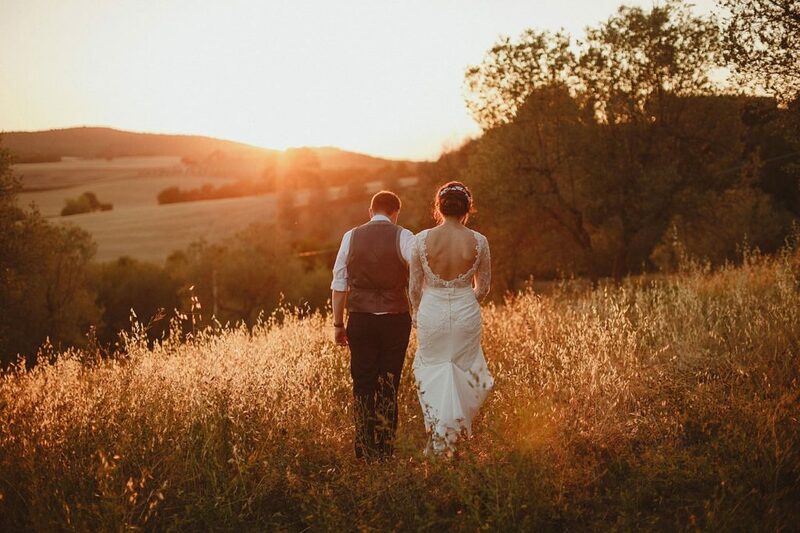 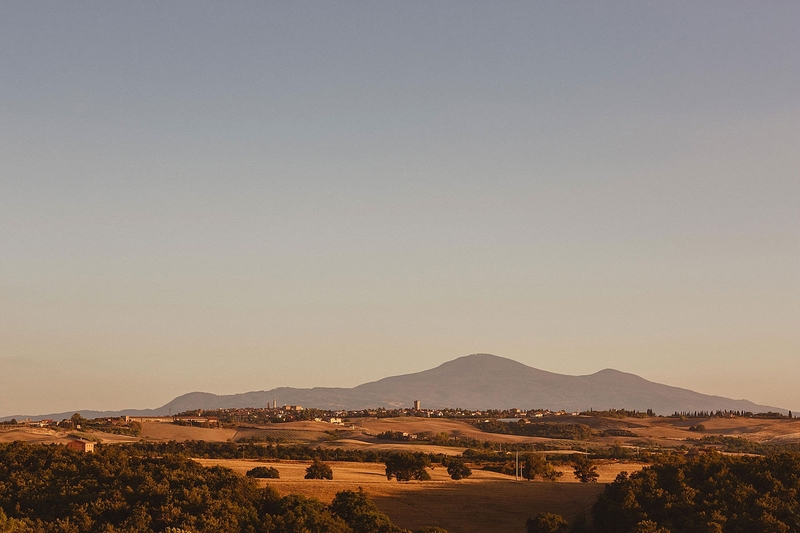 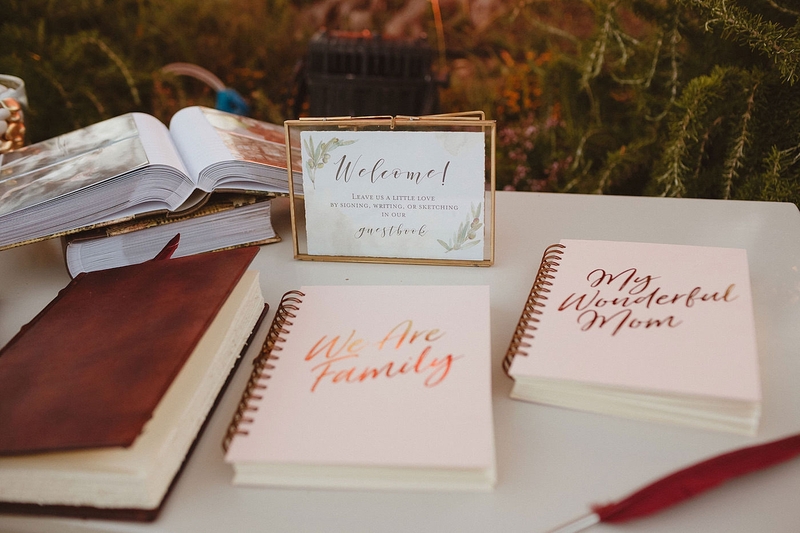 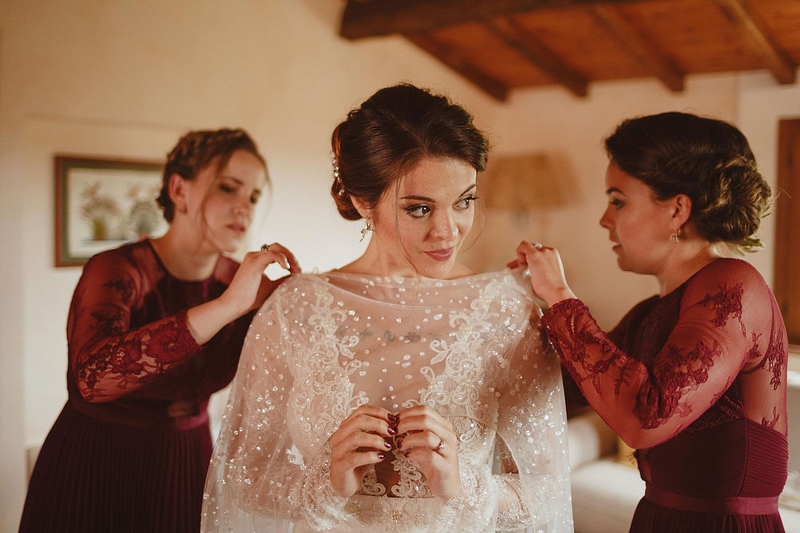 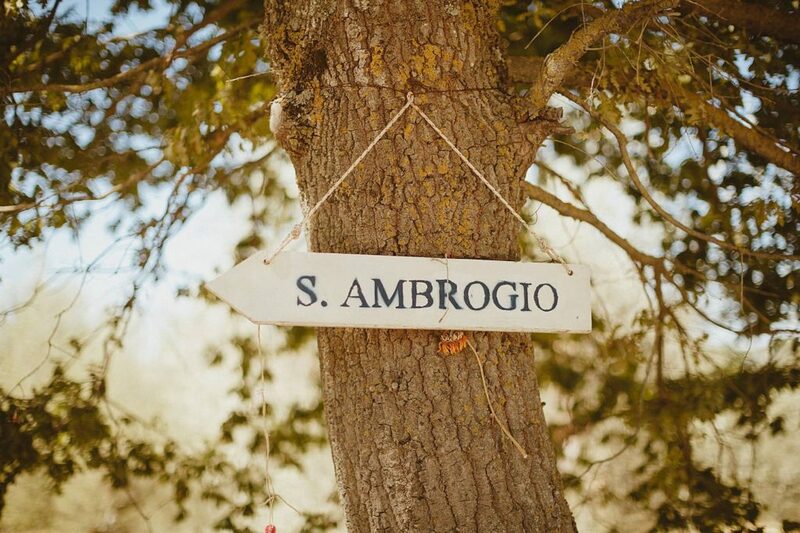 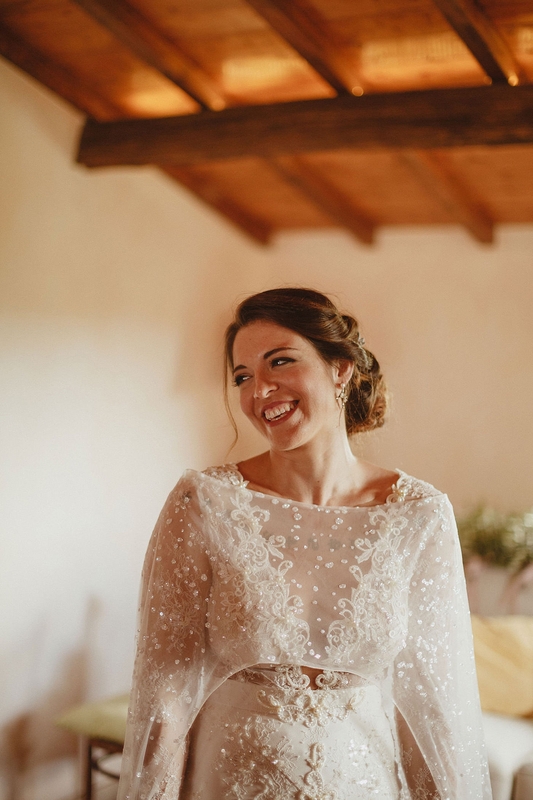 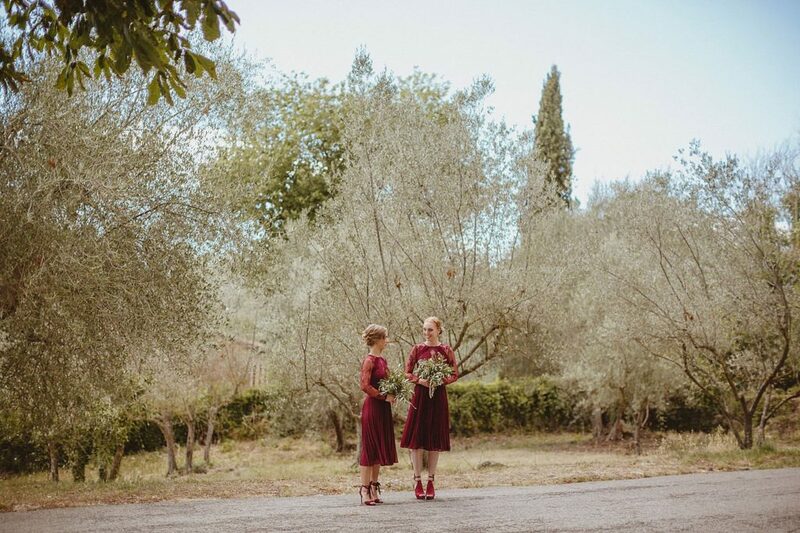 Their reception was held at Borgo Sant’Ambrogio – perched on a beautiful hill overlooking the whole Val D’Orcia countryside, this venue served as the perfect backdrop for their summer reception. 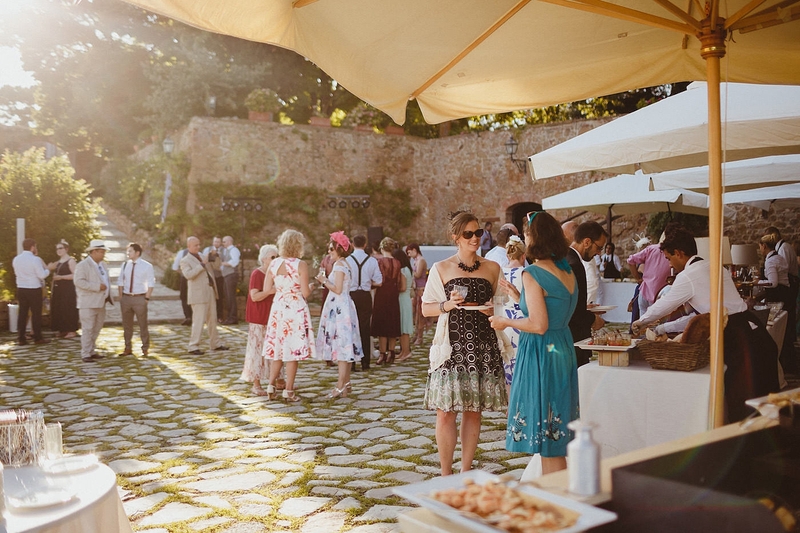 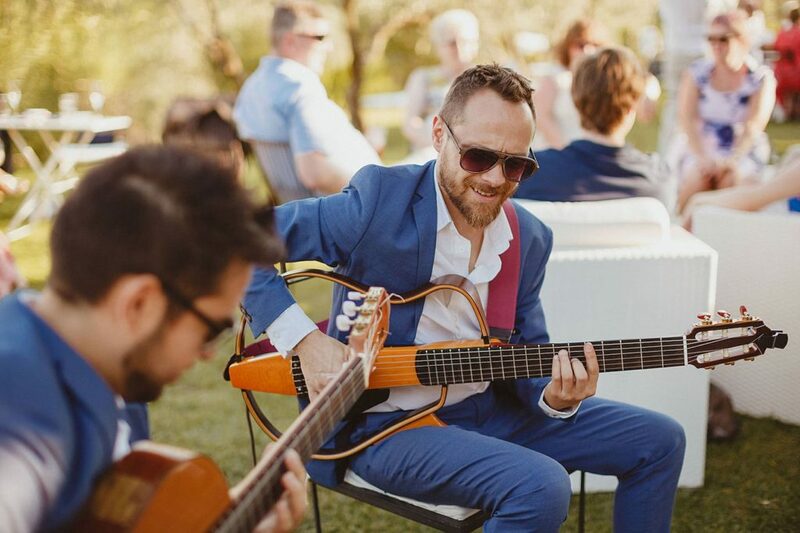 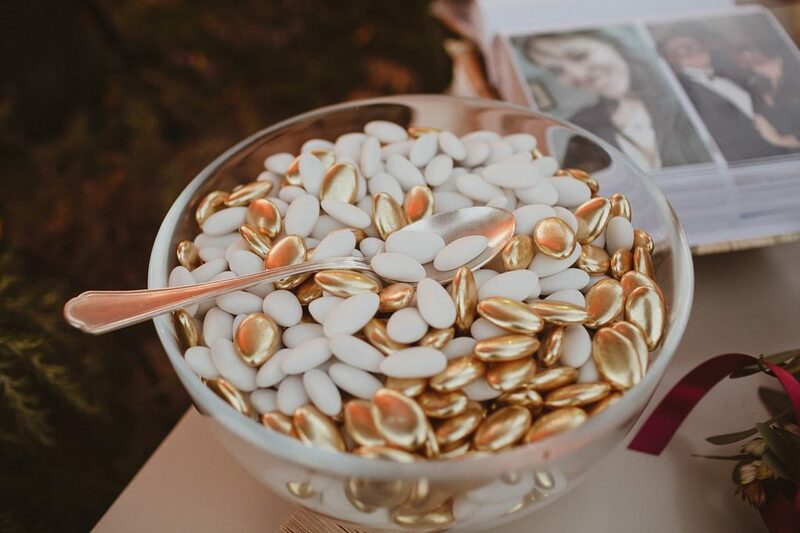 Guests were welcome by a rich traditional buffet of Italian antipasti and welcome drinks with the help of Lincei Catering, live guitarists by Alma Project, and an al fresco dinner at sunset. 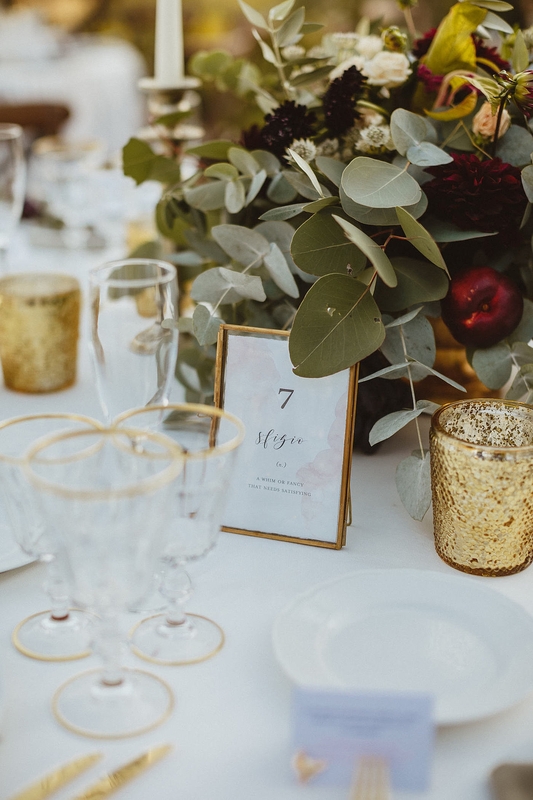 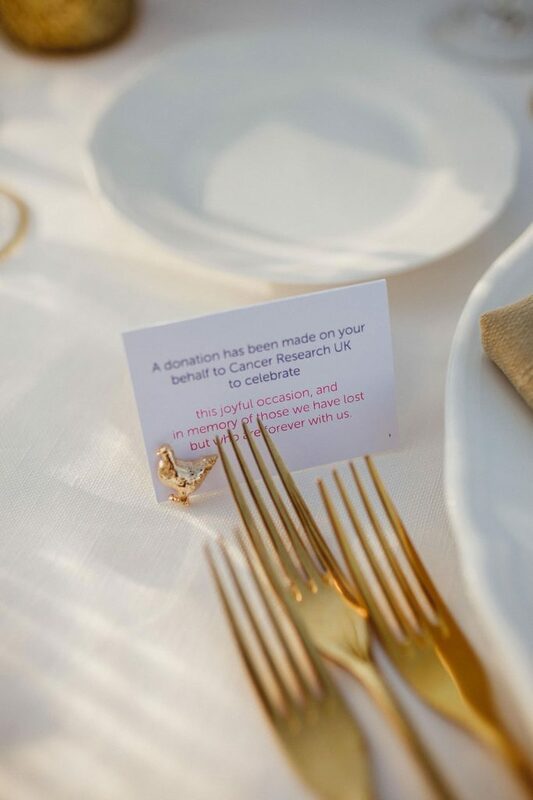 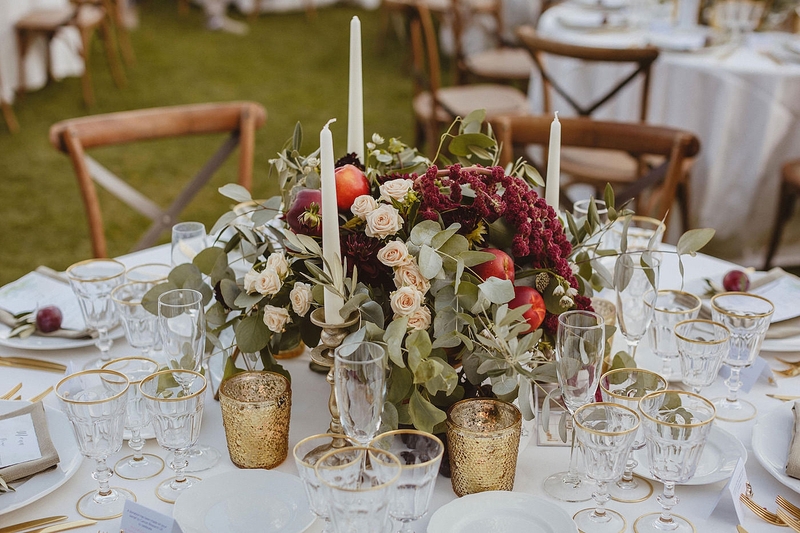 Each table was decorated with rich oxblood red & blush flowers and candles, delicate metallic frames with bespoke table names designed by Shhh My Darling (which James and Valentina opted to be beautiful Italian words with their meanings), gold tea lights, individual menus and plums & olive branches on each plates. 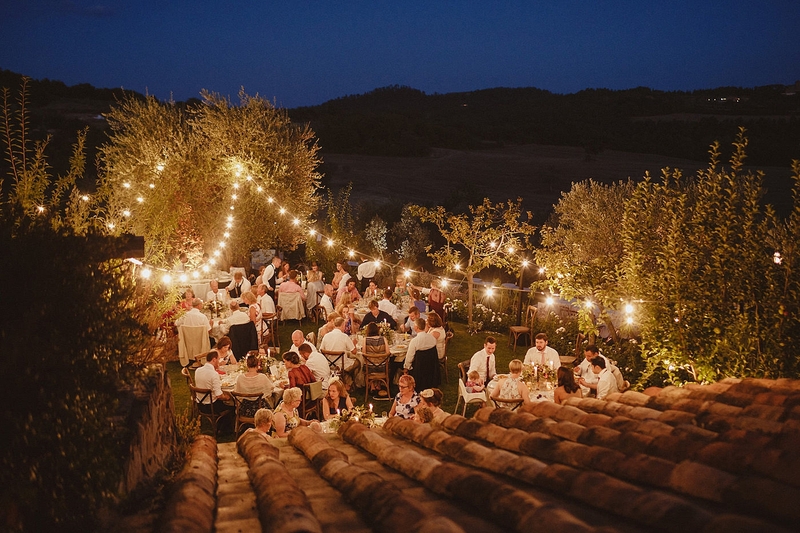 Above the dinner tables, we chose to have crepuscular festoon lighting to light up the whole area – romantic and fairytale-y. 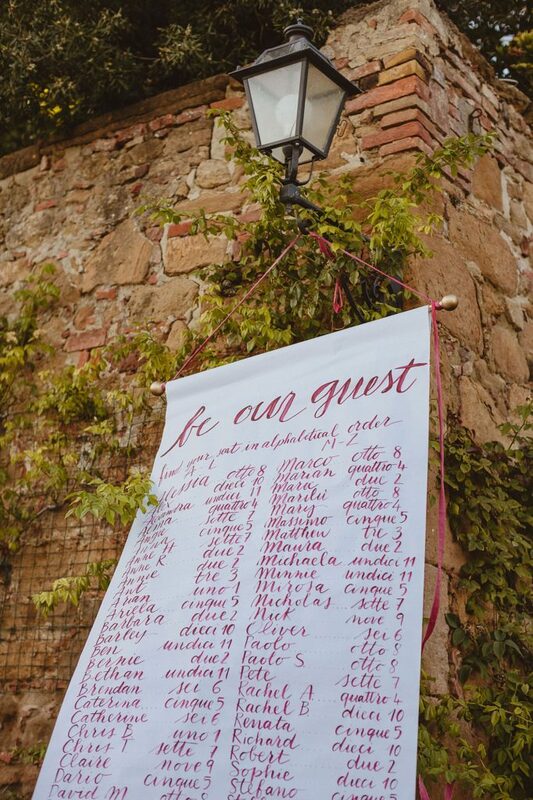 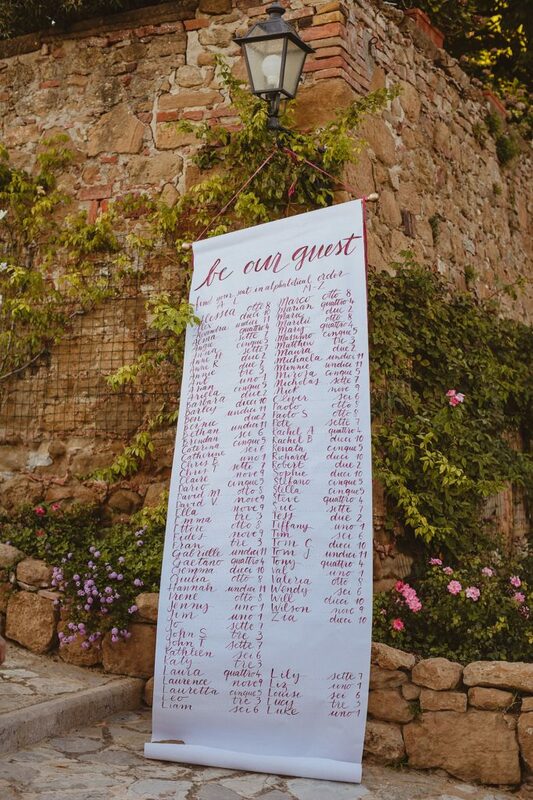 For the guests to find their table, Shhh My Darling designed a stunning paper scroll with hand scripted guest names and their table number, which we hanged off a wall at the entrance of the reception area. 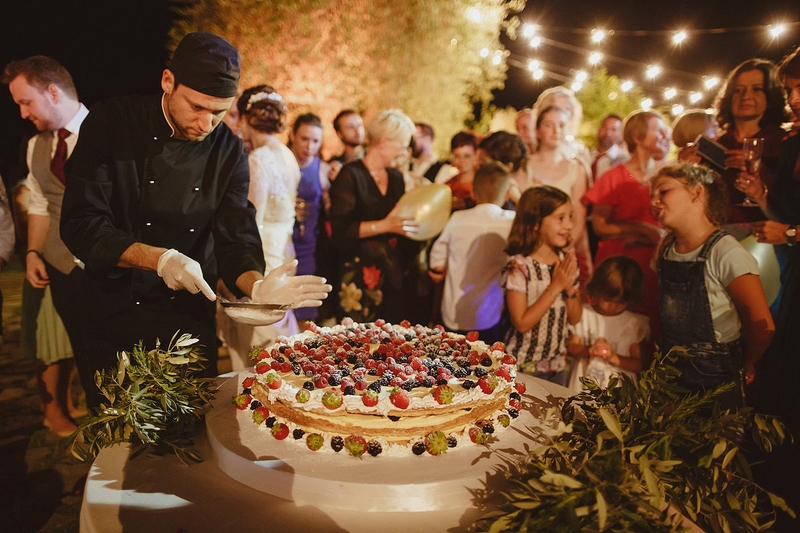 Once dinner was over guests enjoyed a live preparation and cutting of the cake – an Italian mille-foglie, a rich buffet of desserts, chocolate corner, and an open bar with James and Valentina’s choice of drinks. 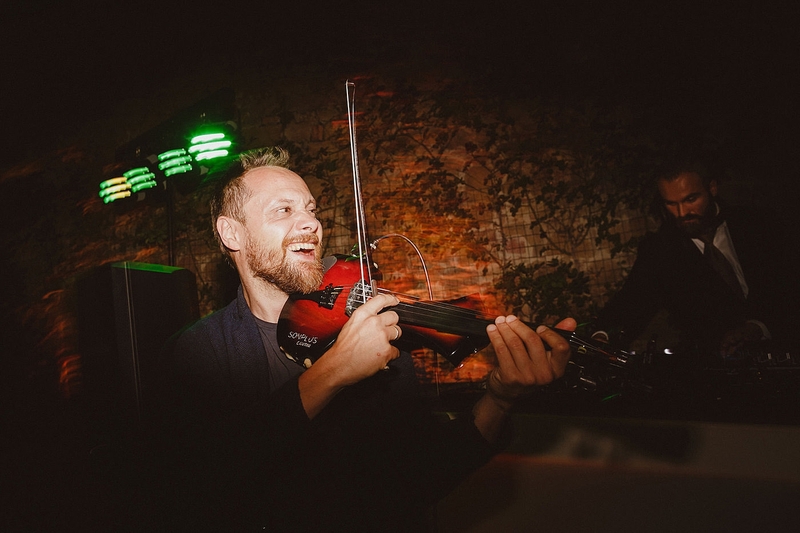 And of course a night of dancing with DJ and electric violin provided by Alma Project. 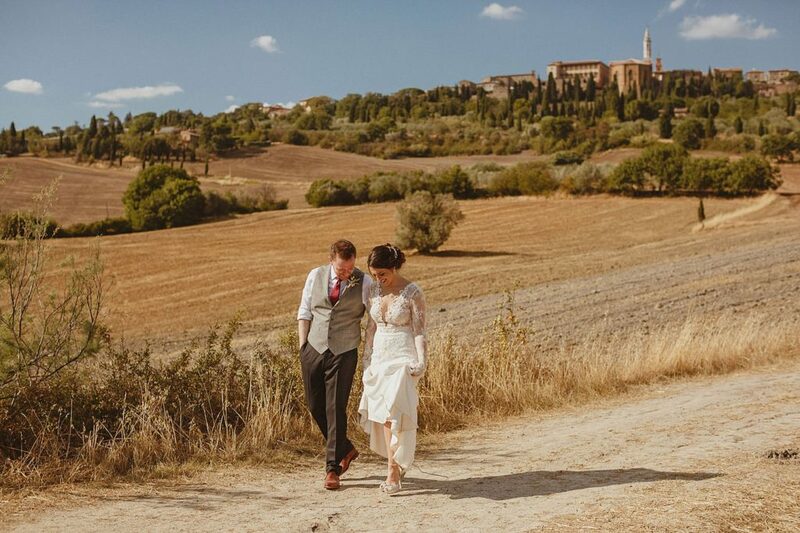 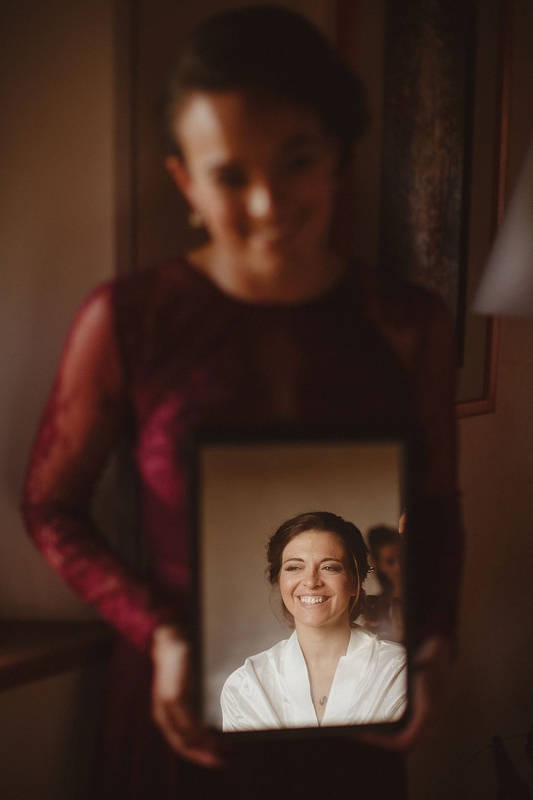 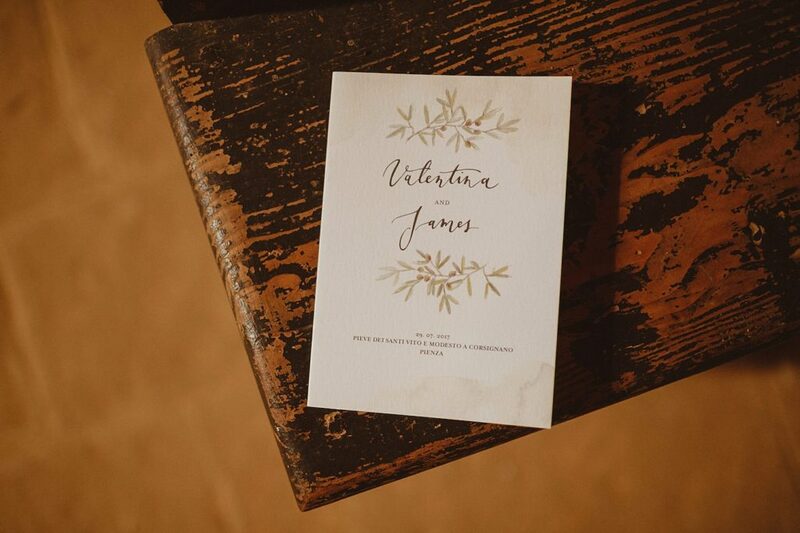 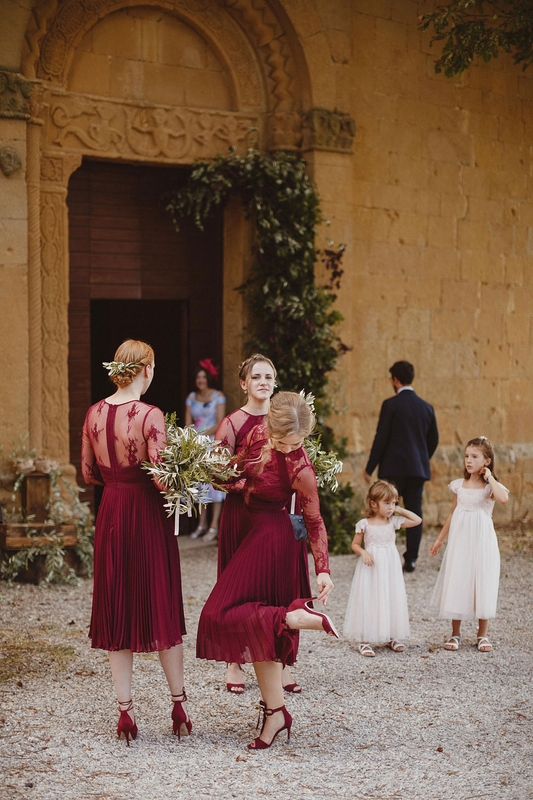 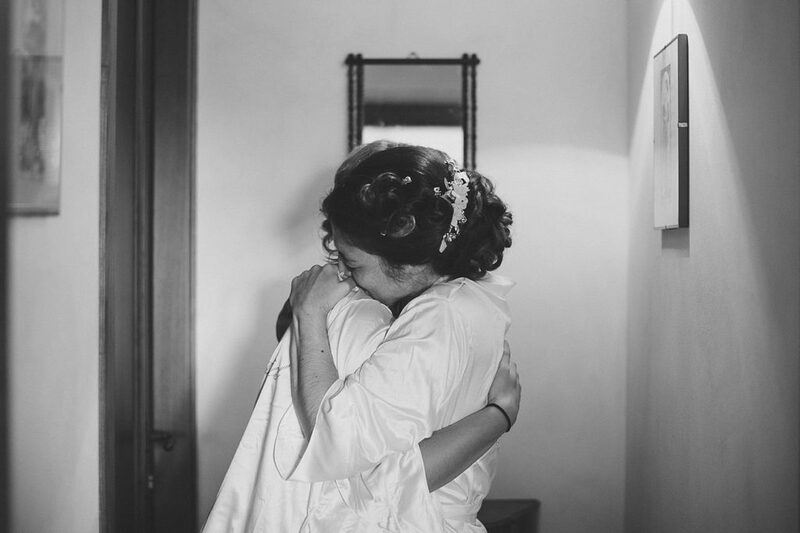 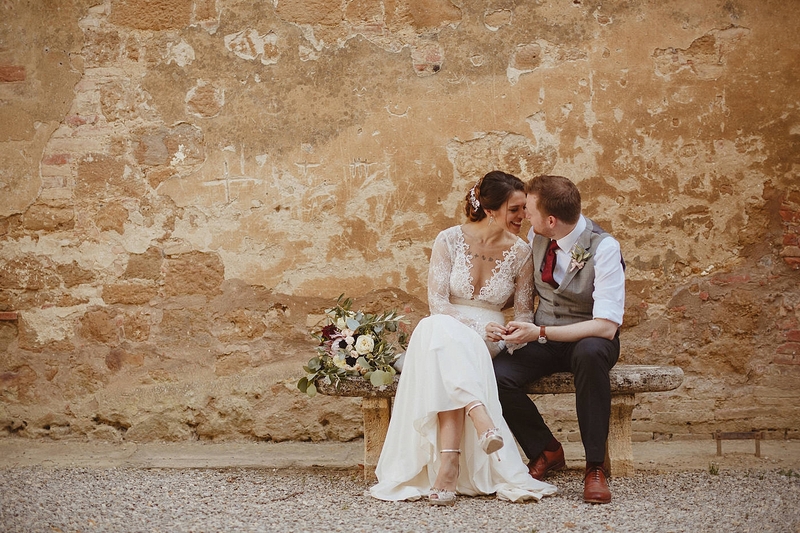 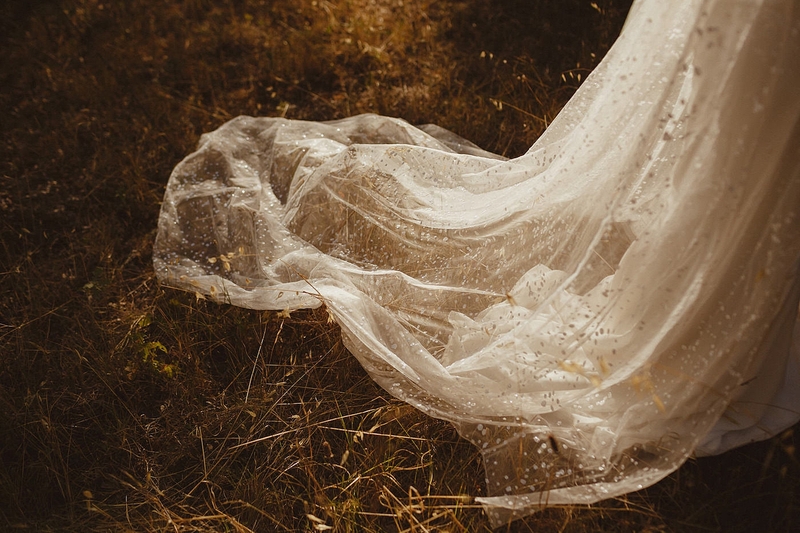 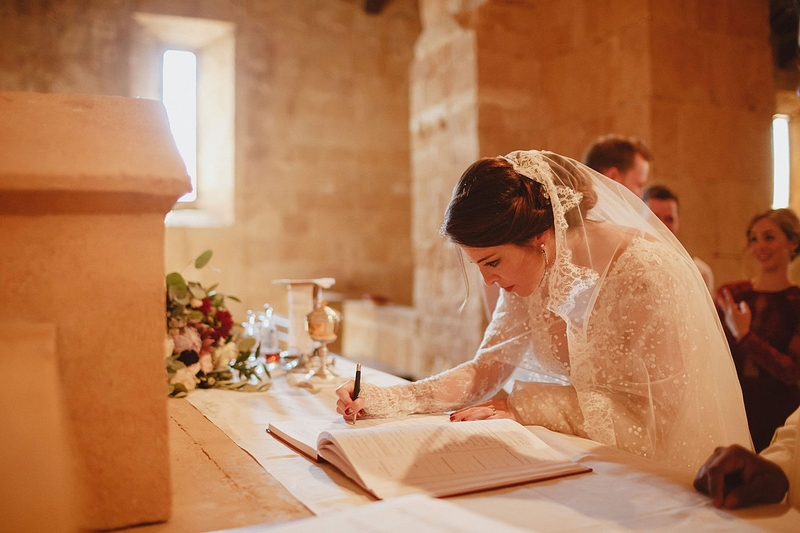 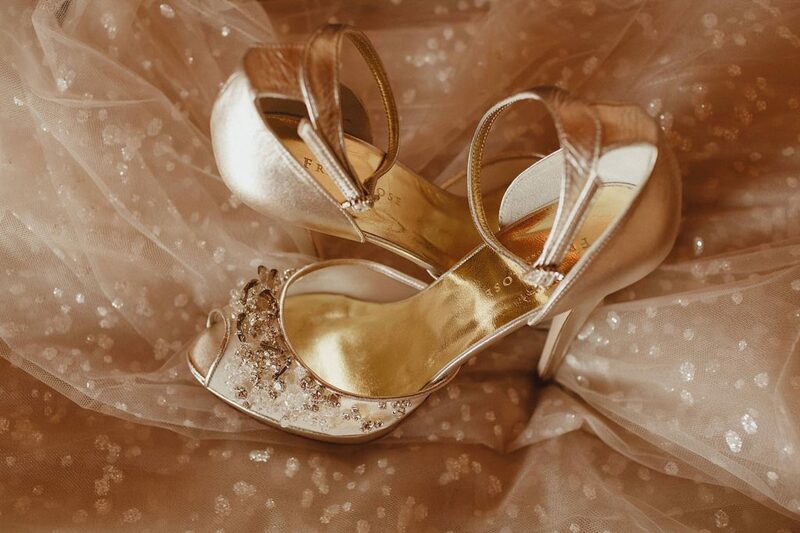 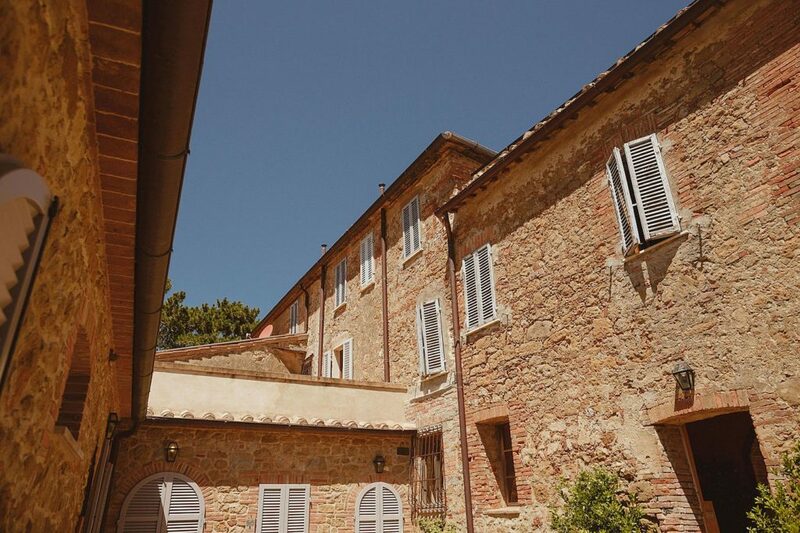 Wedding video in Pienza | Valentina&James from Luigi De Gregorio on Vimeo. 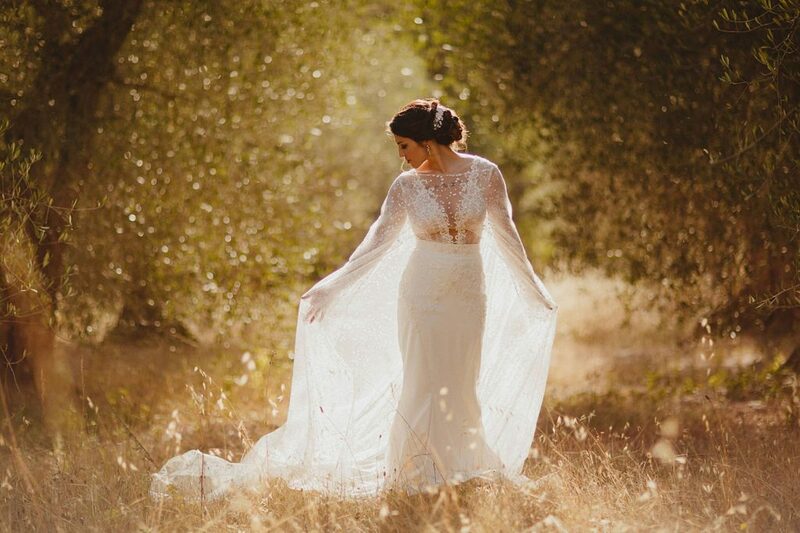 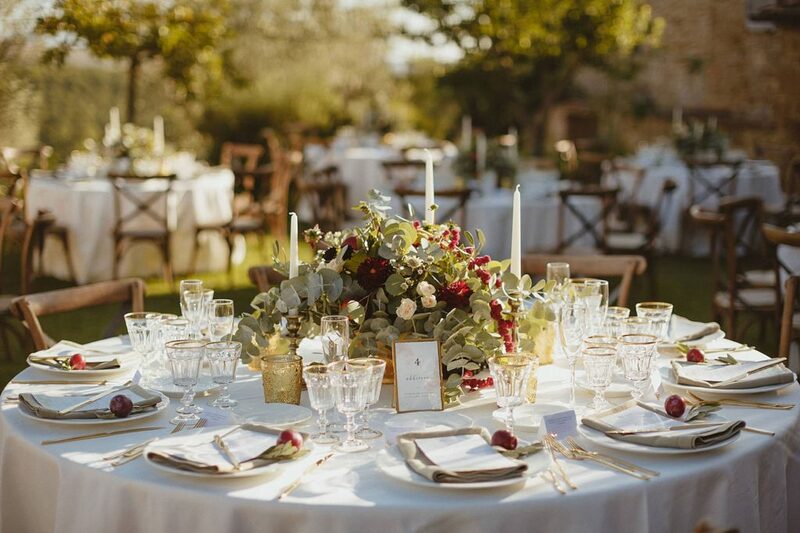 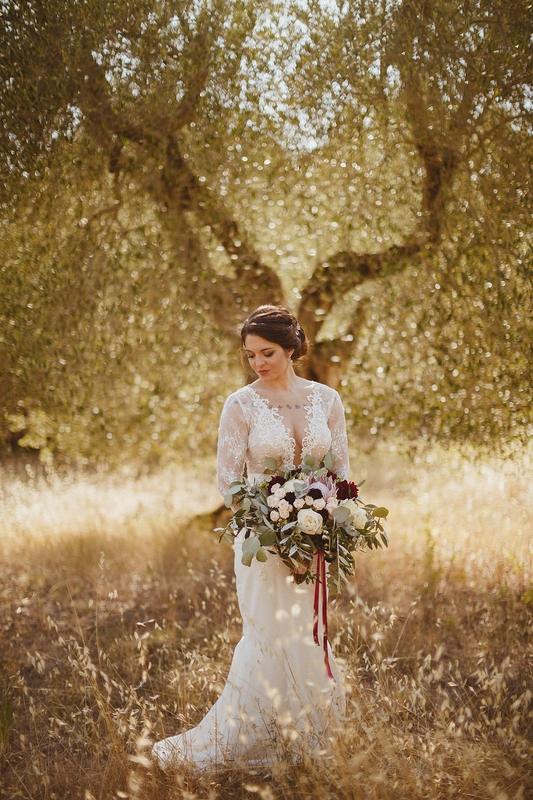 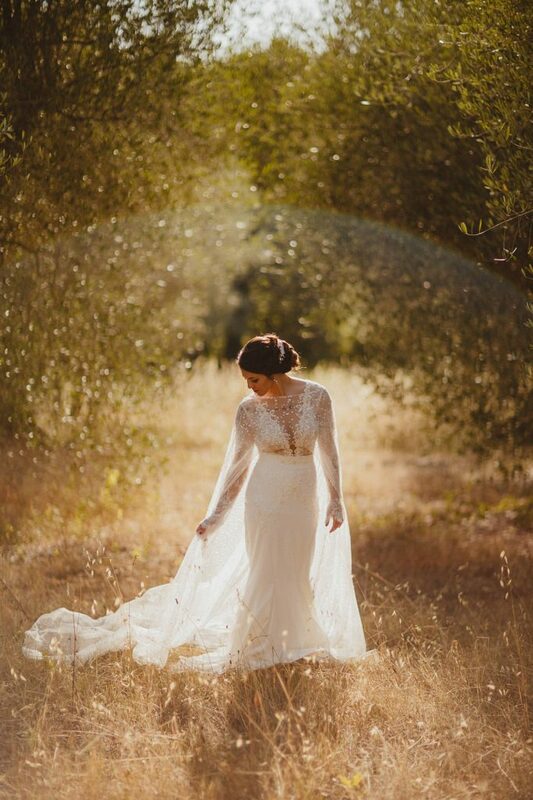 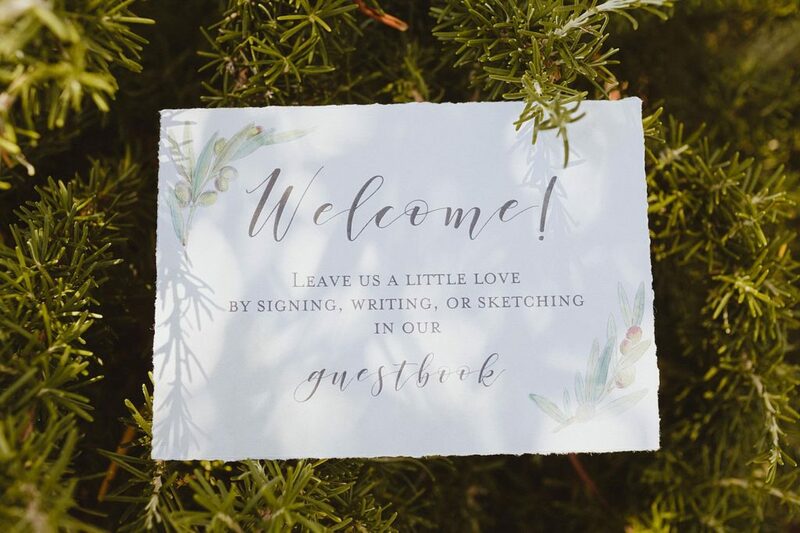 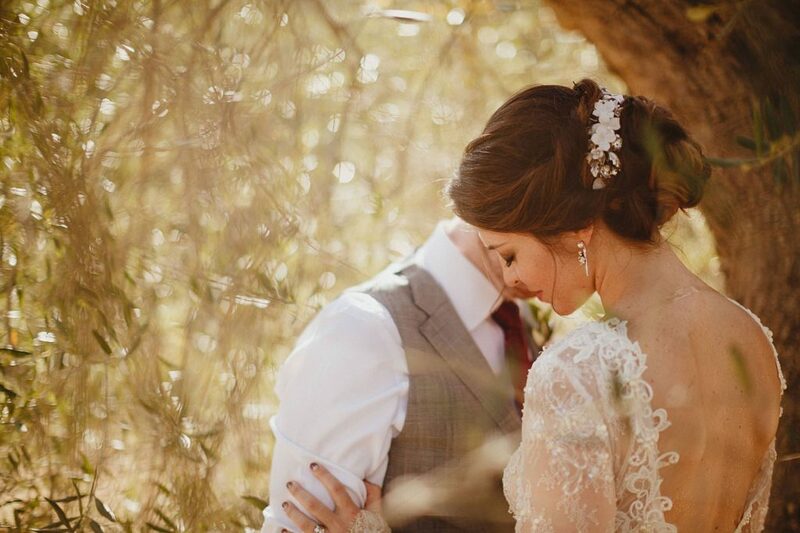 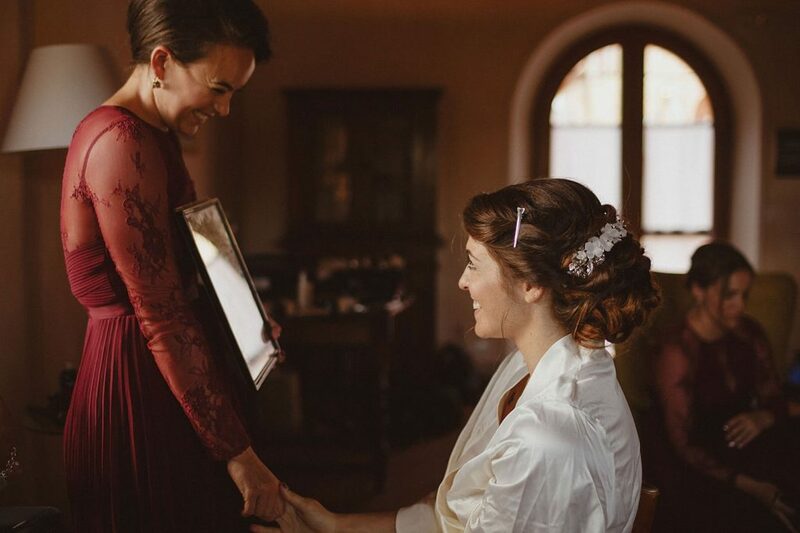 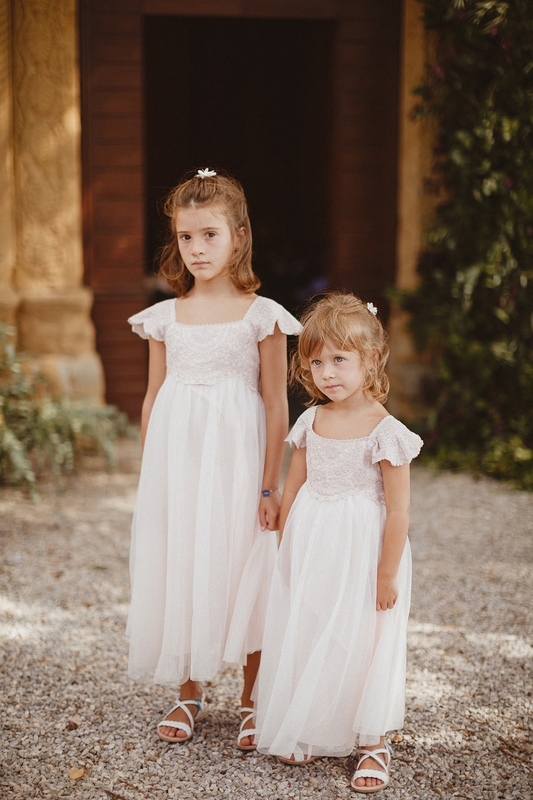 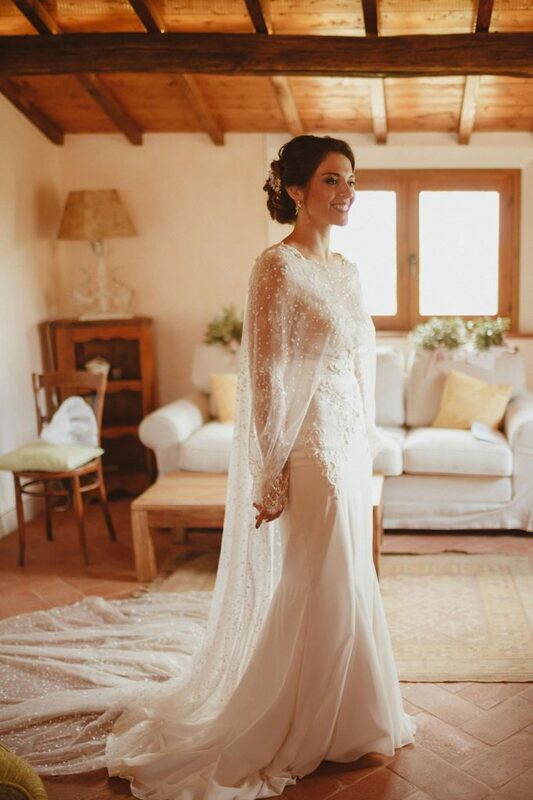 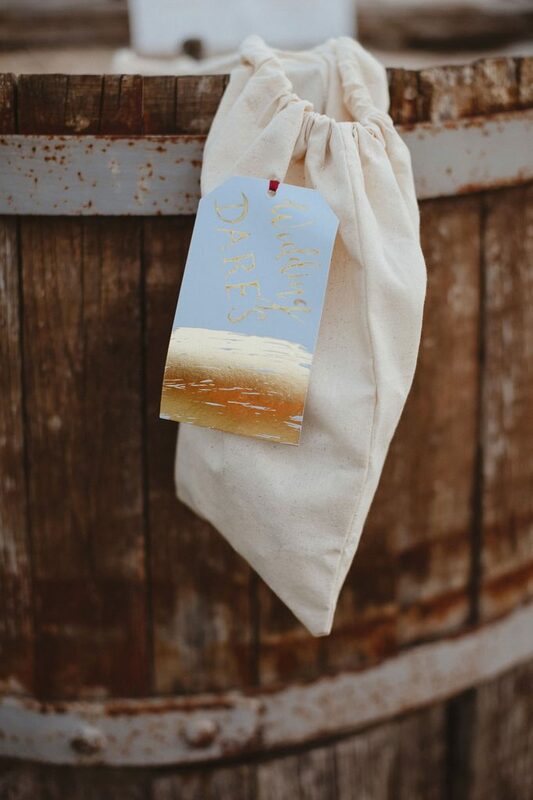 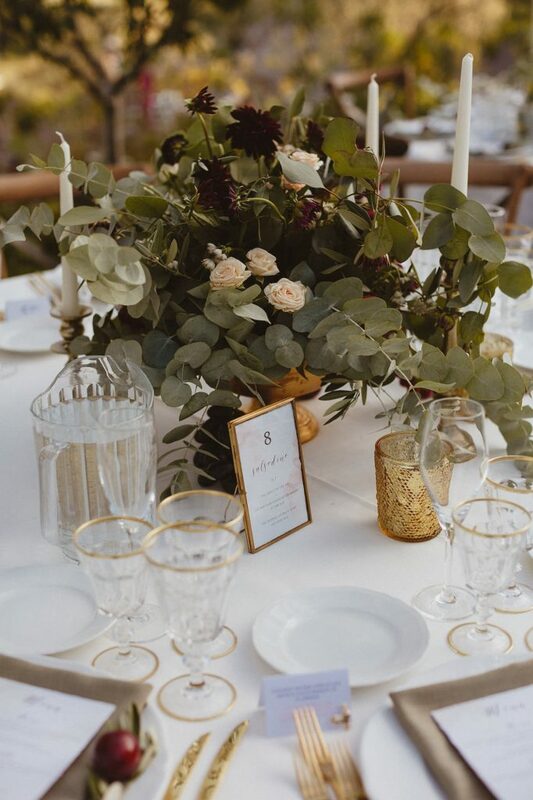 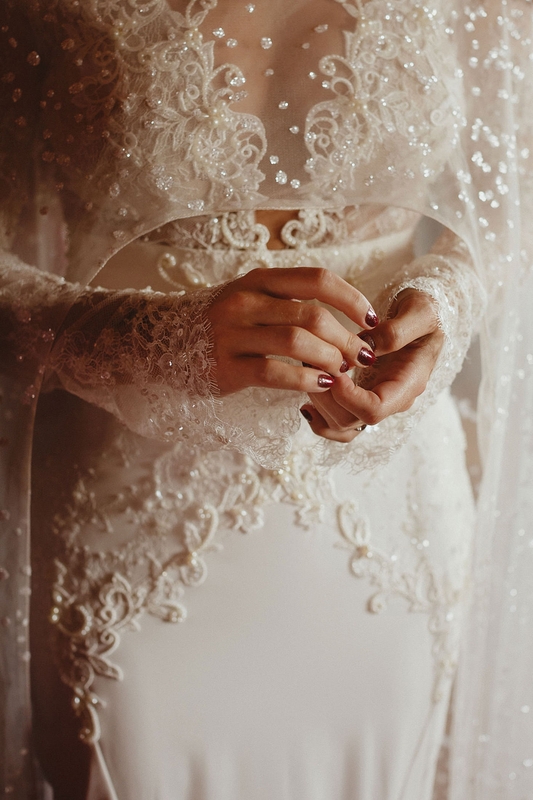 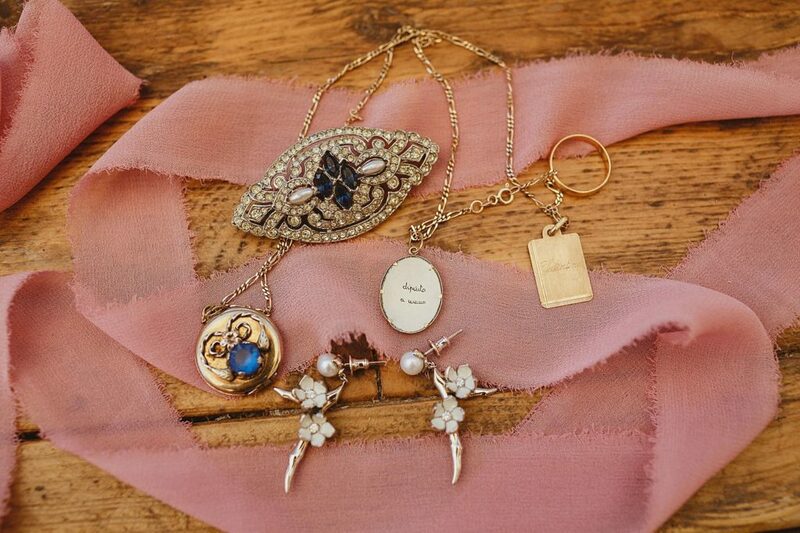 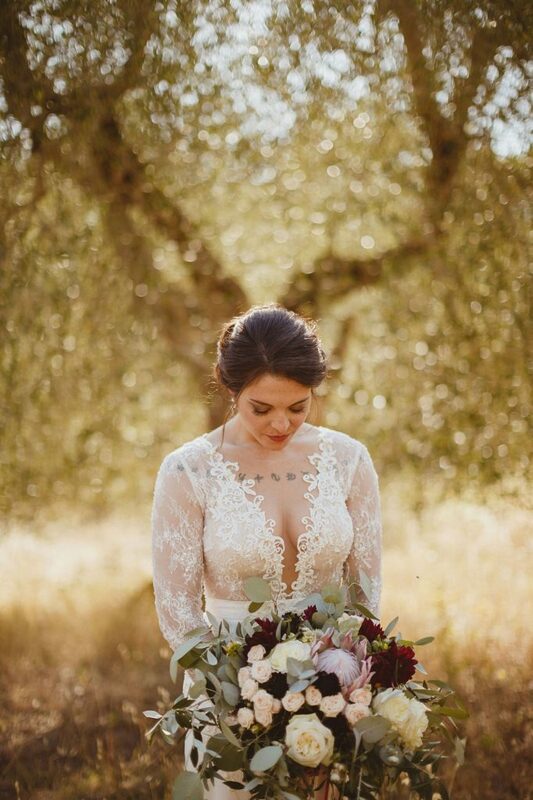 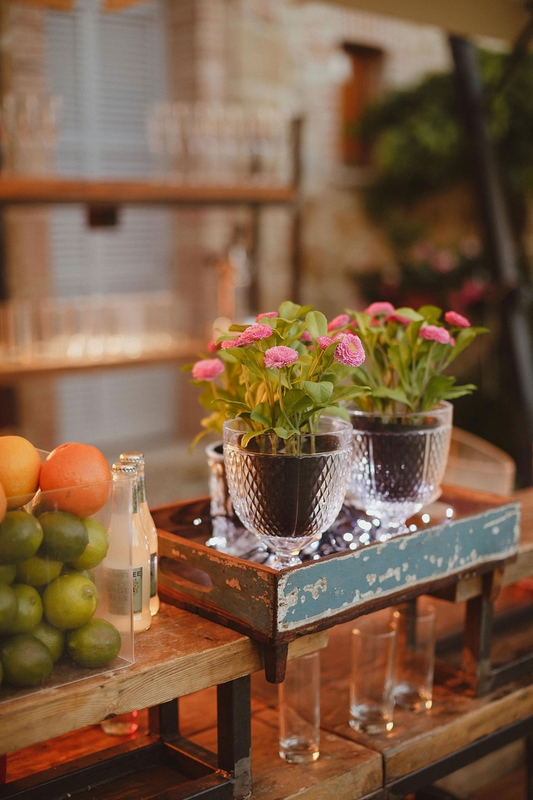 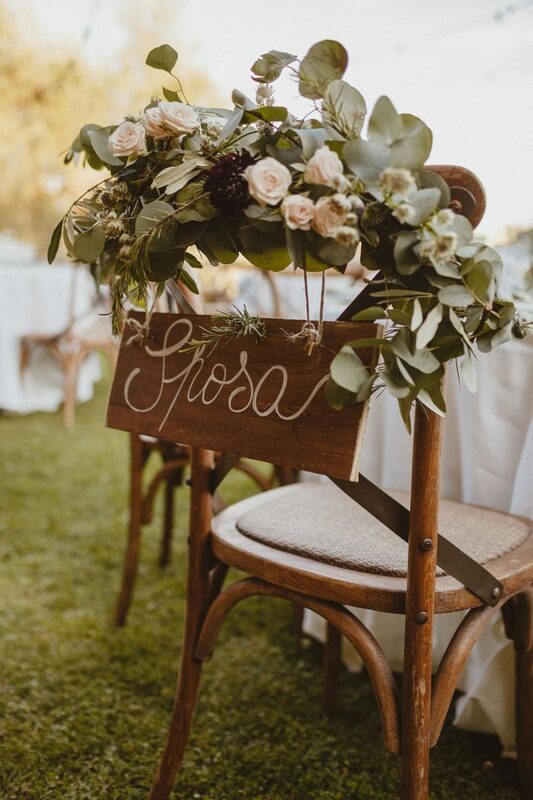 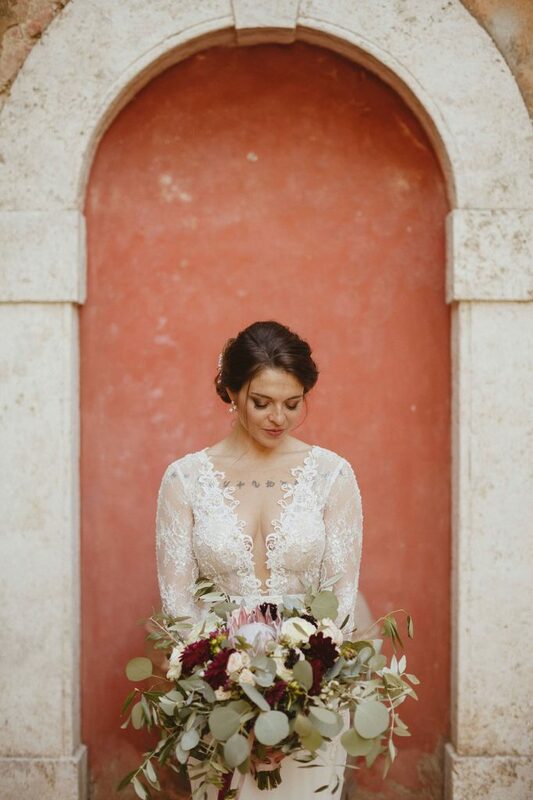 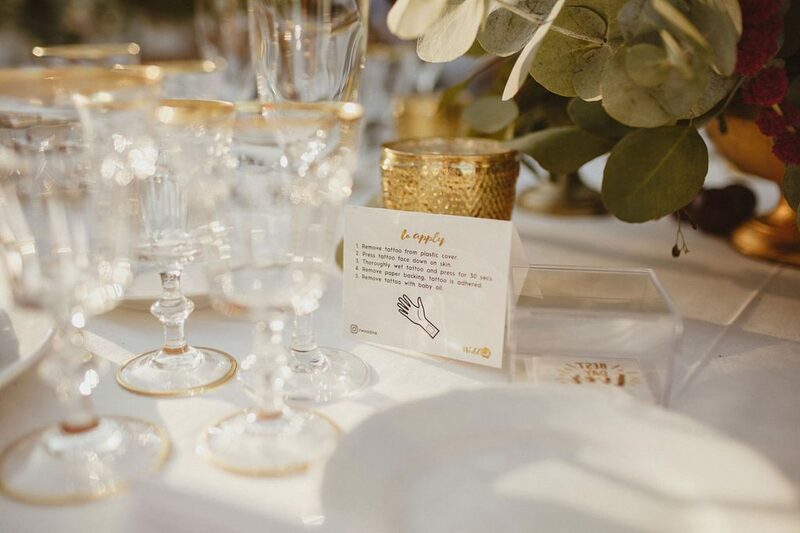 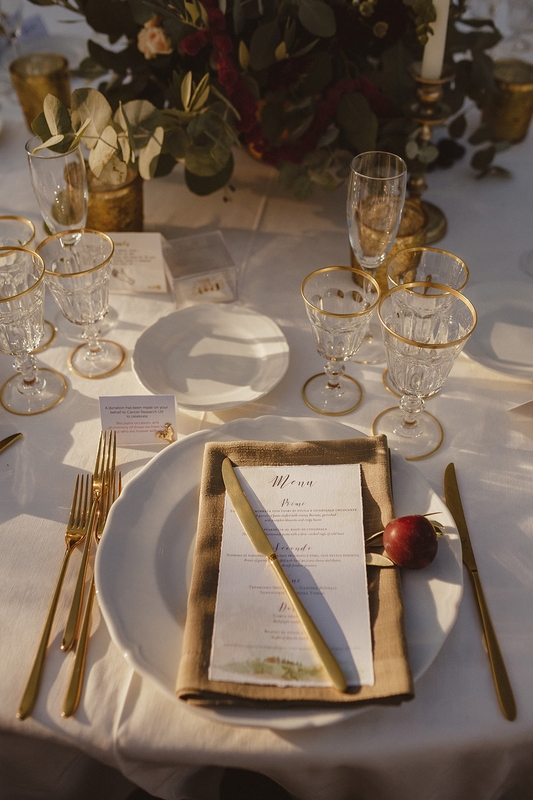 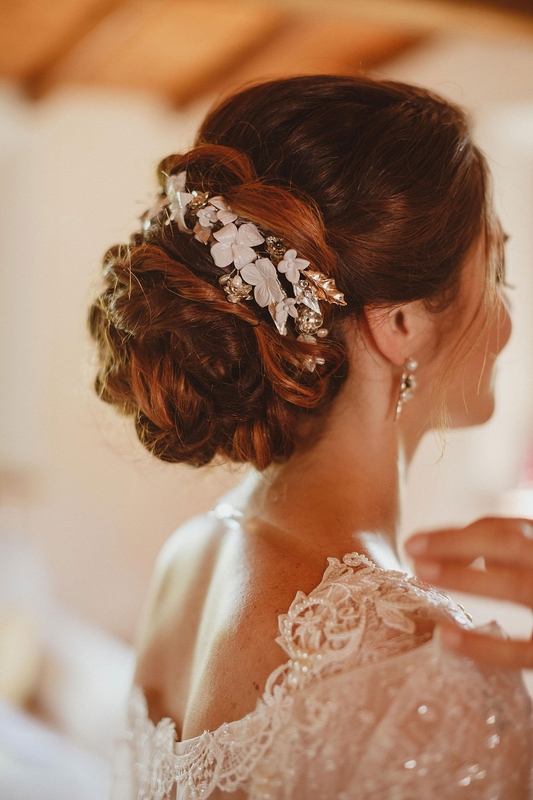 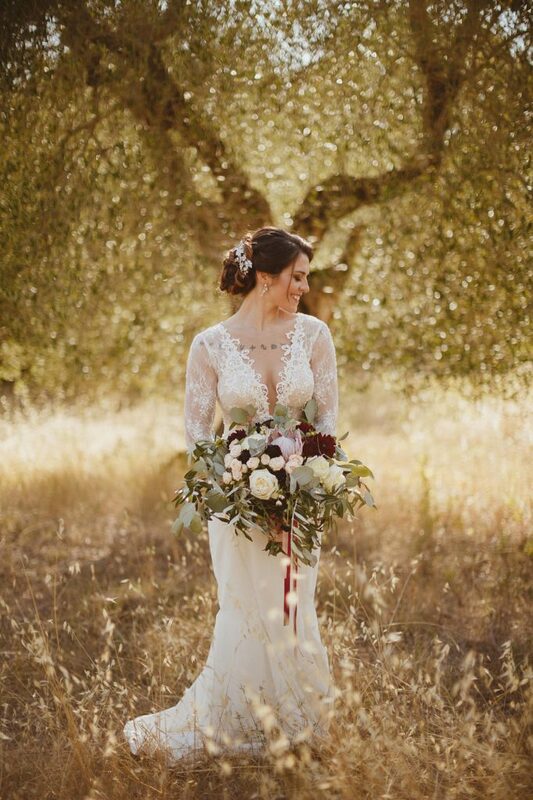 Planning: Elisabetta White Events | Photography: Ed Peers | Venue: Borgo Sant’Ambrogio | Flowers: Flowers Living | Hair & makeup: Lara Navarrini | Videography: Luigi De Gregorio | Stationery: Shhh My Darling | Catering: Lincei Catering | Music: Alma Project | Ribbons: Kate Cullen & Ollie’s Studio.